2597 EP GERMANY (1941) Heinrich von Stephan*. 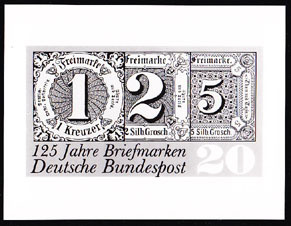 Set of 5 perforated labels in different colors issued for Stamp Day 1941, produced for the German Stamp Collectors Society by Hesshaimer. 3351 EP GERMANY (1955) Hans Sachs*. Photo essay (See Note) of unaccepted design for meistersinger of Nuremberg, one of the "Helpers of Mankind". Scott No B347, Yvert No 101. 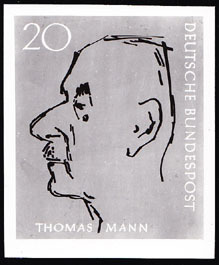 3323 EP GERMANY (1956) Thomas Mann*. Photo essay (See Note) of unaccepted design for Nobel Prize Literature winner. Scott No 746, Yvert No 113. 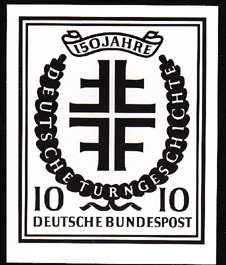 5006 EP GERMANY (1956) IPA emblem*. 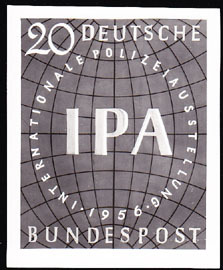 Photo essay (See Note) of unaccepted design for International Police Show, Essen. Scott No 751, Yvert No 116. 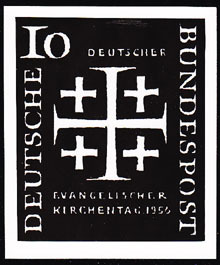 5126 EP GERMANY (1956) Synod emblem*. 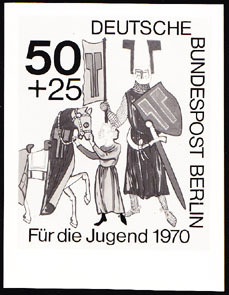 Photo essay (See Note) of unaccepted design for Meeting of German Evangelical Synod of Protestants. Scott No 744, Yvert No 109. Very similar to final design - position of lettering slightly changed. 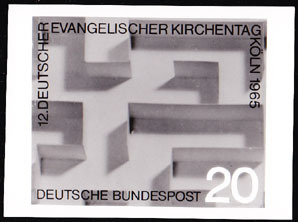 5789 EP GERMANY (1956) Crosses*. Photo essay (See Note) of unaccepted design for Memorial of Germans who died in WWII and Society for Care of Military Cemeteries. Scott No 753, Yvert No 124. 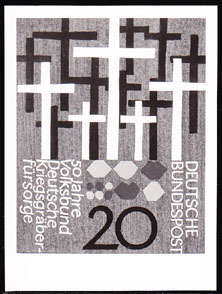 5790 EP GERMANY (1956) Crosses*. Photo essay (See Note) of unaccepted design for Memorial of Germans who died in WWII and Society for Care of Military Cemeteries. Scott No 753, Yvert No 124. 3352 EP GERMANY (1957) Stagecoach*. 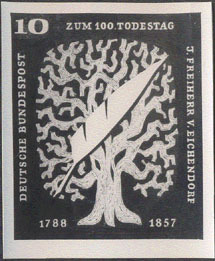 Photo essay (See Note) of unaccepted design for death centenary of Joseph von Eichendorff, romantic poet. Scott No 779, Yvert No 151. 3523 EP GERMANY (1957) European robin*. Photo essay (See Note) for unaccepted design of animal and plant protection series. Scott No 774, Yvert No 147. 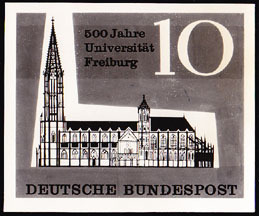 3930 EP GERMANY (1957) Freiburg University*. Photo essay (See Note) of unaccepted design for 500th year of founding.. Scott No 766, Yvert No 135. 3931 EP GERMANY (1957) Liebig Laboratory*. Photo essay (See Note) of unaccepted design for Ludwig University in Giessen. Scott No 768, Yvert No 137. 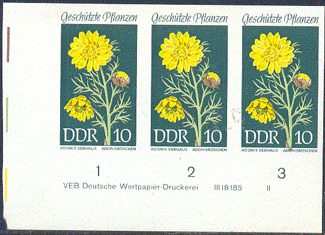 4140 EP GERMANY (1957) Flower*. Photo essay (See Note) of unaccepted design for animal & plant protection series. Scott No 773, Yvert No 146. 4141 EP GERMANY (1957) Water lily*. Photo essay (See Note) of unaccepted design for animal & plant protection series. Scott No 773, Yvert No 146. 4542 EP GERMANY (1957) Spark gap transmitter*. 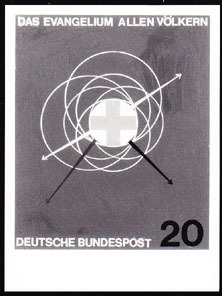 Photo essay (See Note) of unaccepted design for 100th anniversary of birth of Heinrich Hertz. Scott No 762, Yvert No 131. 4552 EP GERMANY (1957) Globe*. Photo essay (See Note) of unaccepted design for International Letter Writing Week. Scott No 775, Yvert No 148. 4751 EP GERMANY (1957) Young miner*. Photo essay (See Note) of unaccepted design for mining series benefiting welfare organizations. Scott No B356, Yvert No 142. 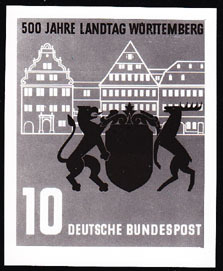 4931 EP GERMANY (1957) Wurttemberg Arms*. Assembly hall*. 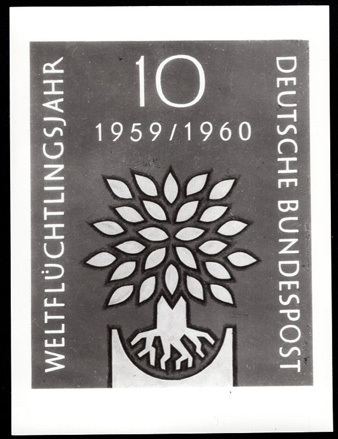 Photo essay (See Note) of unaccepted design for 500th anniversary of Wurttemberg Landtag. Scott No 778, Yvert No 150. 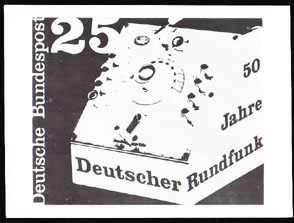 5054 EP GERMANY (1957) Cathode ray tube*. Photo essay (See Note) of unaccepted design for television industry. Scott No 770, Yvert No 139. 5055 EP GERMANY (1957) Antique TV and antennae*. Photo essay (See Note) of unaccepted design for television industry. Scott No 770, Yvert No 139. 5056 EP GERMANY (1957) TV Camera*. Ballet dancer*. Photo essay (See Note) of unaccepted design for television industry. Scott No 770, Yvert No 139. 5129 EP GERMANY (1957) Bishop*. 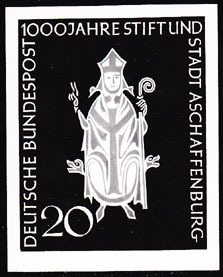 Photo essay (See Note) of unaccepted design for 100th anniversary of founding of abbey and town of Aschaffenburg. Scott No 765, Yvert No 134. 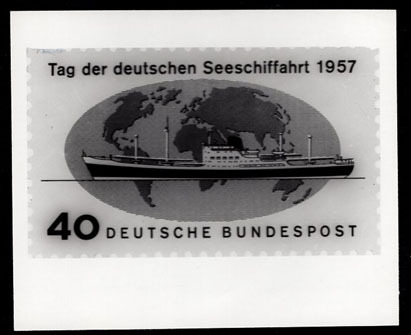 5242 EP GERMANY (1957) Cargo ship*. Photo essay (See Note) of unaccepted design for Merchant Marine Day. Scott No 767, Yvert No 136. 6423 EP GERMANY (1957) Tree*. Feather*. 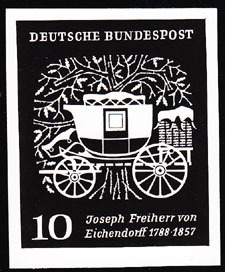 Archive photo (See Note) of unaccepted design for J. Freiherr Eichendorf centennial. Scott No 779, Yvert No 151. Measures 90 x 110 mm. 7920 EP GERMANY (1957) Hands holding sprig, bowl of fruits*. 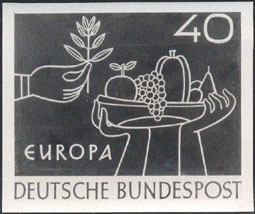 Archive photo (See Note) of unaccepted design for Europa stamp. Measures 120 x 90 cm. Scott No 772, Yvert No 141. 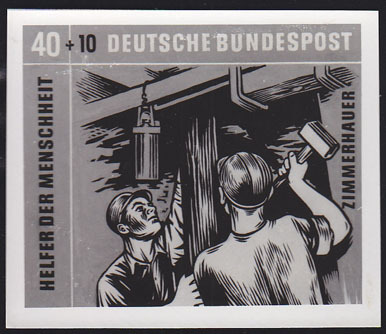 10722 EP GERMANY (1957) Miners shoring up ceiling*. Photo essay (See Note) of unaccepted design for mining series benefiting welfare organizations. Scott No B359, Yvert No 145. 3018 EP GERMANY (1958) Farmer scything wheat*. Photo essay (See Note) for unaccepted design to benefit welfare organizations. Scott No B365, Yvert No 171. 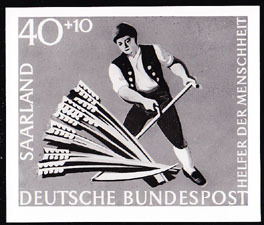 3019 EP GERMANY (1958) Farmer with hoe*. Horses*. Photo essay (See Note) for unaccepted design to benefit welfare organizations. Scott No B365, Yvert No 171. 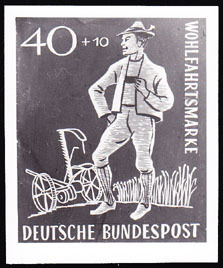 3020 EP GERMANY (1958) Farmer*. Harvester*. Photo essay (See Note) for unaccepted design to benefit welfare organizations. Scott No B365, Yvert No 171. 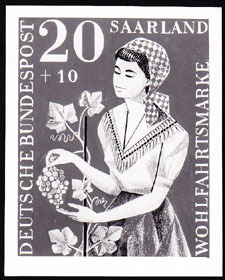 3045 EP GERMANY (1958) Girl picking grapes*. Photo essay (See Note) for unaccepted design to benefit welfare organizations. Scott No B364, Yvert No 170. 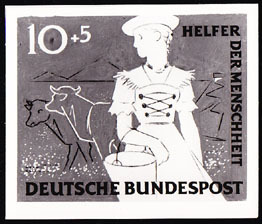 3120 EP GERMANY (1958) Dairy maid with bucket of milk*. Cows*. Photo essay (See Note) of unaccepted design for independent Welfare Organizations. Scott No B363, Yvert No 169. 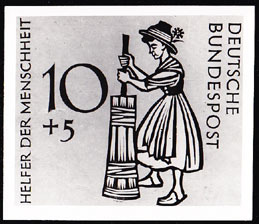 3121 EP GERMANY (1958) Dairy maid churning butter*. Photo essay (See Note) of unaccepted design for independent Welfare Organizations. Scott No B363, Yvert No 169. 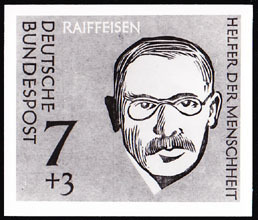 3480 EP GERMANY (1958) Friedrich Wilhelm Raiffeisen*. Photo essay (See Note) of unaccepted design for founder of credit unions. Scott No B362, Yvert No 168. 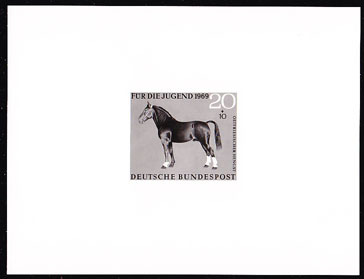 3827 EP GERMANY (1958) Deutschemark*. 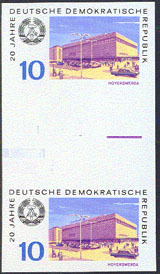 Photo essay (See Note) of unaccepted design for 10th anniversary of currency reform. Scott No 787, Yvert No 162. 3833 EP GERMANY (1958) Cartoon character Max*. 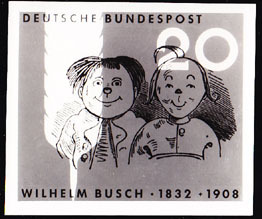 Photo essay (See Note) of unaccepted design for 50th anniversary of death of Wilhelm Busch. Scott No 780, Yvert No 153. 3835 EP GERMANY (1958) Cartoon characters Max & Moritz*. 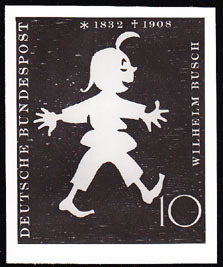 Photo essay (See Note) of unaccepted design for 50th anniversary of death of Wilhelm Busch. Scott No 780, Yvert No 153. 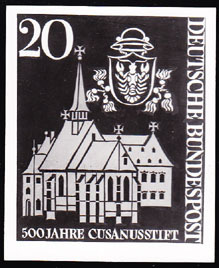 4640 EP GERMANY (1958) Cusanus hospice*. Photo essay (See Note) of unaccepted design for 500th anniversary of hospice founded by Cardinal Nikolaus. Scott No 792, Yvert No 172. 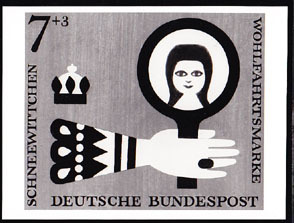 4641 EP GERMANY (1958) Nikolaus von Cusa*. Photo essay (See Note) of unaccepted design for 500th anniversary of hospice founded by Cardinal Nicolaus. Scott No 792, Yvert No 172. 4932 EP GERMANY (1958) Building*. Costumed man*. 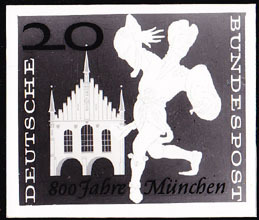 Photo essay (See Note) of unaccepted design for 800th anniversary of founding of Munich. Scott No 785, Yvert No 160. 5356 EP GERMANY (1958) Turner Society emblem*. 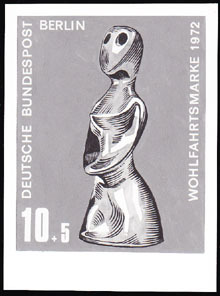 Photo essay (See Note) of unaccepted design for 150th anniversary of German Turners and 1958 festival. Scott No 788, Yvert No 163. 5357 EP GERMANY (1958) Oak leaf*. Turner Society emblem*. 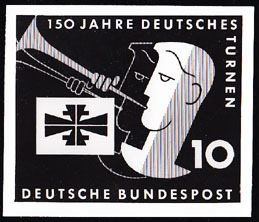 Photo essay (See Note) of unaccepted design for 150th anniversary of German Turners and 1958 festival. Scott No 788, Yvert No 163. 5358 EP GERMANY (1958) Men blowing horns*. Turner Society emblem*. 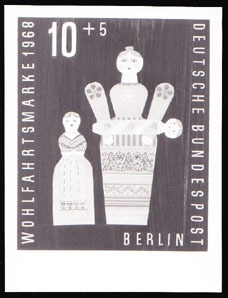 Photo essay (See Note) of unaccepted design for 150th anniversary of German Turners and 1958 festival. Scott No 788, Yvert No 163. 7388 EP GERMANY (1958) Girls in costume jumping rope*. 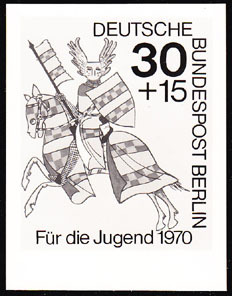 Archive photo (See Note) of unaccepted design for Youth study in Berlin issue. Measures 105 x 90 mm. 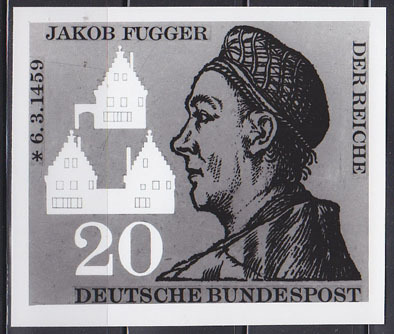 3481 EP GERMANY (1959) Jakob Fugger*. Photo essay (See Note) of unaccepted design for 500th anniversary of birth. Scott No 798, Yvert No 178. 3818 EP GERMANY (1959) Girl giving coat to boy*. Photo essay (See Note) of unaccepted design for Grimm brothers' "Star Dollars" Fairy Tale. Scott No B369, Yvert No 196. 3819 EP GERMANY (1959) Cat*. Girl giving coat to boy*. Photo essay (See Note) of unaccepted design for Grimm brothers' "Star Dollars" Fairy Tale. Scott No B369, Yvert No 196. 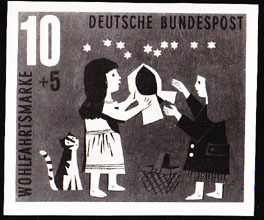 3979 EP GERMANY (1959) Girl receiving money from heaven*. Photo essay (See Note) of unaccepted design for Grimm brothers' "Star Dollars" Fairy Tale. Scott No B370, Yvert No 197. 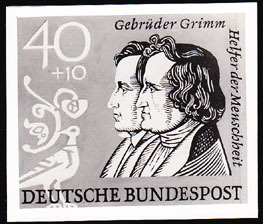 3980 EP GERMANY (1959) Grimm brothers*. 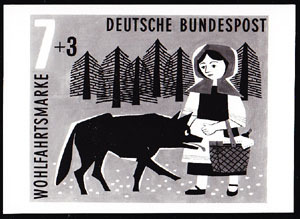 Photo essay (See Note) of unaccepted design honoring Grimm brothers. Scott No B371, Yvert No 198. 4271 EP GERMANY (1959) Girl giving bread to beggar*. 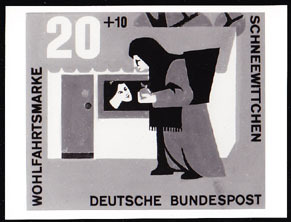 Photo essay (See Note) of unaccepted design for Grimm brothers' "Star Dollars" Fairy Tale. Scott No B368, Yvert No 195. 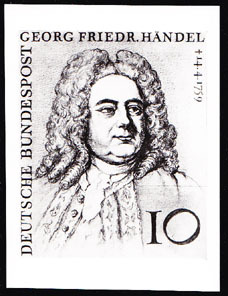 4813 EP GERMANY (1959) Handel*. Photo essay (See Note) of unaccepted design for opening of Beethoven Hall in Bonn and also 200th anniversary of death of Handel. Scott No 804a, Yvert No 188. 5138 EP GERMANY (1959) Holy coat of Trier*. Photo essay (See Note) of unaccepted design for robe of Christ issue. Scott No 802, Yvert No 186. 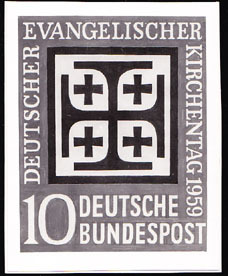 5139 EP GERMANY (1959) Evangelical Synod Emblem*. Photo essay (See Note) of unaccepted design for meeting of German Protestants. Scott No 803, Yvert No 187. 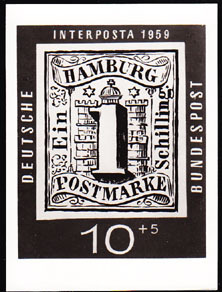 5490 EP GERMANY (1959) Stamp of Hamburg*. Photo essay (See Note) of unaccepted design for 100th anniversary of first postage stamps. Scott No B366, Yvert No 181. 5491 EP GERMANY (1959) Stamp of Lubeck*. Photo essay (See Note) of unaccepted design for 100th anniversary of first postage stamps. Scott No B367, Yvert No 182. 3981 EP GERMANY (1960) Little girl sets off for Grandma's with basket of food*. Photo essay (See Note) for unaccepted design of Little Red Riding Hood series. Scott No B372, Yvert No 213. 3982 EP GERMANY (1960) Little girl*. Grandmother*. Photo essay (See Note) for unaccepted design of Little Red Riding Hood series. Scott No B372, Yvert No 213. 3983 EP GERMANY (1960) Little girl*. Wolf*. Photo essay (See Note) for unaccepted design of Little Red Riding Hood series. Scott No B372, Yvert No 213. 3984 EP GERMANY (1960) Wolf sneaking into grandmother's bed*. Photo essay (See Note) for unaccepted design of Little Red Riding Hood series. Scott No B372, Yvert No 214. 3985 EP GERMANY (1960) Girl*. Wolf*. Photo essay (See Note) for unaccepted design of Little Red Riding Hood series. Scott No B372, Yvert No 213. 3986 EP GERMANY (1960) Girl*. Wolf disguised as a grandmother*. Photo essay (See Note) for unaccepted design of Little Red Riding Hood series. Scott No B372, Yvert No 214. 3987 EP GERMANY (1960) Hunter rescuing girl, grandmother*. Dead wolf*. Photo essay (See Note) for unaccepted design of Little Red Riding Hood series. Scott No B374, Yvert No 216. 3988 EP GERMANY (1960) Hunter with rifle approaching house*. Photo essay (See Note) for unaccepted design of Little Red Riding Hood series. Scott No B374, Yvert No 215. 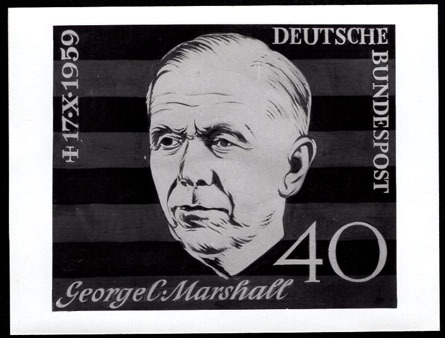 4864 EP GERMANY (1960) George Marshall*. Photo essay (See Note) of unaccepted design honoring Nobel Prize winner. Scott No 821, Yvert No 217. 5142 EP GERMANY (1960) Stylised crown of thorns*. Photo essay (See Note) of unaccepted design for Oberammergau Passion Play issue. Scott No 810, Yvert No 202. 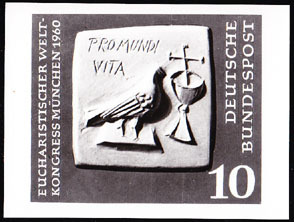 5143 EP GERMANY (1960) Cross with words "Pro Mundi Vita"*. Photo essay (See Note) of unaccepted design for 37th Eucharistic World Congress. Scott No 811, Yvert No 203. 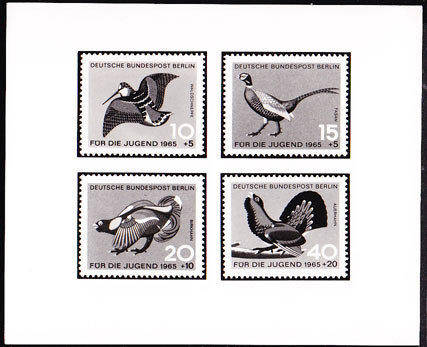 5144 EP GERMANY (1960) Bird*. Chalice*. Cross*. "Pro Mundi Vita"*. Photo essay (See Note) of unaccepted design for 37th Eucharistic World Congress. Scott No 811, Yvert No 203. 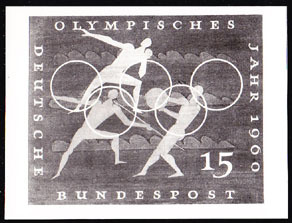 5370 EP GERMANY (1960) Olympians carrying torch*. Photo essay (See Note) for unaccepted design for Rome Olympics. Scott No 813, Yvert No 205. 5371 EP GERMANY (1960) Head of Greek athlete*. Photo essay (See Note) for unaccepted design for Rome Olympics. Scott No 813, Yvert No 205. 5372 EP GERMANY (1960) Track events*. Photo essay (See Note) for unaccepted design for Rome Olympics. Scott No 814, Yvert No 206. 5373 EP GERMANY (1960) Javelin*. Shot put*. Discus*. Photo essay (See Note) for unaccepted design for Rome Olympics. Scott No 814, Yvert No 206. 5374 EP GERMANY (1960) Team of horses*. Photo essay (See Note) for unaccepted design for Rome Olympics. Scott No 815, Yvert No 207. 5375 EP GERMANY (1960) Olympians playing ball*. Photo essay (See Note) for unaccepted design for Rome Olympics. Scott No 815, Yvert No 207. 5376 EP GERMANY (1960) Olympians rowing*. Photo essay (See Note) for unaccepted design for Rome Olympics. Scott No 816, Yvert No 208. 5583 EP GERMANY (1960) Modern train*. 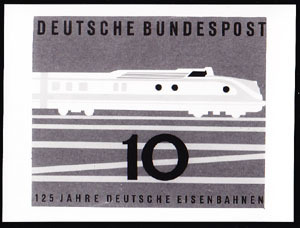 Photo essay (See Note) of unaccepted design for 125th anniversary of German railroads. Scott No 822, Yvert No 218. 5621 EP GERMANY (1960) Uprooted oak*. Photo essay (See Note) of unaccepted design for World Refugee Year issue. Scott No 807, Yvert No 199. 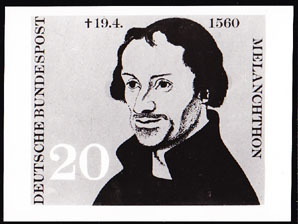 11109 EP GERMANY (1960) Philipp Melanchthon*. 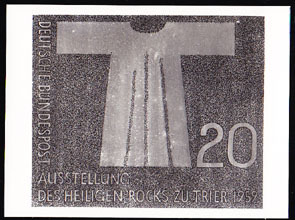 Photo essay (See Note) of unaccepted design for 400th anniversary of death of Martin Luther's co-worker. Scott No 809, Yvert No 201. Same portrait used in final design. 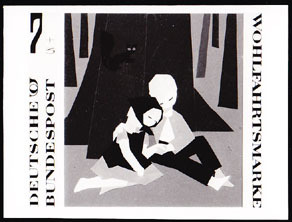 3989 EP GERMANY (1961) Lost in the woods*. Photo essay (See Note) of unaccepted design for Hansel & Gretel Fairy Tale. Scott No B376, Yvert No 241. 3990 EP GERMANY (1961) Hansel & Gretel approach witch's house*. Cat*. Owl*. Photo essay (See Note) of unaccepted design for Hansel & Gretel Fairy Tale. Scott No B377, Yvert No 242. 3991 EP GERMANY (1961) Hansel & Gretel at gingerbread house*. Photo essay (See Note) of unaccepted design for Hansel & Gretel Fairy Tale. Scott No B377, Yvert No 242. 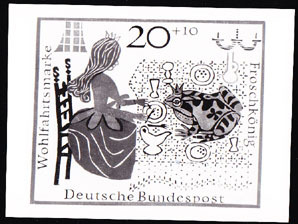 3992 EP GERMANY (1961) Gretel shoves witch into oven*. Photo essay (See Note) of unaccepted design for Hansel & Gretel Fairy Tale. Scott No B378, Yvert No 243. 3993 EP GERMANY (1961) Boy in cage*. Old woman with cane, cat*. Photo essay (See Note) of unaccepted design for Hansel & Gretel Fairy Tale. Scott No B378, Yvert No 243. 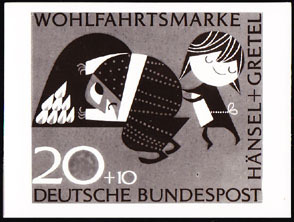 3994 EP GERMANY (1961) Hansel riding on duck holding Gretel's hand*. Photo essay (See Note) of unaccepted design for Hansel & Gretel Fairy Tale. Scott No B379, Yvert No 244. 4273 EP GERMANY (1961) Gingerbread house*. Photo essay (See Note) of unaccepted design for Hansel & Gretel Fairy Tale. Scott No B376, Yvert No 241. 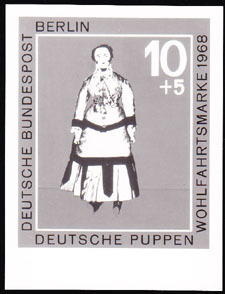 5148 EP GERMANY (1961) St. Elizabeth of Thuringia*. Photo essay (See Note) of unaccepted design for saint who built a hospital for the poor. Scott No 825, Yvert No 221. 5149 EP GERMANY (1961) Wilhelm Ketteler*. 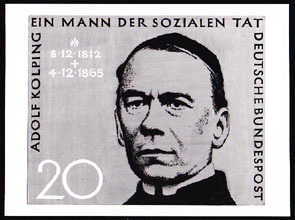 Photo essay (See Note) of unaccepted design for 150th anniversary of birth of bishop of Mainz. Scott No 847, Yvert No 246. 5552 EP GERMANY (1961) Ancient telephone*. 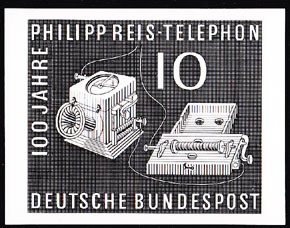 Photo essay (See Note) of unaccepted design for 100th anniversary of Philipp Reis, German inventor of the telephone. Scott No 846, Yvert No 245. 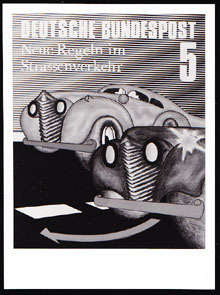 5553 EP GERMANY (1961) Philipp Reis*. 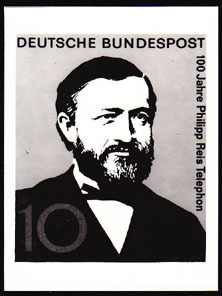 Photo essay (See Note) of unaccepted design for 100th anniversary of German inventor of the telephone. Scott No 846, Yvert No 245. 5568 EP GERMANY (1961) Gotthold Lessing*. Photo essay (See Note) of unaccepted design for playwright, poet and philosopher of the Enlightenment. Scott No 832, Yvert No 228. 3654 EP GERMANY (1962) Butterfly*. Photo essay (See Note) for unaccepted design of butterfly series. Scott No B380, Yvert No 248. 3655 EP GERMANY (1962) Butterfly*. Photo essay (See Note) for unaccepted design of butterfly series. Scott No B380, Yvert No 248. 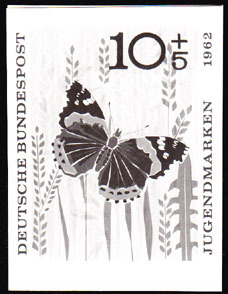 3656 EP GERMANY (1962) Butterfly*. Photo essay (See Note) for unaccepted design of butterfly series. Scott No B381, Yvert No 249. 3657 EP GERMANY (1962) Butterfly*. Photo essay (See Note) for unaccepted design of butterfly series. Scott No B381, Yvert No 249. 3658 EP GERMANY (1962) Butterfly*. Photo essay (See Note) for unaccepted design of butterfly series. Scott No B381, Yvert No 249. 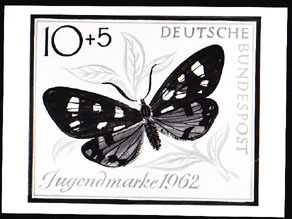 3659 EP GERMANY (1962) Butterfly*. Photo essay (See Note) for unaccepted design of butterfly series. Scott No B381, Yvert No 249. 3995 EP GERMANY (1962) Snow White*. Huntsman with sword*. Photo essay (See Note) of unaccepted design for Grimm fairy tale. Scott No B384, Yvert No 257. 3996 EP GERMANY (1962) Hand holding mirror reflecting face*. Photo essay (See Note) of unaccepted design for Grimm fairy tale. Scott No B384, Yvert No 257. 3997 EP GERMANY (1962) Snow White*. Seven dwarves*. Photo essay (See Note) of unaccepted design for Grimm fairy tale. Scott No B385, Yvert No 258. 3998 EP GERMANY (1962) Snow White*. Queen offering poisoned apple*. Photo essay (See Note) of unaccepted design for Grimm fairy tale. Scott No B386, Yvert No 259. 3999 EP GERMANY (1962) Snow White*. Poisoned apple*, comb*. Photo essay (See Note) of unaccepted design for Grimm fairy tale. Scott No B386, Yvert No 259. 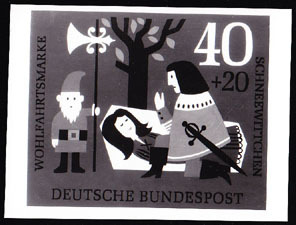 4000 EP GERMANY (1962) Snow White*. Prince reviving her*. Photo essay (See Note) of unaccepted design for Grimm fairy tale. Scott No B387, Yvert No 260. 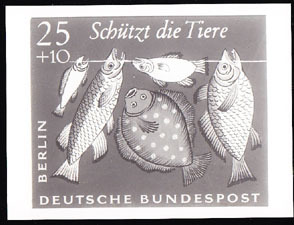 4274 EP GERMANY (1962) Fish*. Loaves of bread*. 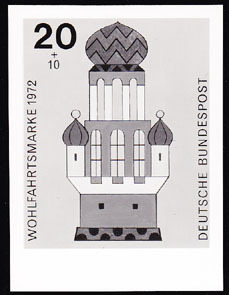 Photo essay (See Note) of unaccepted design for Advent Collection of Protestant Churches. Scott No 854, Yvert No 261. 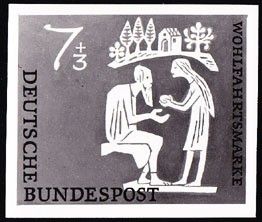 4275 EP GERMANY (1962) Hands*. Wheat*. Photo essay (See Note) of unaccepted design for Advent Collection of Protestant Churches. Scott No 854, Yvert No 261. 4458 EP GERMANY (1962) Grasshopper*. Photo essay (See Note) for unaccepted design of what became a series on butterflies. 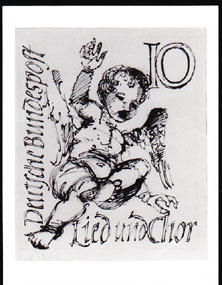 4787 EP GERMANY (1962) Cherub singing*. Photo essay (See Note) of unaccepted design for appreciation of choral singers. Scott No 849, Yvert No 252. 4788 EP GERMANY (1962) Singers*. Photo essay (See Note) of unaccepted design for appreciation of choral singers. Scott No 849, Yvert No 252. 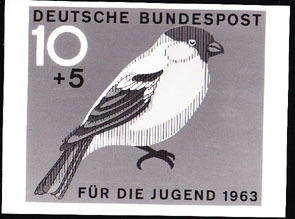 4933 EP GERMANY (1962) Symbolic bird*. 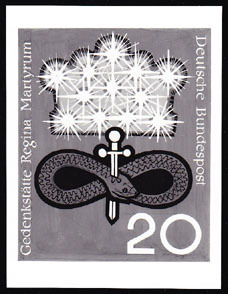 Photo essay (See Note) of unaccepted design for 2000th anniversary Mainz founding. Scott No 848, Yvert No 252. 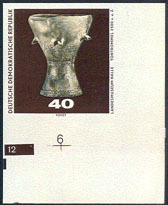 5150 EP GERMANY (1962) Chalice*. 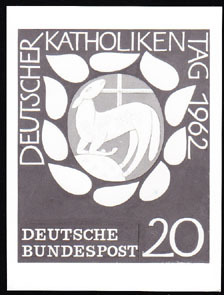 Photo essay (See Note) of unaccepted design for 79th meeting of German Catholics. Scott No 850, Yvert No 253. 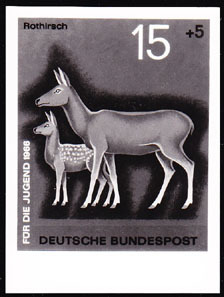 5151 EP GERMANY (1962) Lamb*. 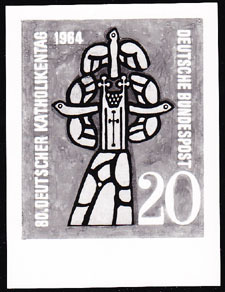 Photo essay (See Note) of unaccepted design for 79th meeting of German Catholics. Scott No 850, Yvert No 253. 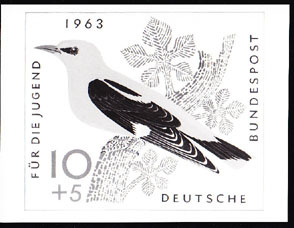 5152 EP GERMANY (1962) Dove*. 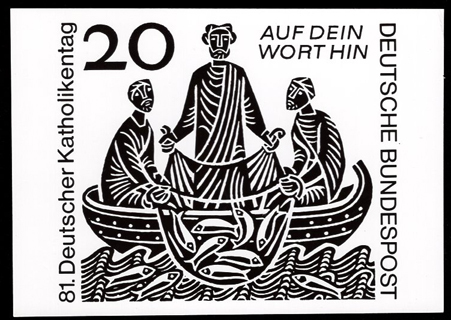 Photo essay (See Note) of unaccepted design for 79th meeting of German Catholics. Scott No 850, Yvert No 253. 5153 EP GERMANY (1962) Greek letters*. Bible*. 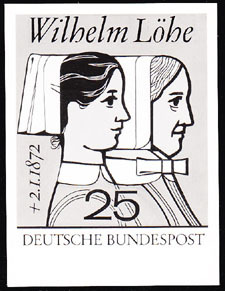 Photo essay (See Note) of unaccepted design for 150th anniversary of Wurttemberg Bible Society. Scott No 851, Yvert No 254. 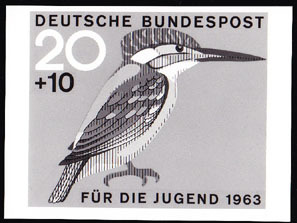 3533 EP GERMANY (1963) Hoopoe*. Photo essay (See Note) for unaccepted design of bird series. Scott No B388, Yvert No 273. 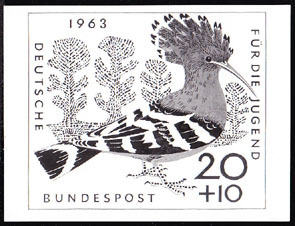 3534 EP GERMANY (1963) Hoopoe*. Photo essay (See Note) for unaccepted design of bird series. Scott No B388, Yvert No 273. 3535 EP GERMANY (1963) European golden oriole*. Photo essay (See Note) for unaccepted design of bird series. Scott No B389, Yvert No 274. 3536 EP GERMANY (1963) European golden oriole*. Photo essay (See Note) for unaccepted design of bird series. Scott No B389, Yvert No 274. 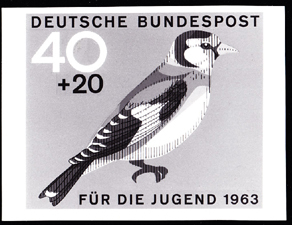 3537 EP GERMANY (1963) Bullfinch*. Photo essay (See Note) for unaccepted design of bird series. Scott No B390, Yvert No 275. 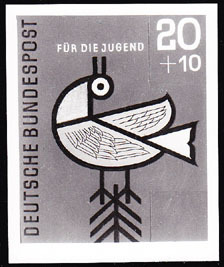 3538 EP GERMANY (1963) Stylised bird*. Photo essay (See Note) for unaccepted design of bird series. Scott No B406, Yvert No 275. 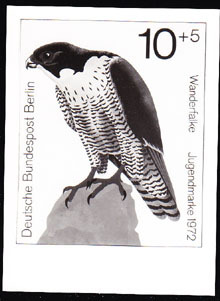 3619 EP GERMANY (Berlin) (1963) Peregrine falcon*. Photo essay (See Note) for unaccepted design of bird series. Scott No 9NB29, Yvert No 226. 4169 EP GERMANY (1963) Columbine*. 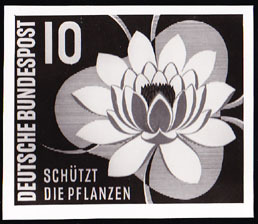 Photo essay (See Note) of unaccepted design for Flora and Philately Exhibition in Hamburg. Scott No 859, Yvert No 266. 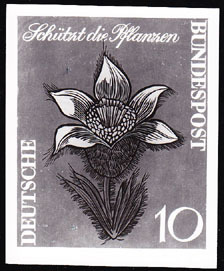 4170 EP GERMANY (1963) Beach thistle*. 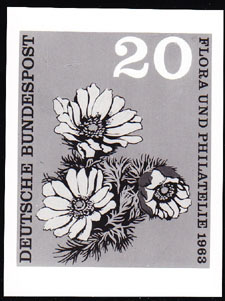 Photo essay (See Note) of unaccepted design for Flora and Philately Exhibition in Hamburg. Scott No 860, Yvert No 267. 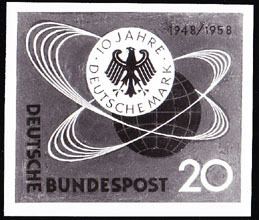 5090 EP GERMANY (1963) Star*. Photo essay (See Note) of unaccepted design for issue honoring CRALOG and CARE for help 1946-62. Scott No 855, Yvert No 262. 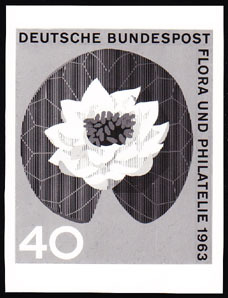 5091 EP GERMANY (1963) Rose*. Photo essay (See Note) of unaccepted design for issue honoring CRALOG and CARE for help 1946-62. Scott No 855, Yvert No 262. 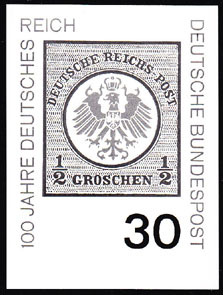 5092 EP GERMANY (1963) Cross*. 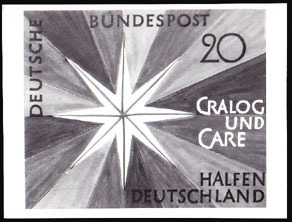 Photo essay (See Note) of unaccepted design for 100th anniversary of founding of Red Cross. Scott No 865, Yvert No 272. 5154 EP GERMANY (1963) Man on horse offering cape*. 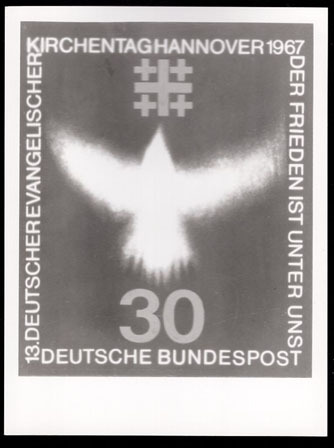 Photo essay (See Note) of unaccepted design for issue honoring German Catholic Misereor campaign against hunger and illness. Scott No 856, Yvert No 263. 5155 EP GERMANY (1963) Man offering bowl of food*. 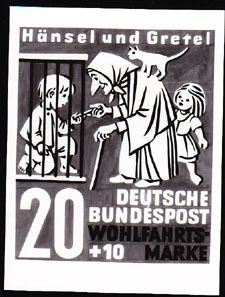 Photo essay (See Note) of unaccepted design for issue honoring German Catholic Misereor campaign against hunger and illness. Scott No 856, Yvert No 263. 5156 EP GERMANY (1963) Bird feeding nestlings*. 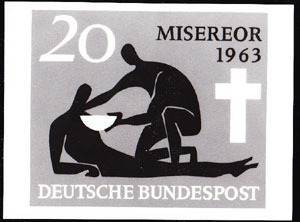 Photo essay (See Note) of unaccepted design for issue honoring German Catholic Misereor campaign against hunger and illness. Scott No 856, Yvert No 263. 5157 EP GERMANY (1963) Heidelberg Catechism*. Photo essay (See Note) of unaccepted design for 400th anniversary of Reformed Church. Scott No 861, Yvert No 268. 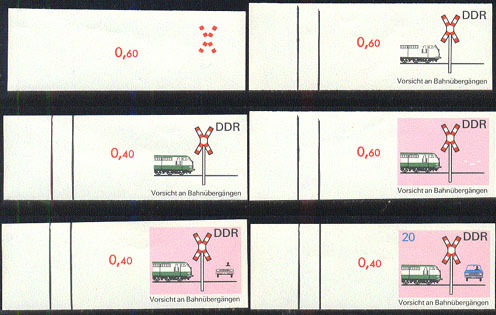 5158 EP GERMANY (1963) Crosses*. Drops of blood*. Photo essay (See Note) of unaccepted design for issue honoring consecration of Regina Martyrum Church. Scott No 862, Yvert No 269. 5159 EP GERMANY (1963) Serpent stabbed with sword*. Photo essay (See Note) of unaccepted design for issue honoring consecration of Regina Martyrum Church. Scott No 862, Yvert No 269. 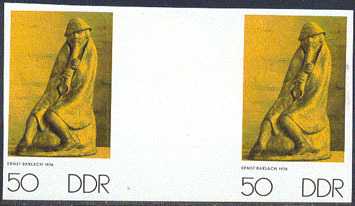 5160 EP GERMANY (1963) Shrouded figures*. Photo essay (See Note) of unaccepted design for issue honoring consecration of Regina Martyrum Church. Scott No 862, Yvert No 269. 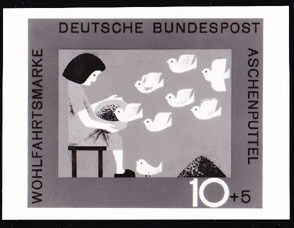 5584 EP GERMANY (1963) Birds*. Map of train line*. Photo essay (See Note) for unaccepted design for inauguration of "Bird Flight Line" railroad link to Denmark, which was also a bird migration path. Scott No 864, Yvert No 271. 16191 EP GERMANY (1963) Lady's slipper*. 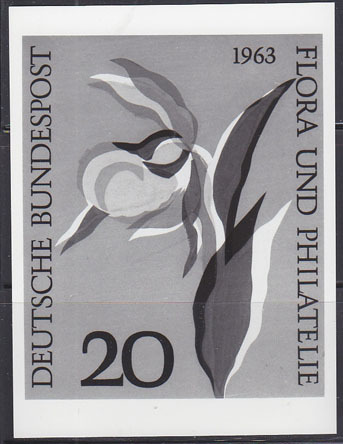 Photo essay (See Note) of unaccepted design for Flora and Philately Exhibition in Hamburg. Scott No 858, Yvert No 265. 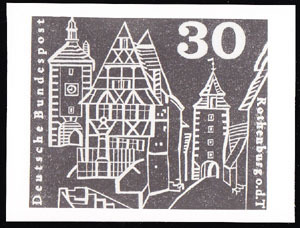 3224 EP GERMANY (1964) Ottobeuren Abbey*. 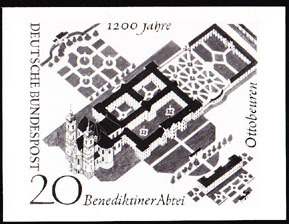 Photo essay (See Note) of unaccepted design for 1200th anniversary of founding of Benedictine abbey. Scott No 880, Yvert No 296. 3483 EP GERMANY (1964) Weathervane*. Photo essay (See Note) of unaccepted design for 250 years of the Court of Accounts.. Scott No 900, Yvert No 320. 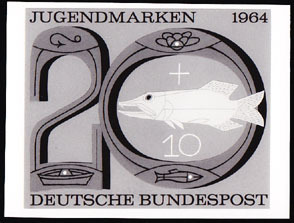 4082 EP GERMANY (1964) Fish*. Photo essay (See Note) for unaccepted design of fish series. Scott No B396, Yvert No 284. 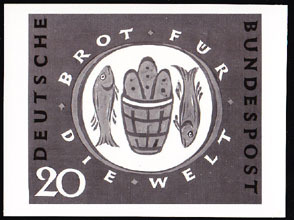 4083 EP GERMANY (1964) Fish*. Photo essay (See Note) for unaccepted design of fish series. Scott No B398, Yvert No 286. 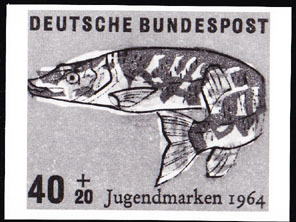 4084 EP GERMANY (1964) Fish*. Photo essay (See Note) for unaccepted design of fish series. Scott No B399, Yvert No 287. 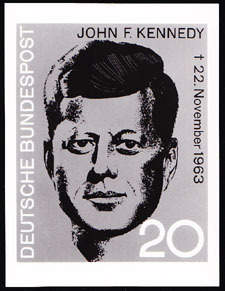 4525 EP GERMANY (1964) J. F. Kennedy*. Photo essay (See Note) of unaccepted design for Kennedy memorial. Scott No 901, Yvert No 321. 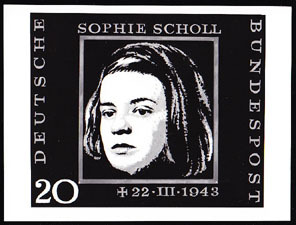 4878 EP GERMANY (1964) Sophie Scholl*. Photo essay (See Note) of unaccepted design for Nazi resister and member of White Rose organization. Scott No 883, Yvert No 297. 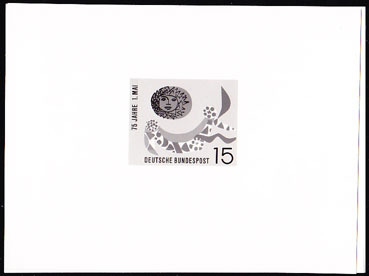 5163 EP GERMANY (1964) Various designs*. 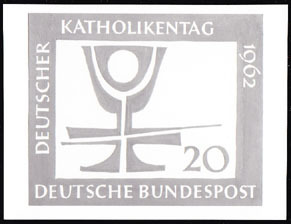 Photo essay (See Note) of unaccepted design for 80th meeting of German Catholics. Scott No 896, Yvert No 309. 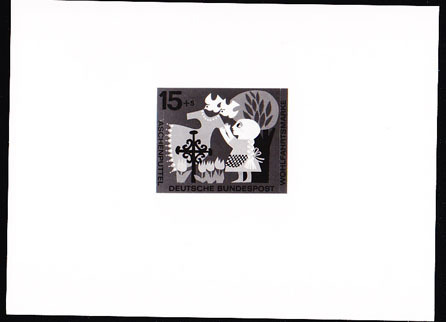 5164 EP GERMANY (1964) Radiating sun*. Cross*. 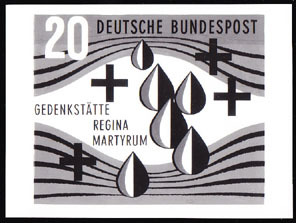 Photo essay (See Note) of unaccepted design for 80th meeting of German Catholics. Scott No 896, Yvert No 309. 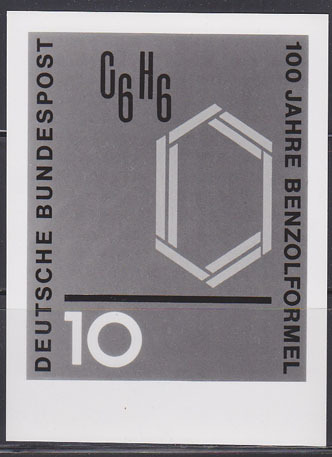 15853 EP GERMANY (1964) Benzene ring*. Photo essay (See Note) (unaccepted) for centenary of discovery of benzene ring by Kekulé. Measures 90 x 120 mm. Scott No 892, Yvert No 310. 3353 EP GERMANY (1965) Matthias Claudius. Hat*. Cane*. Photo essay (See Note) of unaccepted design 150th anniversary of death of poet who wrote "Death and the Maiden". Scott No 917, Yvert No 329. 3440 EP GERMANY (1965) Plane*. Anemometer*. Windsock*. Radar*. Photo essay (See Note) of unaccepted design for International Transport & Communications series. Scott No 922, Yvert No 333. 3542 EP GERMANY (1965) Eurasian woodcock*. Pheasant*. Black grouse*. Capercaillie*. Photo essay (See Note) for four unaccepted designs of bird series. Scott Nos B404-7, Yvert Nos 330-3. All the same birds were used in the issued series. 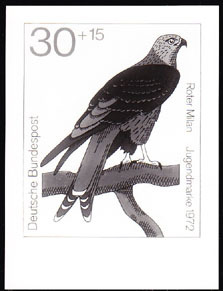 3543 EP GERMANY (1965) Black grouse*. Photo essay (See Note) for unaccepted design of bird series. Scott No B406, Yvert No 275. 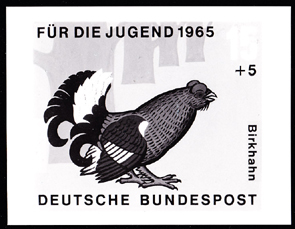 3544 EP GERMANY (1965) Grey partridge*. Photo essay (See Note) for unaccepted design of bird series. Scott No B407, Yvert No 276. 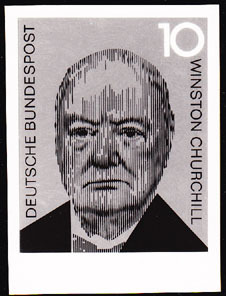 3787 EP GERMANY (1965) Churchill*. Photo essay (See Note) of unaccepted design for International Transport & Communications series. Scott No 924, Yvert No 335. 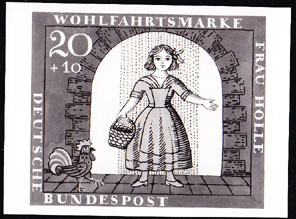 4001 EP GERMANY (1965) Cinderella befriends the birds*. Photo essay (See Note) of unaccepted design for Cinderella series. Scott No B408, Yvert No 352. 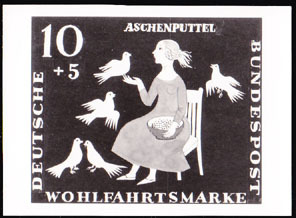 4002 EP GERMANY (1965) Cinderella feeding the pigeons*. Photo essay (See Note) of unaccepted design for Cinderella series. Scott No B408, Yvert No 352. 4003 EP GERMANY (1965) Cinderella* receives her gown* from the birds*. Photo essay (See Note) of unaccepted design for Cinderella series. Scott No B409, Yvert No 353. 4004 EP GERMANY (1965) Cinderella's stepsisters try to cut their feet to fit the glass slipper*. Photo essay (See Note) of unaccepted design for Cinderella series. Scott No B410, Yvert No 354. 4005 EP GERMANY (1965) Prince Charming fits glass slipper on Cinderella*. Photo essay (See Note) of unaccepted design for Cinderella series. Scott No B410, Yvert No 354. 4006 EP GERMANY (1965) Cinderella rides off with Prince Charming*. Photo essay (See Note) of unaccepted design for Cinderella series. Scott No B411, Yvert No 355. 4448 EP GERMANY (1965) May Day celebration*. Photo essay (See Note) of unaccepted design for 75th anniversary of May 1. Scott No 926, Yvert No 336. 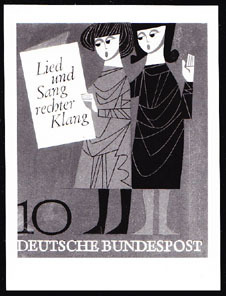 4449 EP GERMANY (1965) Adolph Kolping*. Photo essay (See Note) of unaccepted design for founder of Catholic Unions of Journeymen. Scott No 928, Yvert No 338. 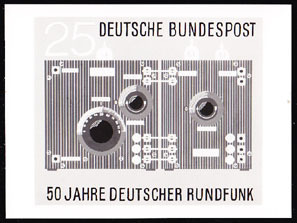 5062 EP GERMANY (1965) Sine wave*. Stuttgart TV tower*. 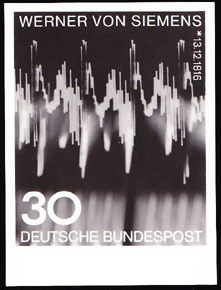 Photo essay (See Note) of unaccepted design for German radio exhibition. Scott No 932, Yvert No 348. 5165 EP GERMANY (1965) Maze*. 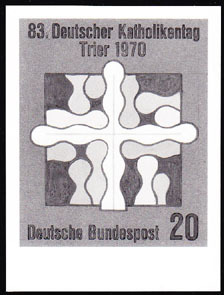 Photo essay (See Note) of unaccepted design for 12th meeting of German Protestants. Scott No 931, Yvert No 347. 5245 EP GERMANY (1965) Man being carried over waves by rescue line*. 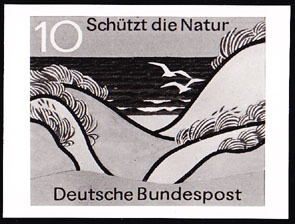 Photo essay (See Note) of unaccepted design for 100th anniversary of German Sea Rescue Service. Scott No 929, Yvert No 339. 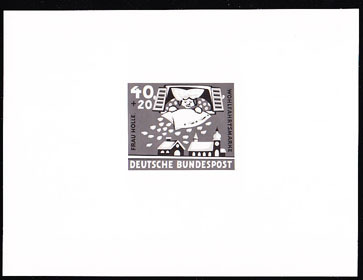 5246 EP GERMANY (1965) Flag*. Hand*. Wave*. 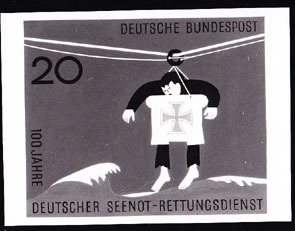 Photo essay (See Note) of unaccepted design for 100th anniversary of German Sea Rescue Service. Scott No 929, Yvert No 339. 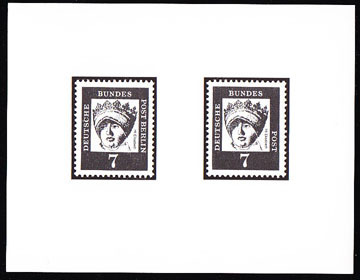 5492 EP GERMANY (1965) Stamps of Thurn & Taxis*. Photo essay (See Note) of unaccepted design for 125th anniversary of first postage stamp. Scott No 933, Yvert No 349. Very similar to final design. 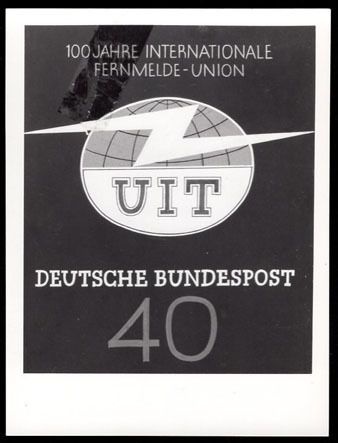 5533 EP GERMANY (1965) ITU Emblem. Photo essay (See Note) of unaccepted design for centenary of ITU founding. Scott No 927, Yvert No 337. 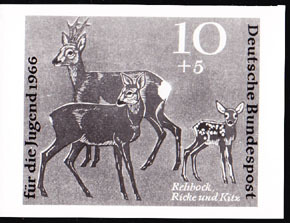 3136 EP GERMANY (1966) Roe deer*. Photo essay (See Note) of unaccepted design for deer series benefiting youth organizations. Scott No B412, Yvert No 364. 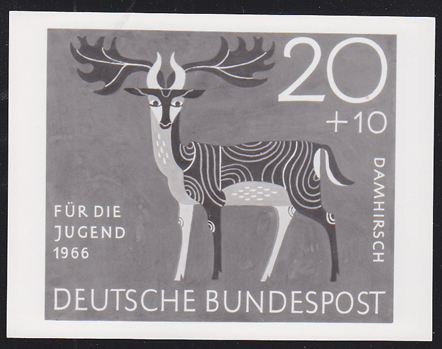 3137 EP GERMANY (1966) Fallow deer*. Photo essay (See Note) of unaccepted design for deer series benefiting youth organizations. Scott No B414, Yvert No 366. 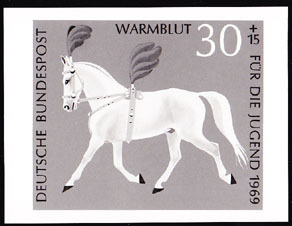 3138 EP GERMANY (1966) Red deer*. Photo essay (See Note) of unaccepted design for deer series benefiting youth organizations. Scott No B415, Yvert No 367. 3948 EP GERMANY (1966) Electric pile*. 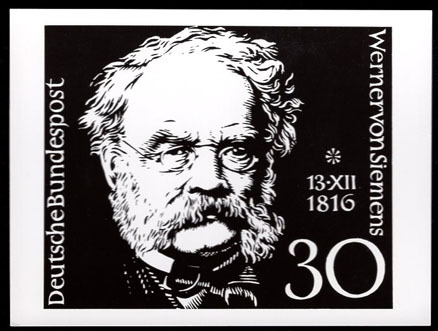 Photo essay (See Note) of unaccepted design for 100th anniversary of discovery of electrodynamic principle by Werner Siemens. Scott No 966, Yvert No 379. 4007 EP GERMANY (1966) Princess*. Frog diving in pool*. Photo essay (See Note) of unaccepted design for Princess and the Frog series. Scott No B418, Yvert No 380. 4008 EP GERMANY (1966) Princess* playing with ball*. Castle*. Photo essay (See Note) of unaccepted design for Princess and the Frog series. Scott No B418, Yvert No 380. 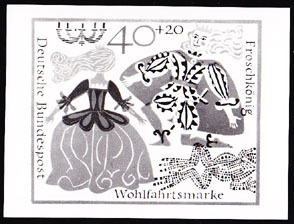 4009 EP GERMANY (1966) Princess*. Ball*. Frog*. Photo essay (See Note) of unaccepted design for Princess and the Frog series. Scott No B418, Yvert No 380. 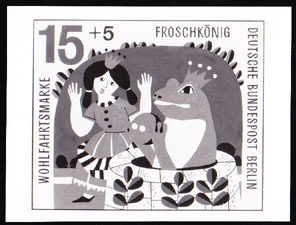 4010 EP GERMANY (1966) Princess dining with frog*. Photo essay (See Note) of unaccepted design for Princess and the Frog series. Scott No B419, Yvert No 381. 4011 EP GERMANY (1966) Princess*. Frog*. King*. Photo essay (See Note) of unaccepted design for Princess and the Frog series. Scott No B421, Yvert No 383. 4012 EP GERMANY (1966) Princess*. Frog transformed into prince*. Photo essay (See Note) of unaccepted design for Princess and the Frog series. Scott No B421, Yvert No 383. 4113 EP GERMANY (1966) "Miraculous Catch of Fish"*. 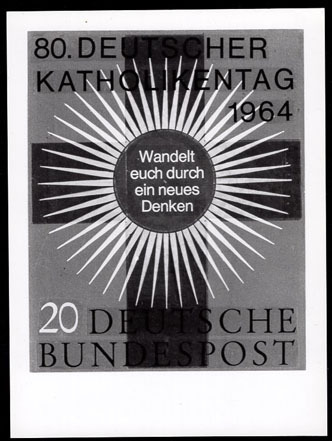 Photo essay (See Note) of unaccepted design for 81st meeting of German Catholics. Scott No 961, Yvert No 372. Almost exactly like final design (the appearance of the faces was changed). 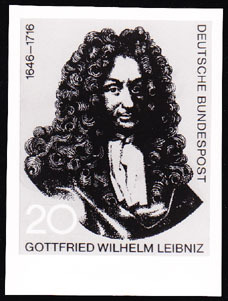 4617 EP GERMANY (1966) Leibnitz*. 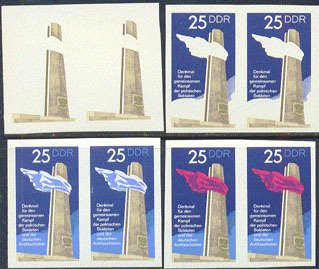 Photo essay (See Note) of unaccepted design for 250th anniversary of death. Scott No 962, Yvert No 375. 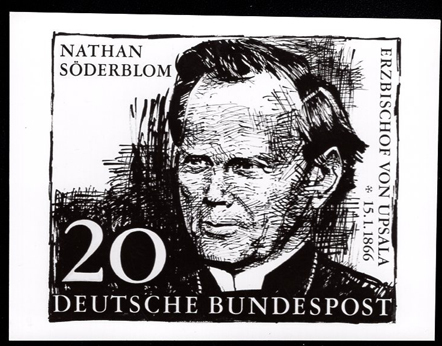 4866 EP GERMANY (1966) Nathan Soderblom*. Photo essay (See Note) of unaccepted design for Nobel Peace Prize winner. Scott No 959, Yvert No 356. 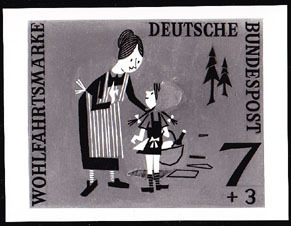 4867 EP GERMANY (1966) Stylised children*. 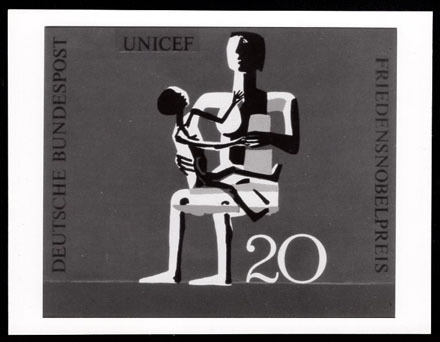 Photo essay (See Note) of unaccepted design for UNICEF Nobel Peace Prize issue. Scott No 967, Yvert No 384. 4868 EP GERMANY (1966) Mother & child*. 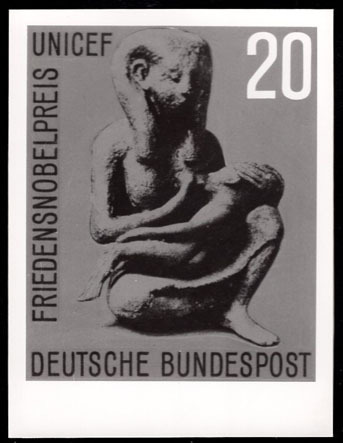 Photo essay (See Note) of unaccepted design for UNICEF Nobel Peace Prize issue. Scott No 967, Yvert No 384. 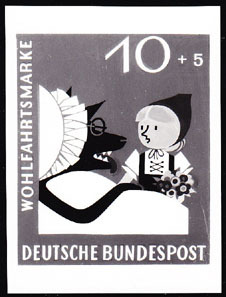 5021 EP GERMANY (1966) Mail carrier with dog*. Photo essay (See Note) of unaccepted design for FIP Munich meeting series. Scott No B417, Yvert No 374. 5203 EP GERMANY (1966) Werner Siemens*. 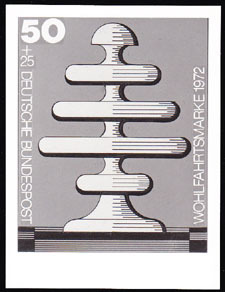 Photo essay (See Note) of unaccepted design for 150th anniversary of birth of inventor and industrialist, founder of Siemens. Scott No 967, Yvert No 385. 5204 EP GERMANY (1966) Oscilloscope screen*. Photo essay (See Note) of unaccepted design for 150th anniversary of birth of inventor and industrialist, founder of Siemens. Scott No 967, Yvert No 385. 5486 EP GERMANY (1966) Mail coach*. 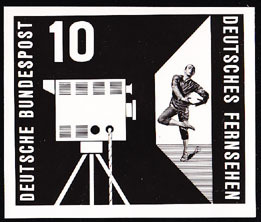 Photo essay (See Note) of unaccepted design for Foundation for Promotion of Philately. Scott No B416, Yvert No 373. 5502 EP GERMANY (1966) Posthorn*. 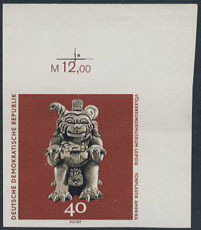 Photo essay (See Note) of unaccepted design for Foundation for Promotion of Philately. Scott No B416, Yvert No 373. 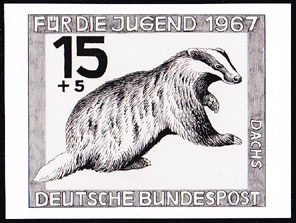 3063 EP GERMANY (1967) Badger*. Photo essay (See Note) for unaccepted design of animal protection series. Scott No B422, Yvert No 387. 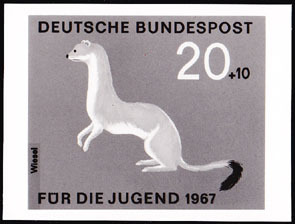 3064 EP GERMANY (1967) Weasel*. Photo essay (See Note) for unaccepted design of animal protection series. Scott No B423, Yvert No 388. 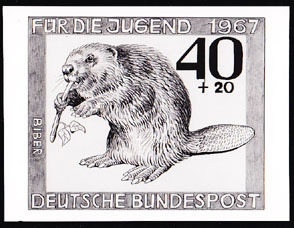 3065 EP GERMANY (1967) Beaver*. Photo essay (See Note) for unaccepted design of animal protection series. Scott No B424, Yvert No 389. 3155 EP GERMANY (1967) Fox*. Photo essay (See Note) for unaccepted design of animal protection series. Scott No B425, Yvert No 390. 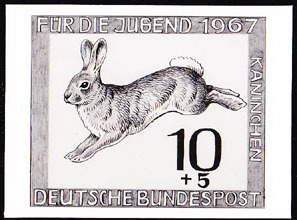 3161 EP GERMANY (1967) Rabbit running*. Photo essay (See Note) for unaccepted design of animal protection series. Scott No B422, Yvert No 387. 3856 EP EAST GERMANY (1967) Nutcracker*. Figurines*. Pair of imperforate margin phase proofs in final colors. Scott No 975, Yvert No 1028. Michel catalog 180 Euros. 3857 EP EAST GERMANY (1967) Angel & Miner candle holders*. Imperforate margin phase proof in final colors. Scott No 976, Yvert No 1029. Michel catalog 90 Euros. 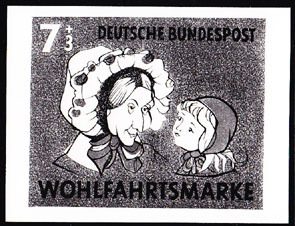 4014 EP GERMANY (Berlin) (1967) Mother Hulda (Frau Holle)*. Photo essay (See Note) of unaccepted design for Grimm fairy tale. Scott No 9NB90, Yvert No 286. 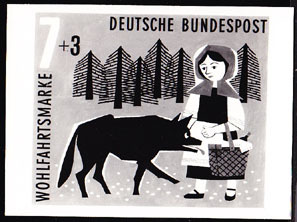 4015 EP GERMANY (Berlin) (1967) Mother Hulda (Frau Holle)*. Stepdaughter*. Photo essay (See Note) of unaccepted design for Grimm fairy tale. Scott No 9NB91, Yvert No 287. 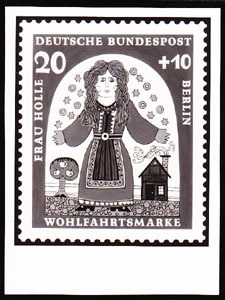 4016 EP GERMANY (Berlin) (1967) Mother Hulda (Frau Holle)*. Rooster crowing*. Photo essay (See Note) of unaccepted design for Grimm fairy tale. Scott No 9NB91, Yvert No 287. 4017 EP GERMANY (1967) Girl with basket*. Rooster*. 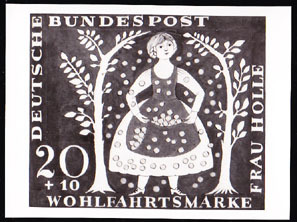 Photo essay (See Note) of unaccepted design for Grimm fairy tale Frau Holle (Mother Hulda). Scott No B427, Yvert No 404. 4018 EP GERMANY (1967) Stepdaughter returning with apron full of gold*. Photo essay (See Note) of unaccepted design for Grimm fairy tale. Scott No B427, Yvert No 404. 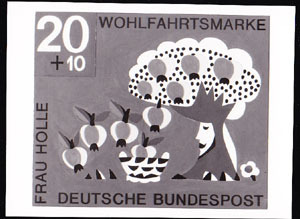 4019 EP GERMANY (1967) Mother Hulda (Frau Holle) with fruits and vegetables*. Photo essay (See Note) of unaccepted design for Grimm fairy tale. Scott No B427, Yvert No 404. 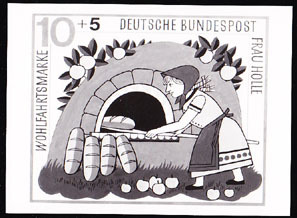 4020 EP GERMANY (1967) Mother Hulda (Frau Holle) baking bread*. Photo essay (See Note) of unaccepted design for Grimm fairy tale. Scott No B428, Yvert No 405. 4021 EP GERMANY (1967) Mother Hulda (Frau Holle) shaking her featherbed and making snow*. Photo essay (See Note) of unaccepted design for Grimm fairy tale. Scott No B429, Yvert No 406. 4554 EP GERMANY (1967) Map of South America*. Cross*. Photo essay (See Note) of unaccepted design for Adveniat, aid movement for Latin American Churches. Scott No 977, Yvert No 410. 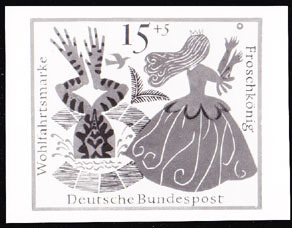 4648 EP GERMANY (1967) Friedrich von Bodelschwingh*. Photo essay (See Note) of unaccepted design for centenary of Bethel Institution for the Incurable (mental diseases). Scott No 973, Yvert No 402. 4722 EP EAST GERMANY (1967) October revolution*. Set of 5 imperforate phase proofs in final colors. Scott Nos 955-9, Yvert Nos 1009-13. Michel catalog 375 Euros. 4723 EP EAST GERMANY (1967) Russian war memorial*. Pair of imperforate margin phase proofs in final colors separated by gutter. Scott No 957, Yvert No 1011. Michel catalog 150 Euros. 4724 EP EAST GERMANY (1967) Russian & German soldiers*. Imperforate margin phase proof in final colors. Scott No 958, Yvert No 1012. Michel catalog 75 Euros. 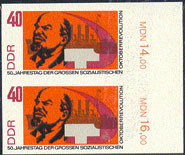 4725 EP EAST GERMANY (1967) Lenin*. Cruiser Aurora*. Pair of imperforate margin phase proofs in final colors. Scott No 959, Yvert No 1013. Michel catalog 150 Euros. 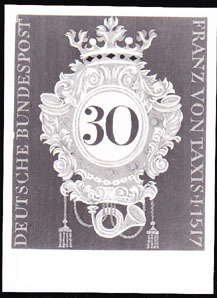 5022 EP GERMANY (1967) Franz von Taxis*. Photo essay (See Note) of unaccepted design honoring founder of postal system. Scott No 971, Yvert No 400. 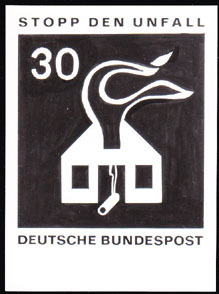 5023 EP GERMANY (1967) Emblem*. 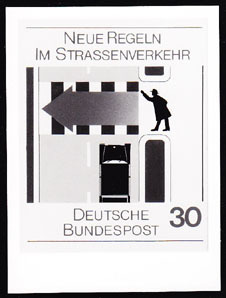 Photo essay (See Note) of unaccepted design honoring Franz von Taxis, founder of postal system. Scott No 971, Yvert No 400. 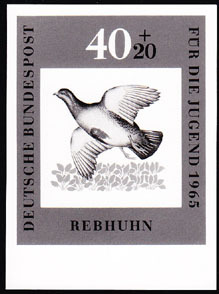 5170 EP GERMANY (1967) Dove*. 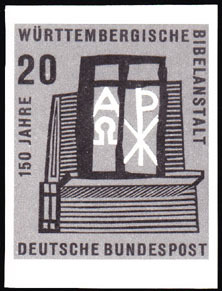 Photo essay (See Note) of unaccepted design for 13th meeting of German Protestants. Scott No 972, Yvert No 401. 6426 EP EAST GERMANY (1967) Schiller's house*. 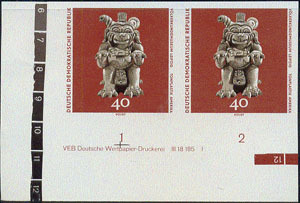 Imperforate proof (Phasendrucke). Scott No 967, Yvert No 1027. Final colors. 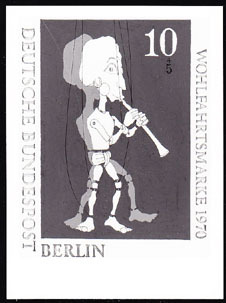 10000 EP EAST GERMANY (1967) Nutcracker*. Figurines*. Set of 5 imperforate progressive proofs. Erzegebirge Folk Art. Scott No 975, Yvert No 1028. 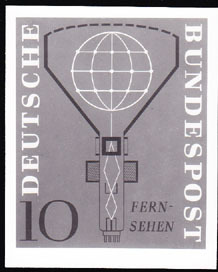 These imperforate proofs from the archives of the former East German printer are very rare (only about 10 copies exist). 10713 EP EAST GERMANY (1967) Worker*. Symbols of electrification*. Strip of 4 imperforate phase proofs with gutter in final colors. Scott No 956, Yvert No 1010. Michel catalog 150 Euros. 210 EP EAST GERMANY (1968) "High School Student" by Michaelis*. 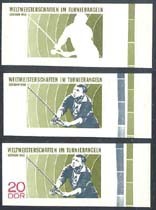 Series of 4 imperforate progressive proofs, including final colors. Scott No 1036, Yvert No 1093. 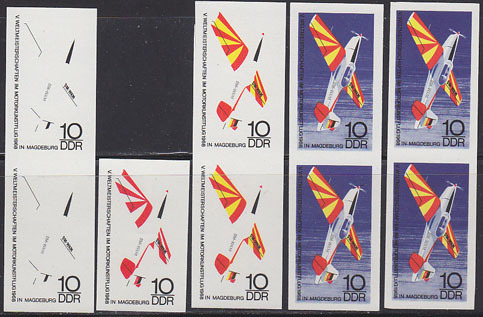 454 EP EAST GERMANY (1968) Trener stunt planes*. 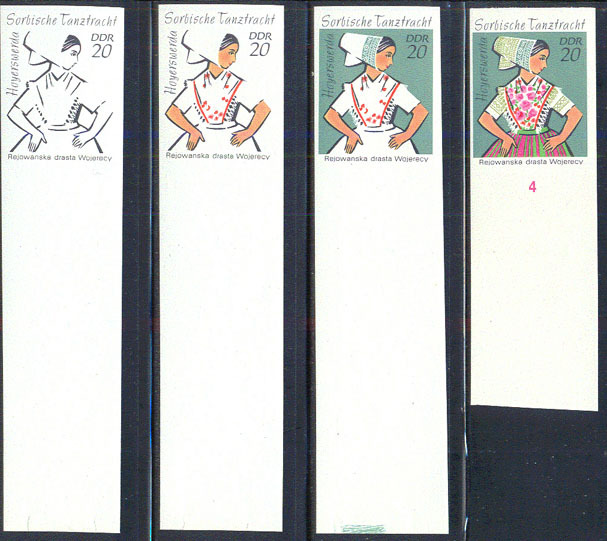 Series of 6 imperforate progressive proofs, including final colors. Scott No 1031, Yvert No 1088. 1724 EP EAST GERMANY (1968) Actinometer*. Satellite weather image*. Effects of climate on agriculture*. 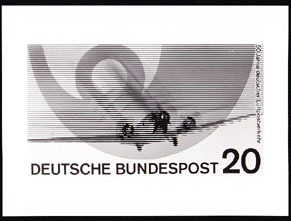 Progressive imperforate color proof of triptych for Potsdam Meteorological Observatory. Scott Nos 982-4, Yvert No 1039a. Black, blue & red colors. 2345 EP EAST GERMANY (1968) Kosmos 186 & 188 satellites*. 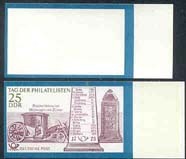 Imperforate progressive proof (incomplete). Scott No 986, Yvert No 1041. 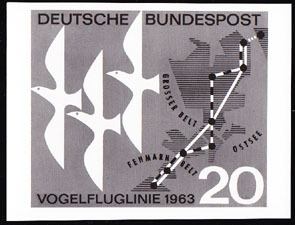 2389 EP EAST GERMANY (1968) Torch*. Stadium*. 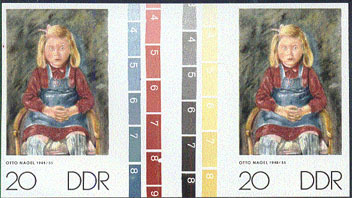 Series of 4 progressive imperforate color proofs, including final colors. 2nd Children's & Youth Spartakaiad. Scott No 1016, Yvert No 1074. 2914 EP EAST GERMANY (1968) Young pioneers*. Impressive collection of 6 imperforate progressive proofs and 4 proof pairs, including final colors. Scott No 1069, Yvert No 1128. 2915 EP EAST GERMANY (1968) Young pioneers*. 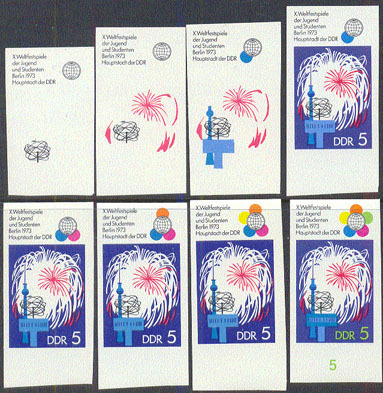 6 imperforate progressive proofs, including final colors. Scott No 1070, Yvert No 1129. 3027 EP EAST GERMANY (1968) Mountain farmers mowing*. Imperforate phase proof pair in final colors. Painting by Egger-Lienz. Scott No 1033, Yvert No 1090. Michel catalog 180 Euros. 3328 EP EAST GERMANY (1968) Maxim Gorky*. Pair of imperforate phase proofs in final colors. Scott No 996, Yvert No 1048. Michel catalog 140 Euros. 3686 EP EAST GERMANY (1968) Rococo palace in Dornburg*. Imperforate phase proof in final colors. Scott No 1075, Yvert No 1134. Michel catalog 90 Euros. 3877 EP GERMANY (1968) Workers in woodcraft*. 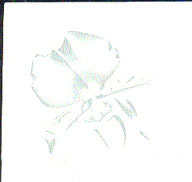 Photo essay (See Note) of unaccepted design for Tradition of Crafts and Trades stamp. Scott No 981, Yvert No 418. 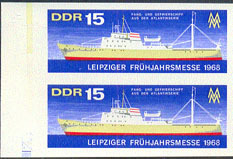 4114 EP EAST GERMANY (1968) Refrigerated fishing ship*. Pair of imperforate phase proofs in final colors. Scott No 991, Yvert No 1046. 4115 EP EAST GERMANY (1968) Angler*. Imperforate phase proof in final colors. Scott No 1012, Yvert No 1069. Michel catalog 90 Euros. 4299 EP GERMANY (Berlin) (1968) Dolls*. Photo essay (See Note) of unaccepted design for 19th century dolls issue. Scott No 9NB57, Yvert No 297. 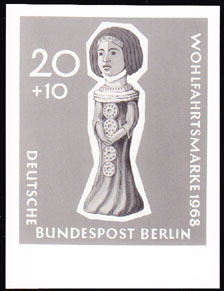 4300 EP GERMANY (Berlin) (1968) Doll in ancient dress*. Photo essay (See Note) of unaccepted design for 19th century dolls issue. Scott No 9NB57, Yvert No 297. 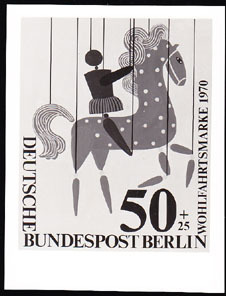 4301 EP GERMANY (Berlin) (1968) Doll on hobbyhorse*. Photo essay (See Note) of unaccepted design for 19th century dolls issue. Scott No 9NB58, Yvert No 298. 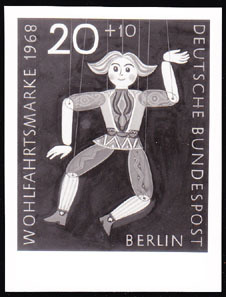 4302 EP GERMANY (Berlin) (1968) Dancing marionette*. Photo essay (See Note) of unaccepted design for 19th century dolls issue. Scott No 9NB58, Yvert No 298. 4303 EP GERMANY (Berlin) (1968) Doll in gown*. Photo essay (See Note) of unaccepted design for 19th century dolls issue. Scott No 9NB58, Yvert No 298. 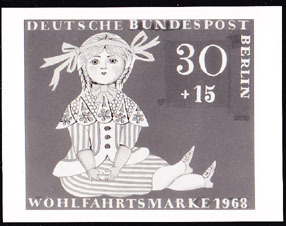 4304 EP GERMANY (Berlin) (1968) Seated doll*. Photo essay (See Note) of unaccepted design for 19th century dolls issue. Scott No 9NB59, Yvert No 299. 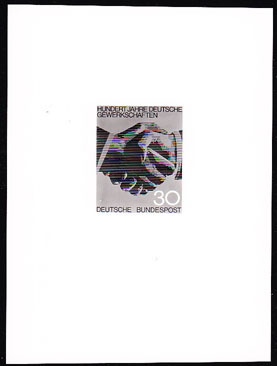 4450 EP GERMANY (1968) Handshake*. 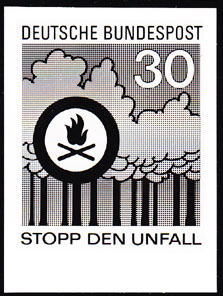 Photo essay (See Note) of unaccepted design for centenary of German Trade Unions. Scott No 991, Yvert No 434. 4463 EP EAST GERMANY (1968) Ground Beetle*. Imperforate proof. Scott No 1049, Yvert No 1108. 4601 EP GERMANY (1968) Karl Marx*. Photo essay (See Note) of unaccepted design for 150th anniversary of birth. Scott No 985, Yvert No 425. 4602 EP EAST GERMANY (1968) Young workers*. Pair of imperforate phase proofs in final colors. Scott No 1008, Yvert No 1060. Michel catalog 140 Euros. 4934 EP EAST GERMANY (1968) Rostock*. Set of 2 imperforate phase proofs in final colors. Scott Nos 1023-4, Yvert Nos 1080-1. Michel catalog 140 Euros. 4935 EP EAST GERMANY (1968) Rostock*. 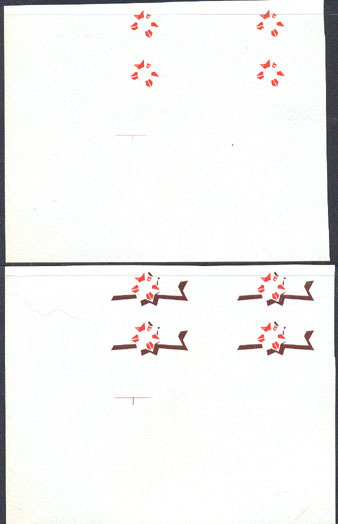 Corner block of 4 imperforate phase proofs in final colors and marginal notations. Scott No 1024, Yvert No 1081. Michel catalog 280 Euros. 5171 EP GERMANY (1968) Cross with roots*. 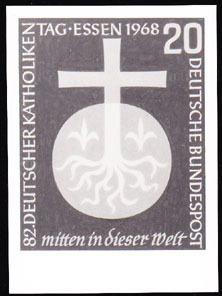 Photo essay (See Note) of unaccepted design for 82nd meeting of German Catholics. Scott No 989, Yvert No 433. 5267 EP EAST GERMANY (1968) Venus 4*. Pair of imperforate margin phase proofs in final colors separated by gutter. Scott No 985, Yvert No 1040. Michel catalog 160 Euros. 5268 EP EAST GERMANY (1968) Venus 4*. Kosmos satellites*. Set of 2 imperforate margin phase proofs in final colors. Scott Nos 985-6, Yvert Nos 1040-1. Michel catalog 160 Euros. 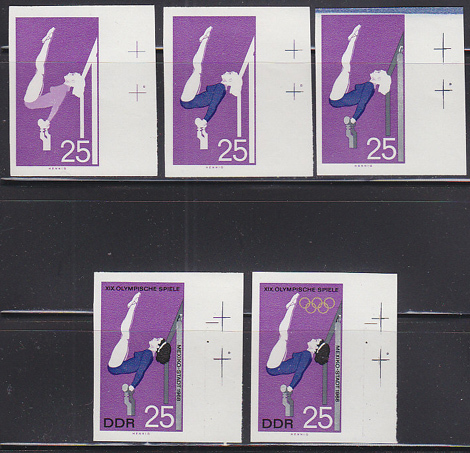 5360 EP EAST GERMANY (1968) Woman gymnast*. Imperforate phase proof in final colors. Scott No 1044, Yvert No 1103. Michel catalog 90 Euros. 5361 EP EAST GERMANY (1968) Woman gymnast*. Strip of 4 imperforate phase proofs in final colors with gutter. Scott No 1044, Yvert No 1103. Michel catalog 360 Euros. 5382 EP EAST GERMANY (1968) Sculler*. Imperforate phase proof in final colors. Scott No 1046, Yvert No 1105. Michel catalog 90 Euros. 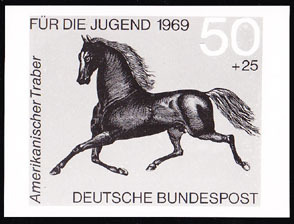 5384 EP GERMANY (1968) von Langen*. 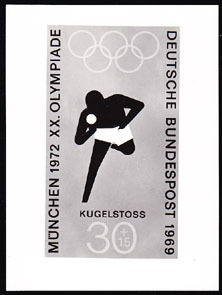 Photo essay (See Note) of unaccepted design for promotion of Munich Olympics. Scott No B434, Yvert No 426. 5385 EP GERMANY (1968) Rudolf Harbig**. 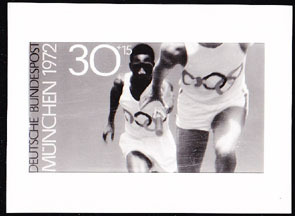 Photo essay (See Note) of unaccepted design for promotion of Munich Olympics. Scott No B435, Yvert No 428. 5456 EP EAST GERMANY (1968) Soccer player*. Imperforate phase proof in final colors. Scott No B150, Yvert No 1102. Michel catalog 90 Euros. 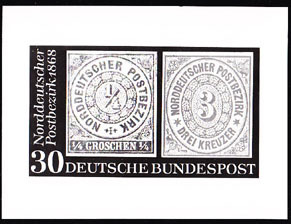 5493 EP GERMANY (1968) Stamps of North German Confederation*. 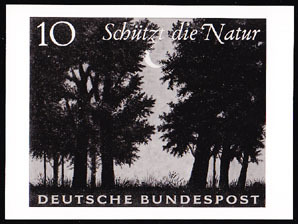 Photo essay (See Note) of unaccepted design for 100th anniversary of first postage stamps. Scott No 990, Yvert No 435. 6373 EP EAST GERMANY (1968) "The Liberation"*. Imperforate margin phase proof in final colors. Scott No 988, Yvert No 1042. Michel catalog 70 Euros. 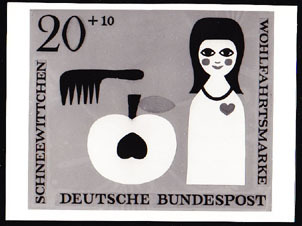 7040 EP GERMANY (1968) Symbols of various crafts*. 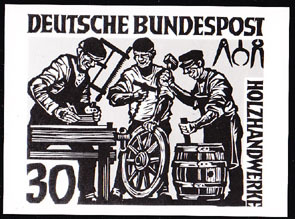 Archive photo (See Note) of unaccepted design for Tradition of Crafts and Trades stamp. Measures 120 x 90 cm. Scott No 981, Yvert No 418. This one is closer to the final design. 7517 EP EAST GERMANY (1968) Fort Breendock Concentration Camp Monument*. Imperforate phase proof in final colors. Scott No 1047, Yvert No 1106. 7674 EP EAST GERMANY (1968) Vietcong soldier*. Baby*. Series of 4 progressive imperforate color proofs, including final colors. Scott No B147, Yvert No 1064. 9019 EP EAST GERMANY (1968) Mountain Farmers Mowing*. Set of 4 imperforate progressive proofs. Painting by Egger-Lienz. Scott No 1033, Yvert No 1090. 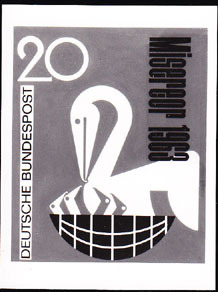 These imperforate proofs from the archives of the former East German printer are very rare (only about 10 copies exist). 9377 EP EAST GERMANY (1968) Fighters of the Underground*. Set of 5 imperforate progressive proofs. Museum of the Resistance. Scott No 988, Yvert No 1042. 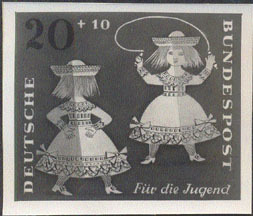 These imperforate proofs from the archives of the former East German printer are very rare (only about 10 copies exist). 9378 EP EAST GERMANY (1968) The Partisans*. Set of 5 imperforate progressive proofs. Museum of the Resistance. Scott No 990, Yvert No 1044. 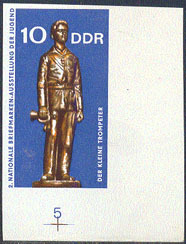 These imperforate proofs from the archives of the former East German printer are very rare (only about 10 copies exist). 9541 EP EAST GERMANY (1968) Trener stunt plane*. 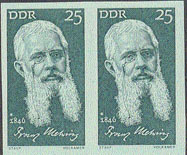 Series of 4 imperforate progressive proof pairs plus 1 single, including final colors. Scott No 1030, Yvert No 1087. 10183 EP EAST GERMANY (1968) Fisherman*. Set of 3 imperforate progressive proofs. EUropean Angling Championship. Scott No 1013, Yvert No 1068. 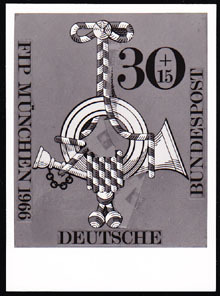 These imperforate proofs from the archives of the former East German printer are very rare (only about 10 copies exist). 10639 EP EAST GERMANY (1968) Semmelweiss*. Imperforate proof. 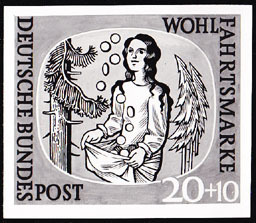 Semmelweiss introduced the practice of washing the hands when delivering babies to reduce the incidence of puerperal fever. Scott No 1028, Yvert No 1085. 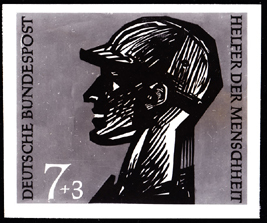 These imperforate proofs from the archives of the former East German printer are very rare (only about 10 copies exist). 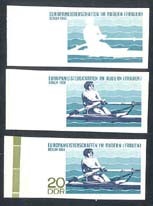 11320 EP EAST GERMANY (1968) Woman sculler*. Set of 3 imperforate progressive proofs. European Women's Sculling Championship. Scott No 1012, Yvert No 1069. 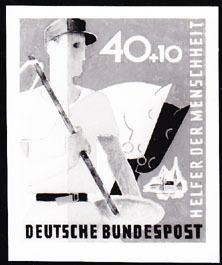 These imperforate proofs from the archives of the former East German printer are very rare (only about 10 copies exist). 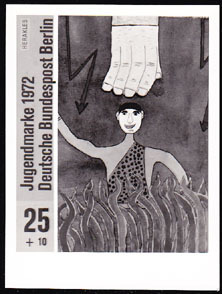 11385 EP EAST GERMANY (1968) Gymnast*. Set of 5 imperforate progressive proofs. Mexico Olympics. Scott No 1044, Yvert No 1103. 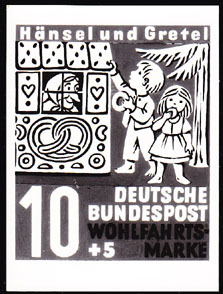 These imperforate proofs from the archives of the former East German printer are very rare (only about 10 copies exist). 11386 EP EAST GERMANY (1968) Sculler*. Set of 4 imperforate progressive proofs. Mexico Olympics. Scott No 1046, Yvert No 1105. 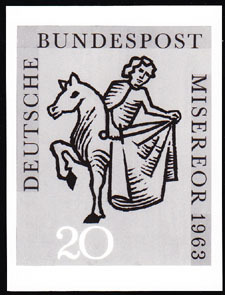 These imperforate proofs from the archives of the former East German printer are very rare (only about 10 copies exist). 11458 EP EAST GERMANY (1968) Luge*. 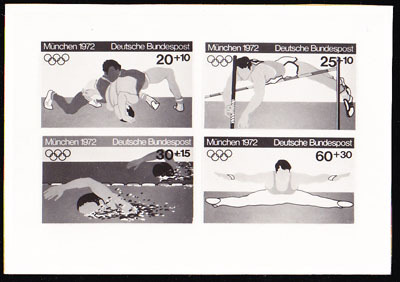 Set of three progressive proofs of Winter Olympics issue, Scott No B146, Yvert No 1032. 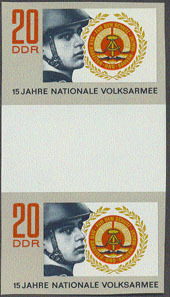 First stamp shows printing in red (value and top of luger's helmet), second shows red + blue, and the third shows the complete stamp. All imperforate. Rare! 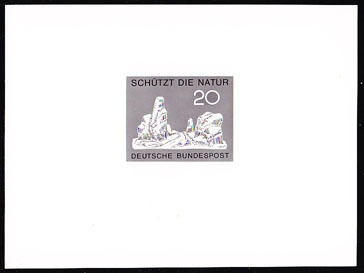 15982 EP EAST GERMANY (1968b) P�hl Dam*. 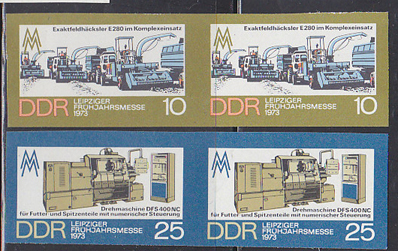 Set of 4 imperforate progressive proofs from the archives of the East German printers. Each proof shows the addition of a single color. Scott No 1040, Yvert No 1097. Only about 10 copies exist. Rare! 15983 EP EAST GERMANY (1968c) Ohra Dam*. 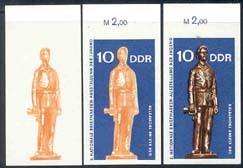 Set of 4 imperforate progressive proofs from the archives of the East German printers. Each proof shows the addition of a single color. Scott No 1041, Yvert No 1098. Only about 10 copies exist. Rare! 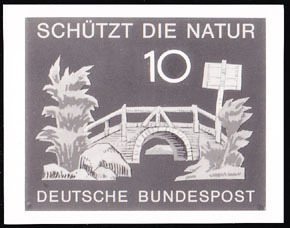 15984 EP EAST GERMANY (1968d) Rappbode Dam*. 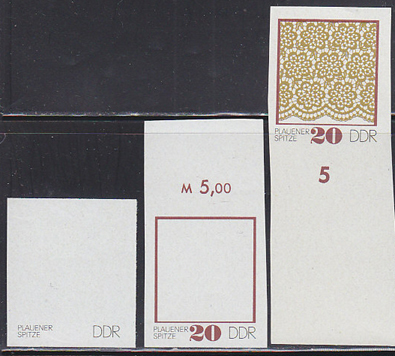 Set of 4 imperforate progressive proofs from the archives of the East German printers. Each proof shows the addition of a single color. Scott No 1042, Yvert No 1099. Only about 10 copies exist.Rare! 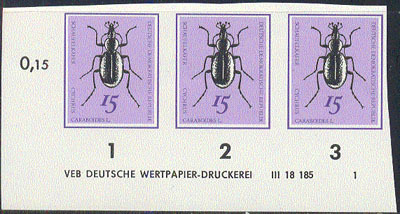 16428 EP EAST GERMANY (1968) Beetles*. Set of 6 imperforate proofs from the archives of the printer. We sold a similar set with additional progressive proofs for over $1000 in sale 24! Scott Nos 1048-53, Yvert Nos 1107-12. Stunning! 440 EP EAST GERMANY (1969) Train crossing signal*. Series of 6 progressive imperforate color proofs, including final colors. Scott No 1083, Yvert No 1142. 739 EP EAST GERMANY (1969) Rococo palace - Dornburg*. 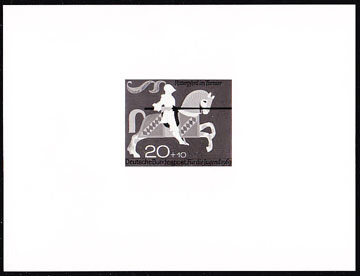 Imperforate progressive proof (incomplete). Scott No 1075, Yvert No 1134. 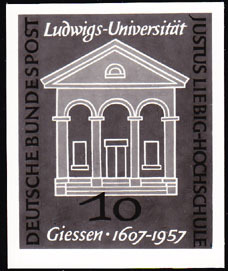 1069 EP EAST GERMANY (1969) Rostock University*. Set of 6 imperforate progressive proofs, including final colors. Scott No 1150, Yvert No 1212. 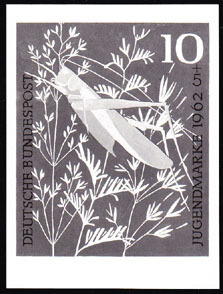 1514 EP EAST GERMANY (1969) Cicindella campestris*. 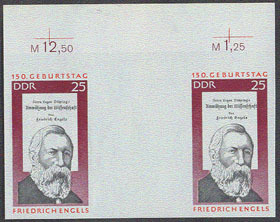 Pair of imperforate progressive proofs, including final colors. Scott No 1048, Yvert No 1107. 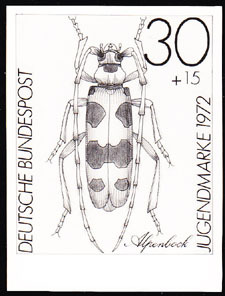 1515 EP EAST GERMANY (1969) Cychrus caraboides*. 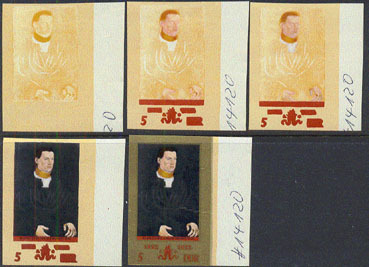 Strip of 3 imperforate progressive proofs in final colors. Scott No 1049, Yvert No 1108. 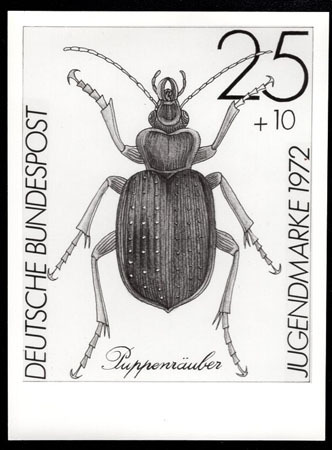 1516 EP EAST GERMANY (1969) Carabus arcensus herbst*. Set of 2 imperforate progressive proofs. Scott No 1051, Yvert No 1110. 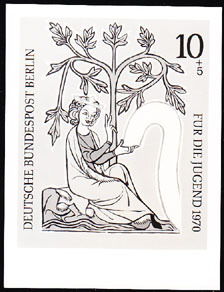 1517 EP EAST GERMANY (1969) Hister bipustulatus*. 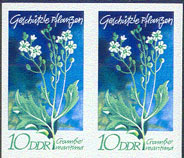 Imperforate proof in issued colors (missing dark green). Scott No 1052, Yvert No 1111. 1518 EP EAST GERMANY (1969) Pseudoclerops mutillarius*. Set of 2 imperforate progressive proofs. Scott No 1053, Yvert No 1112. 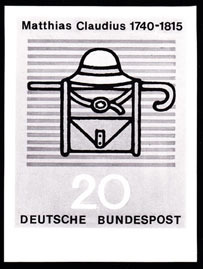 2027 EP EAST GERMANY (1969) Pottsdam*. Series of 3 progressive imperforate color proofs. Scott No 1131, Yvert No 1193. 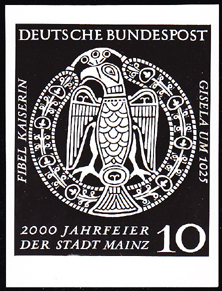 2028 EP EAST GERMANY (1969) Karl-Marx Stadt*. 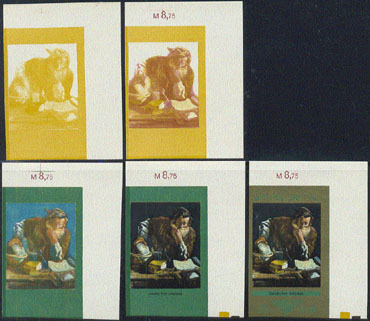 Series of 8 progressive imperforate color proofs, including final colors. Scott No 1139, Yvert No 1201. 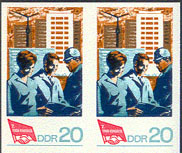 2155 EP EAST GERMANY (1969) Red Cross*. Red Crescent*. Lion with sword*. Sun*. Set of 4 imperforate progressive proofs. 50th anniversary of League of Red Cross Societies. Scott No 1100, Yvert No 1159. 2431 EP EAST GERMANY (1969) Gymnasts*. Series of 4 progressive imperforate color proofs, including final colors. 5th Gymnastic & Sports Festival. Scott No 1120, Yvert No 1181. 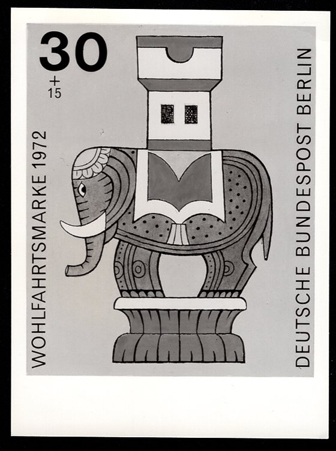 3238 EP EAST GERMANY (1969) Otto Nagel*. Imperforate phase proof margin pair in final colors. Scott No 1078, Yvert No 1137. Michel catalog 150 Euros. 3239 EP EAST GERMANY (1969) "Siberian Teacher" by Sveshnikov*. Imperforate phase proof pair in final colors. Scott No 1160, Yvert No 1221. 3240 EP EAST GERMANY (1969) "Still Life" by Aslamasjan*. Imperforate phase proof pair with gutter in final colors. Scott No 1162, Yvert No 1223. 3241 EP EAST GERMANY (1969) "Hot Day" by Romas*. Imperforate phase proof pair with gutter in final colors. Scott No 1163, Yvert No 1224. 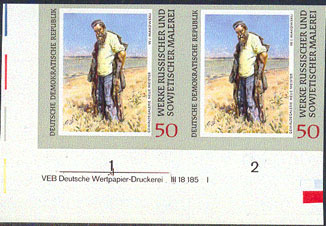 3242 EP EAST GERMANY (1969) "Man on Riverbank" by Makovskii*. Imperforate phase proof pair with gutter in final colors. Scott No 1165, Yvert No 1226. 3330 EP EAST GERMANY (1969) Martin Andersen Nex�*. Imperforate phase proof pair in final colors with gutter. Scott No 1077, Yvert No 1136. Michel catalog 150 Euros. 3331 EP EAST GERMANY (1969) Theodor Fontane*. Imperforate phase proof pair with gutter in final colors with gutter. Scott No 1080, Yvert No 1139. Michel catalog 150 Euros. 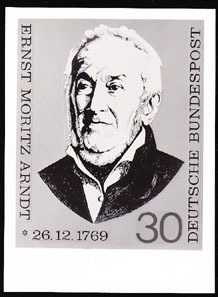 3354 EP GERMANY (1969) Ernst Moritz Arndt*. 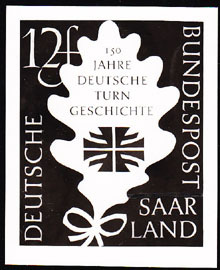 Photo essay (See Note) of unaccepted design for 100th anniversary of birth of founder of German Nationalism and opposer of serfdom and Napoleonic rule. Scott No 1013, Yvert No 474. Very similar to final design! 3449 EP GERMANY (1969) Plane*. Posthorn*. 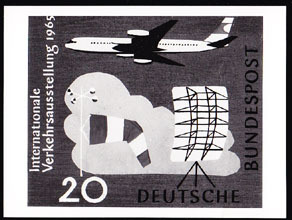 Photo essay (See Note) of unaccepted design for 50th anniversary of German airmail service. Scott No 993, Yvert No PA1. 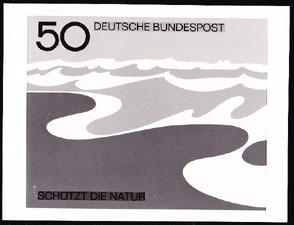 3840 EP GERMANY (1969) Seashore*. Photo essay (See Note) of unaccepted design for Nature Protection series. Scott No 1000, Yvert No 454. 3841 EP GERMANY (1969) Trees*. Photo essay (See Note) of unaccepted design for Nature Protection series. Scott No 1000, Yvert No 454. 3842 EP GERMANY (1969) Old bridge*. Photo essay (See Note) of unaccepted design for Nature Protection series. Scott No 1000, Yvert No 454. 3843 EP GERMANY (1969) Foothills*. Photo essay (See Note) of unaccepted design for Nature Protection series. Scott No 1001, Yvert No 455. 3844 EP GERMANY (1969) Stylised tree*. Photo essay (See Note) of unaccepted design for Nature Protection series. Scott No 1002, Yvert No 456. 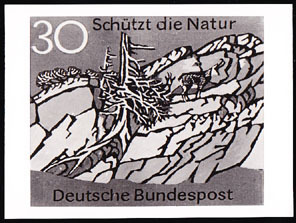 3845 EP GERMANY (1969) Mountain*. Goat*. Photo essay (See Note) of unaccepted design for Nature Protection series. Scott No 1002, Yvert No 456. 3846 EP GERMANY (1969) Mountains*. Photo essay (See Note) of unaccepted design for Nature Protection series. Scott No 1002, Yvert No 456. 3847 EP GERMANY (1969) Mountains*. Photo essay (See Note) of unaccepted design for Nature Protection series. Scott No 1002, Yvert No 456. 3848 EP GERMANY (1969) Sailboats on lake*. Photo essay (See Note) of unaccepted design for Nature Protection series. Scott No 1003, Yvert No 457. 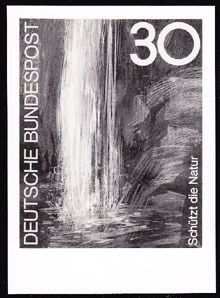 3849 EP GERMANY (1969) Waterfall*. Photo essay (See Note) of unaccepted design for Nature Protection series. Scott No 1003, Yvert No 457. 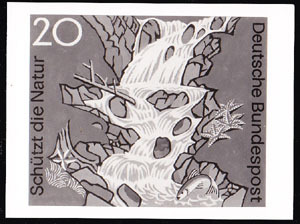 3850 EP GERMANY (1969) Babbling brook*. Photo essay (See Note) of unaccepted design for Nature Protection series. Scott No 1003, Yvert No 457. 3851 EP GERMANY (1969) Stylised water*. Photo essay (See Note) of unaccepted design for Nature Protection series. Scott No 1003, Yvert No 457. 3852 EP GERMANY (1969) Tree*. Mountains*. Photo essay (See Note) of unaccepted design for Nature Protection series. Scott No 1003, Yvert No 457. 4173 EP EAST GERMANY (1969) Spring snowflake*. Imperforate phase proof strip of 4 with gutter in final colors. Scott No 1093, Yvert No 1152. Michel catalog 360 Euros. 4174 EP EAST GERMANY (1969) Adonis*. Imperforate phase proof strip of 3 in final colors. Scott No 1094, Yvert No 1153. Michel catalog 270 Euros. 4175 EP EAST GERMANY (1969) Garden Turk's cap*. Imperforate phase proof pair with gutter in final colors. Scott No 1095, Yvert No 1154. Michel catalog 180 Euros. 4176 EP EAST GERMANY (1969) Button snakeroot*. Imperforate phase proof strip of 3 in final colors. Scott No 1097, Yvert No 1156. Michel catalog 270 Euros. 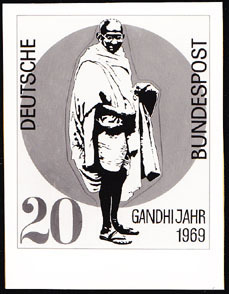 4326 EP GERMANY (1969) Gandhi*. Photo essay (See Note) of unaccepted design for centennial of birth. Scott No 1012, Yvert No 468. 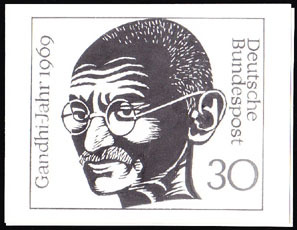 4327 EP GERMANY (1969) Head of Gandhi*. Photo essay (See Note) of unaccepted design for centennial of birth. Scott No 1012, Yvert No 468. 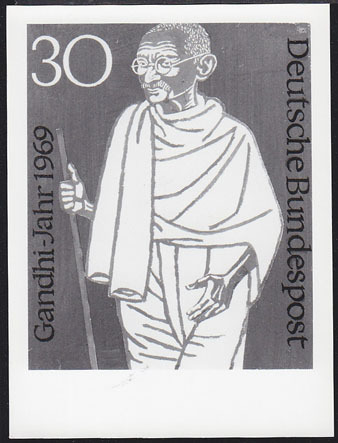 4328 EP GERMANY (1969) Gandhi with long staff*. Photo essay (See Note) of unaccepted design for centennial of birth. Scott No 1012, Yvert No 468. 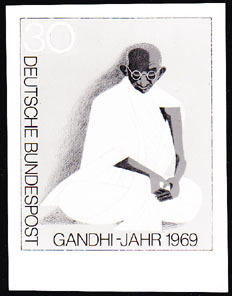 4329 EP GERMANY (1969) Gandhi meditating*. Photo essay (See Note) of unaccepted design for centennial of birth. Scott No 1012, Yvert No 468. 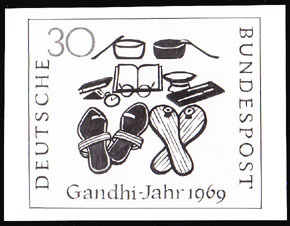 4330 EP GERMANY (1969) Symbols of Gandhi (cookware, books, sandals, glasses, beggar's bowl)*. Photo essay (See Note) of unaccepted design for centennial of birth. Scott No 1012, Yvert No 468. 4398 EP GERMANY (1969) Horses pulling cart*. Photo essay (See Note) of unaccepted design for horse series benefiting youth organizations. Scott No B442, Yvert No 441. 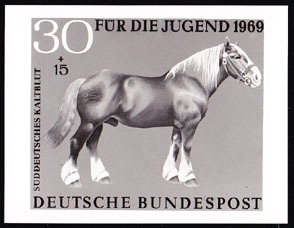 4399 EP GERMANY (1969) Haflinger horse*. Photo essay (See Note) of unaccepted design for horse series benefiting youth organizations. Scott No B442, Yvert No 441. 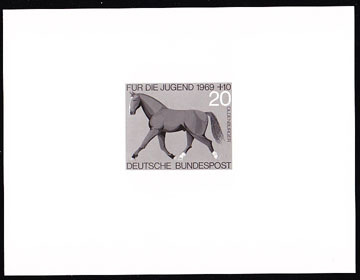 4400 EP GERMANY (1969) Oberlander horse*. Photo essay (See Note) of unaccepted design for horse series benefiting youth organizations. Scott No B442, Yvert No 441. 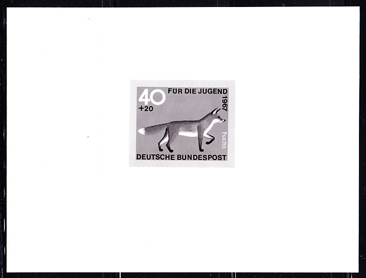 4401 EP GERMANY (1969) Black forest Fuchs horse*. Photo essay (See Note) of unaccepted design for horse series benefiting youth organizations. Scott No B443, Yvert No 442. 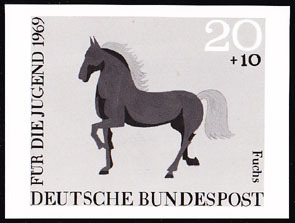 4402 EP GERMANY (1969) Oldenburger horse*. Photo essay (See Note) of unaccepted design for horse series benefiting youth organizations. Scott No B443, Yvert No 442. 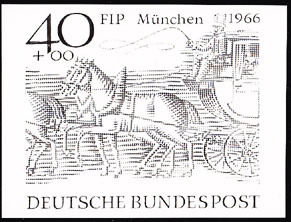 4403 EP GERMANY (1969) Knight on horseback with lance*. Photo essay (See Note) of unaccepted design for horse series benefiting youth organizations. Scott No B443, Yvert No 442. 4404 EP GERMANY (1969) Austrian stallion*. Photo essay (See Note) of unaccepted design for horse series benefiting youth organizations. Scott No B443, Yvert No 442. 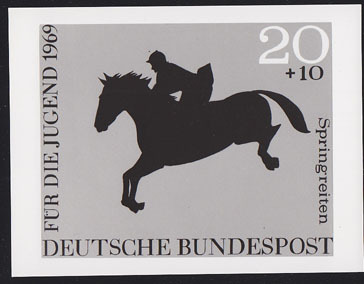 4405 EP GERMANY (1969) Jockey riding horse*. Photo essay (See Note) of unaccepted design for horse series benefiting youth organizations. Scott No B444, Yvert No 443. 4406 EP GERMANY (1969) South German Coldblood*. Photo essay (See Note) of unaccepted design for horse series benefiting youth organizations. Scott No B444, Yvert No 443. 4407 EP GERMANY (1969) Horse with pompoms*. Photo essay (See Note) of unaccepted design for horse series benefiting youth organizations. Scott No B444, Yvert No 443. 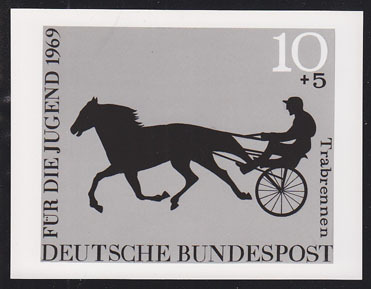 4408 EP GERMANY (1969) Trotting race*. Photo essay (See Note) of unaccepted design for horse series benefiting youth organizations. Scott No B444, Yvert No 443. 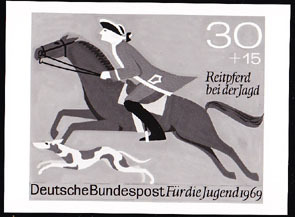 4409 EP GERMANY (1969) Riding to hunt with hound*. Photo essay (See Note) of unaccepted design for horse series benefiting youth organizations. Scott No B444, Yvert No 443. 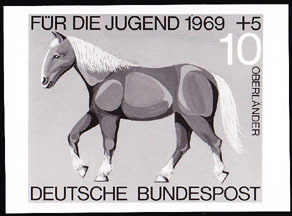 4410 EP GERMANY (1969) Circus horse*. Photo essay (See Note) of unaccepted design for horse series benefiting youth organizations. Scott No B444, Yvert No 443. 4411 EP GERMANY (1969) American trotter horse*. Photo essay (See Note) of unaccepted design for horse series benefiting youth organizations. Scott No B445, Yvert No 444. 4412 EP GERMANY (1969) Race horse*. Photo essay (See Note) of unaccepted design for horse series benefiting youth organizations. Scott No B445, Yvert No 444. 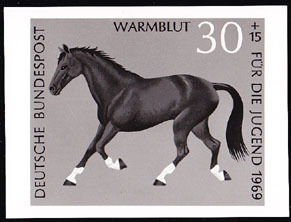 4413 EP GERMANY (1969) Warmblood*. Photo essay (See Note) of unaccepted design for horse series benefiting youth organizations. Scott No B445, Yvert No 443. 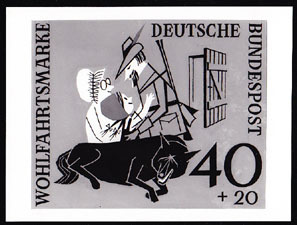 4414 EP GERMANY (1969) Horse leaping gate*. Photo essay (See Note) of unaccepted design for horse series benefiting youth organizations. Scott No B445, Yvert No 444. 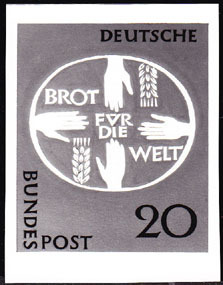 4451 EP GERMANY (1969) ILO emblem*. 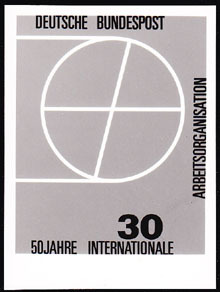 Photo essay (See Note) of unaccepted design for ILO 50th anniversary. Scott No 995, Yvert No 445. 4452 EP EAST GERMANY (1969) Hand holding wrench*. Imperforate phase proof in final colors. ILO 50th anniversary. Scott No 1152, Yvert No 1210. Michel catalog 75 Euros. 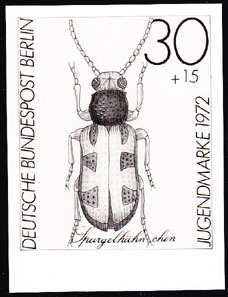 4464 EP EAST GERMANY (1969) Cychrus caraboides*. Set of 3 imperforate progressive proofs including final colors. Scott No 1049, Yvert No 1108. 4754 EP EAST GERMANY (1969) Erythrite*. Imperforate phase proof pair with gutter in final colors. Scott No 1105, Yvert No 1164. Michel catalog 180 Euros. 4936 EP GERMANY (1969) Rothenburg*. Photo essay (See Note) of unaccepted design for founding of Bavarian town. Scott No 1010, Yvert No 464. 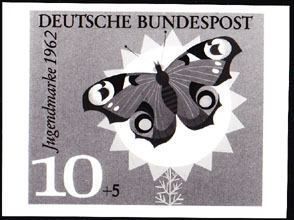 4937 EP EAST GERMANY (1969) Neubrandenburg*. Imperforate phase proof pair with gutter in final colors. Scott No 1130, Yvert No 1192. Michel catalog 160 Euros. 4938 EP EAST GERMANY (1969) Hoyerswerda*. Imperforate phase proof pair with gutter in final colors. Scott No 1133, Yvert No 1195. Michel catalog 160 Euros. 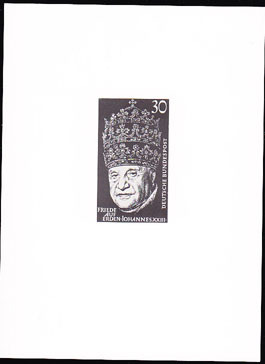 5015 EP GERMANY (1969) Pope John XXIII in tall hat*. Photo essay (See Note) of unaccepted design for issue with inscription "Peace on Earth". Scott No 1011, Yvert No 467. 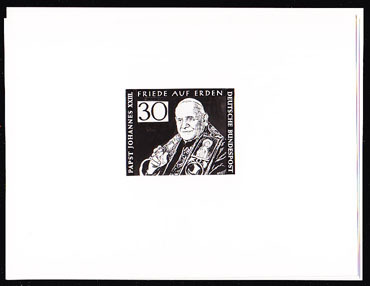 5016 EP GERMANY (1969) Pope John XXIII with hand giving blessing*. Photo essay (See Note) of unaccepted design for issue with inscription "Peace on Earth". Scott No 1011, Yvert No 467. 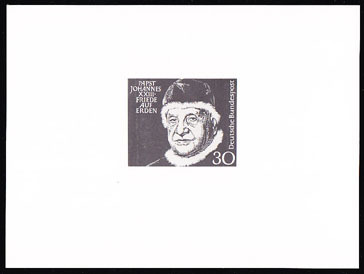 5017 EP GERMANY (1969) Pope John XXIII in fur-lined hat and vestments*. Photo essay (See Note) of unaccepted design for issue with inscription "Peace on Earth". Scott No 1011, Yvert No 467. 5065 EP EAST GERMANY (1969) Television tower*. Imperforate phase proof pair with gutter in final colors. Scott No 1142, Yvert No 1203. Michel catalog 160 Euros. 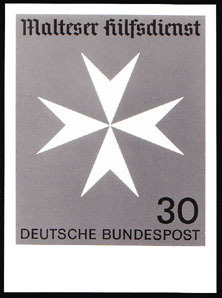 5093 EP GERMANY (1969) Maltese cross*. 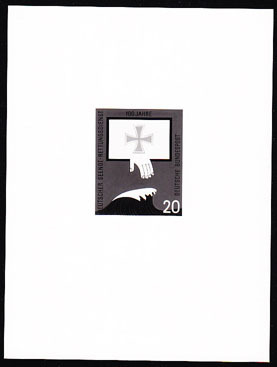 Photo essay (See Note) of unaccepted design for Maltese Relief Service. Scott No 1006, Yvert No 460. 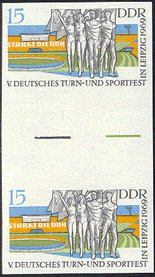 5319 EP EAST GERMANY (1969) Athletes*. Imperforate phase proof pair with gutter in final colors. 5th Gymnastic & Sports Festival. Scott No 1119, Yvert No 1180. Michel catalog 160 Euros. 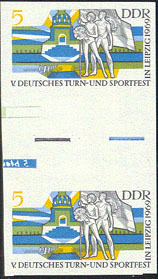 5320 EP EAST GERMANY (1969) Athletes*. Imperforate phase proof pair with gutter in final colors. 5th Gymnastic & Sports Festival. Scott No 1120, Yvert No 1182. Michel catalog 160 Euros. 5321 EP EAST GERMANY (1969) Athletes*. Imperforate phase proof in final colors. 5th Gymnastic & Sports Festival. Scott No 1122, Yvert No 1184. Michel catalog 80 Euros. 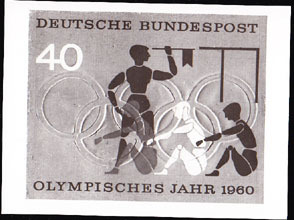 5322 EP EAST GERMANY (1969) Athletes*. Imperforate phase proof strip of 4 with gutter in final colors. 5th Gymnastic & Sports Festival. Scott No B153, Yvert No 1183. Michel catalog 320 Euros. 5362 EP EAST GERMANY (1969) Gymnasts*. Imperforate phase proof pair with gutter in final colors. 5th Gymnastic & Sports Festival. Scott No B152, Yvert No 1181. Michel catalog 160 Euros. 5389 EP GERMANY (1969) Runners*. 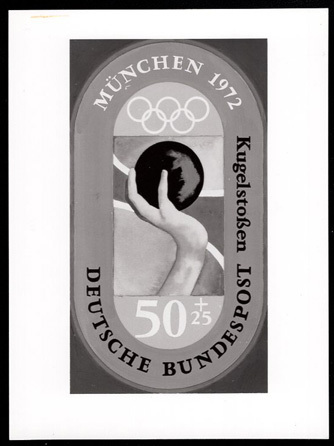 Photo essay (See Note) of unaccepted design promoting Munich Olympics. Scott No B447, Yvert No 451. 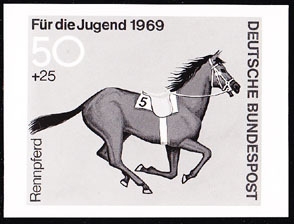 5390 EP GERMANY (1969) Hurdlers*. 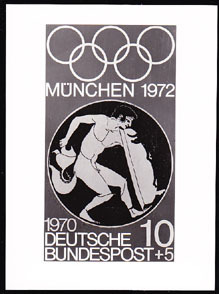 Photo essay (See Note) of unaccepted design promoting Munich Olympics. Scott No B447, Yvert No 451. 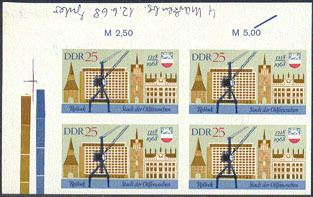 5391 EP GERMANY (1969) Hammer throw*. 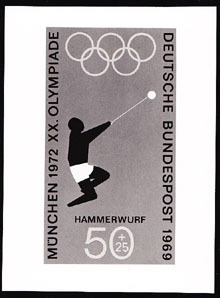 Photo essay (See Note) of unaccepted design promoting Munich Olympics. Scott No B447, Yvert No 451. 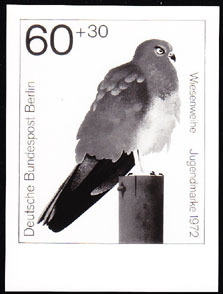 5392 EP GERMANY (1969) Discus throw*. 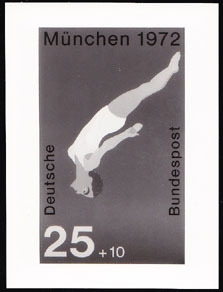 Photo essay (See Note) of unaccepted design promoting Munich Olympics. Scott No B447, Yvert No 451. 5393 EP GERMANY (1969) Shot put*. 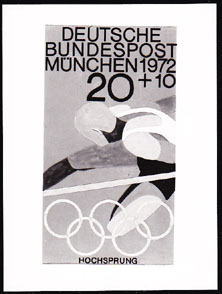 Photo essay (See Note) of unaccepted design promoting Munich Olympics. Scott No B447, Yvert No 451. 5394 EP GERMANY (1969) Oak leaf*. Acorn*. 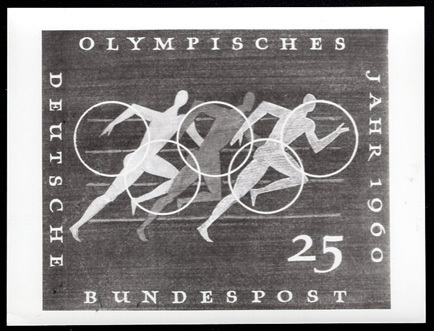 Photo essay (See Note) of unaccepted design promoting Munich Olympics. Scott No B448, Yvert No 452. 5395 EP GERMANY (1969) Long jump*. 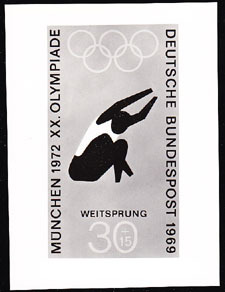 Photo essay (See Note) of unaccepted design promoting Munich Olympics. Scott No B448, Yvert No 452. 5396 EP GERMANY (1969) Rowing*. 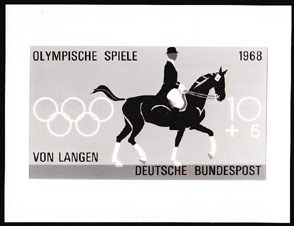 Photo essay (See Note) of unaccepted design promoting Munich Olympics. Scott No B449, Yvert No 453. 5457 EP GERMANY (1969) Soccer players*. 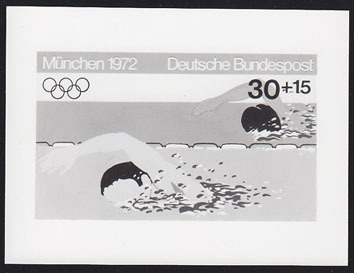 Photo essay (See Note) of unaccepted design promoting Munich Olympics. Scott No B448, Yvert No 452. 5483 EP EAST GERMANY (1969) Volleyball*. Imperforate phase proof in final colors. 2nd Volleyball World Cup. Scott No 1127, Yvert No 1189. Michel catalog 80 Euros. 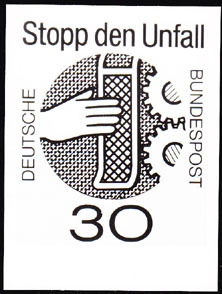 5503 EP EAST GERMANY (1969) Emblem of German Philatelic Society*. Imperforate phase proof pair in final colors. Scott No 1115, Yvert No 1174. 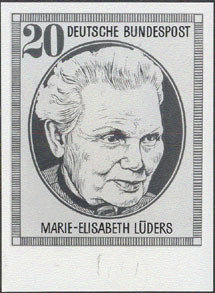 5708 EP GERMANY (1969) Marie-Elisabeth Luders*. 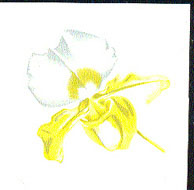 Photo essay (See Note) of unaccepted design for triptych honoring woman's suffrage. Scott No 1007b, Yvert No 462. 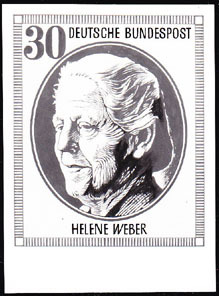 5709 EP GERMANY (1969) Helene Weber*. Photo essay (See Note) of unaccepted design for triptych honoring woman's suffrage. Scott No 1007c, Yvert No 463. 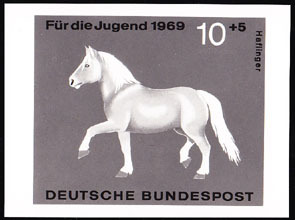 6932 EP EAST GERMANY (1969) Horse*. Black couple*. 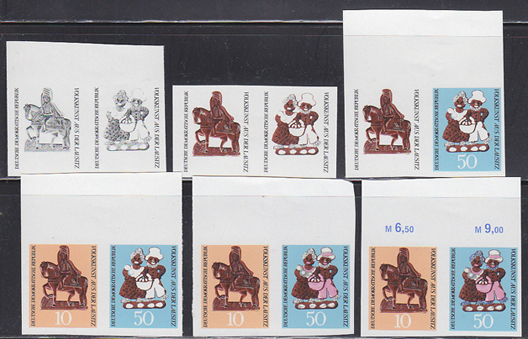 Set of 6 imperforate progressive proof pairs, including final colors. Christmas cookie molds. Scott Nos 1154-5, Yvert Nos 1214,1216. 7676 EP EAST GERMANY (1969) Vietcong*. Series of 4 progressive imperforate color proofs, including final colors. Scott No B151, Yvert No 1178. 8747 EP GERMANY (1969) Marie-Elisabeth Luders*. Archive photo (See Note) of unaccepted design for woman who was one of the most important promoters of women's rights and a member of the Reichstag. Measures 90 x 120 mm. Scott No 1007a. 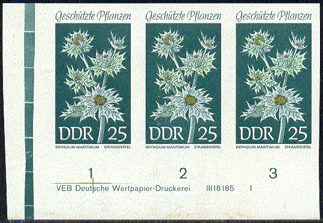 10212 EP EAST GERMANY (1969) Spring Snowflake*. Set of 4 imperforate progressive proofs. Protected plants series. Scott No 1093, Yvert No 1152. 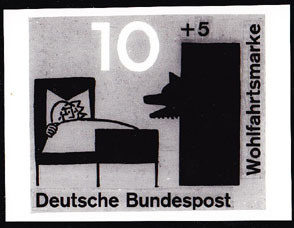 These imperforate proofs from the archives of the former East German printer are very rare(only about 10 copies exist). 10213 EP EAST GERMANY (1969) Globeflowers*. Set of 4 imperforate progressive proofs. Protected plants series. Scott No 1095, Yvert No 1154. 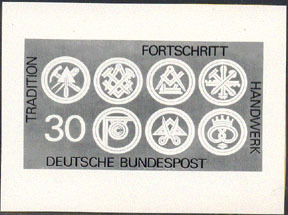 These imperforate proofs from the archives of the former East German printer are very rare (only about 10 copies exist). 10214 EP EAST GERMANY (1969) Garden Turk's Cap*. Set of 5 imperforate progressive proofs. Protected plants series. Scott No 1096, Yvert No 1155. 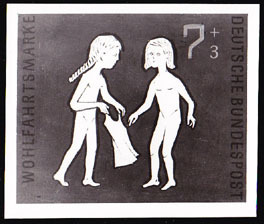 These imperforate proofs from the archives of the former East German printer are very rare (only about 10 copies exist). 10215 EP EAST GERMANY (1969) Button Snakeroot*. Set of 5 imperforate progressive proofs. Protected plants series. Scott No 1097, Yvert No 1156. 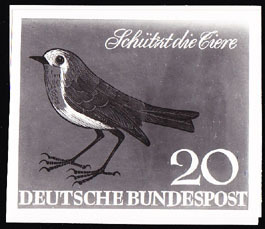 These imperforate proofs from the archives of the former East German printer are very rare(only about 10 copies exist). 10723 EP EAST GERMANY (1969a) Erythrite*. Set of 5 imperforate progressive proofs. Scott No 1105, Yvert No 1164. 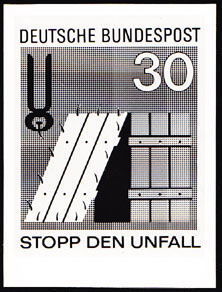 These imperforate proofs from the archives of the former East German printer are very rare (only about 10 copies exist). 10724 EP EAST GERMANY (1969c) Smoky quartz*. Set of 4 imperforate progressive proofs. Scott No 1108, Yvert No 1167. 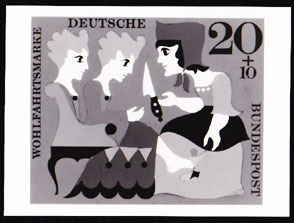 These imperforate proofs from the archives of the former East German printer are very rare (only about 10 copies exist). 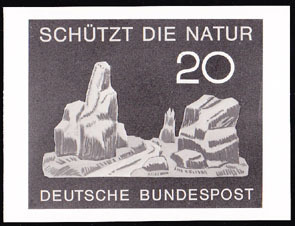 10725 EP EAST GERMANY (1969d) Calcite*. Set of 5 imperforate progressive proofs. Scott No 1109, Yvert No 1168. 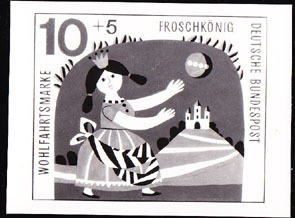 These imperforate proofs from the archives of the former East German printer are very rare (only about 10 copies exist). 11322 EP EAST GERMANY (1969) Gymnasts*. Set of 4 imperforate progressive proofs. 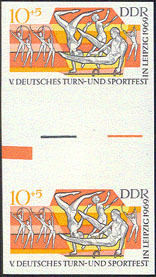 5th Leipzig Sports Festival. Scott No B152, Yvert No 1179. 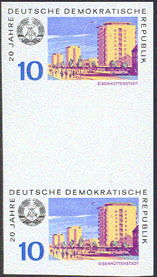 These imperforate proofs from the archives of the former East German printer are very rare (only about 10 copies exist). 778 EP EAST GERMANY (1970) Mexican clay jaguar figurine*. Imperforate phase proof in final colors. Scott No 1261, Yvert No 1325. 1265 EP EAST GERMANY (1970) Flags*. Building*. Set of 3 imperforate progressive proofs, including final colors. Mutual Economic Aid. Scott No 1202, Yvert No 1263. 1498 EP EAST GERMANY (1970) World map*. Medal*. Fritz Heckert*. Set of 2 imperforate progressive proof pairs in final colors. German Trade Unions. Scott Nos 1208-9, Yvert Nos 1268-9. 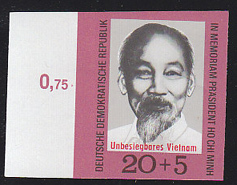 1650 EP EAST GERMANY (1970) Ho-Chi Minh*. Imperforate phase proof in issued colors. Scott No B159, Yvert No 1281. 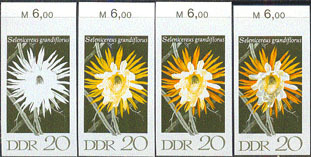 2050 EP EAST GERMANY (1970) Selenicereus grandiflorus*. Set of 4 imperforate progressive proofs including final colors. Flowering cacti.. Scott No 1254, Yvert No 1319. 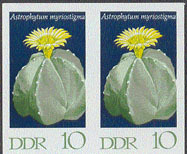 2051 EP EAST GERMANY (1970) Hamatocactus setispinus*. Set of 4 imperforate progressive proofs including final colors. Flowering cacti.. Scott No 1255, Yvert No 1320. 3068 EP EAST GERMANY (1970) Mink*. Imperforate phase proof pair with gutter in final colors. Scott No 1174, Yvert No 1236. 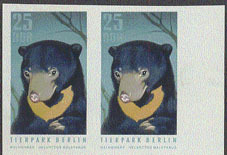 3069 EP EAST GERMANY (1970) Malayan sun bear*. Imperforate phase proof pair in final colors. Berlin Zoo animals. Scott No 1246, Yvert No 1311. 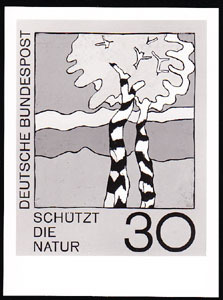 3243 EP EAST GERMANY (1970) "Forest worker Scharf's Birthday" by Nagel*. Imperforate phase proof in final colors. Scott No 1234, Yvert No 1286. 3244 EP EAST GERMANY (1970) "Portrait of a Young Girl" by Nagel*. Imperforate phase proof pair with gutter in final colors. Scott No 1235, Yvert No 1287. 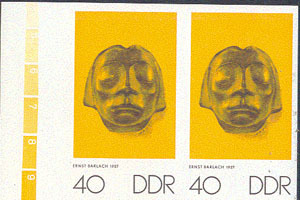 3293 EP EAST GERMANY (1970) Ernst Barlach*. Imperforate phase proof pair with gutter in final colors. Scott No 1166, Yvert No 1228. 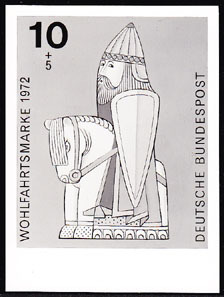 3294 EP EAST GERMANY (1970) "Head from Gustrow Memorial" by Barlach*. Imperforate phase proof pair in final colors. Scott No 1237, Yvert No 1289. 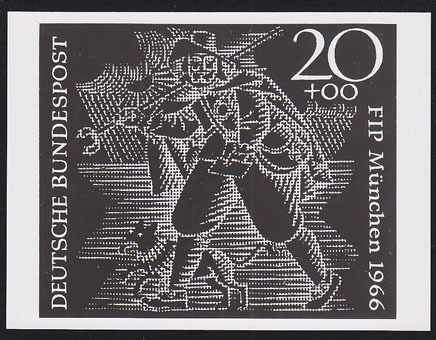 3295 EP EAST GERMANY (1970) "The Flutist" by Barlach*. Imperforate phase proof pair with gutter in final colors. Scott No 1238, Yvert No 1290. 3332 EP EAST GERMANY (1970) Kurt Tucholsky*. Imperforate phase proof in final colors. Scott No 1168, Yvert No 1230. 3355 EP EAST GERMANY (1970) Friedrich H�lderlin*. Imperforate phase proof pair with gutter in final colors. Scott No 1170, Yvert No 1232. 3691 EP EAST GERMANY (1970) Mexican clay jaguar figurine*. Imperforate phase proof pair in final colors. Scott No 1261, Yvert No 1325. 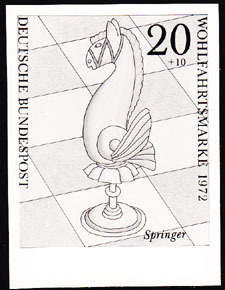 3702 EP GERMANY (1970) Chess pieces*. Photo essay (See Note) of unaccepted design for welfare organizations issue. Scott No B465, Yvert No 503. 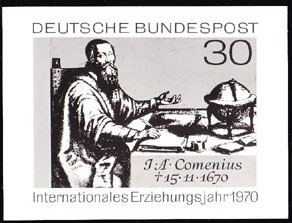 3932 EP GERMANY (1970) Comenius*. Globe*. Manuscript*. Photo essay (See Note) of unaccepted design for 300th anniversary of death of theologian and champion of universal education. Scott No 1050, Yvert No 520. 4063 EP GERMANY (1970) Fireman*. Photo essay (See Note) of unaccepted design honoring voluntary services. Scott No 1025, Yvert No 492. 4177 EP EAST GERMANY (1970) Sea kale*. Imperforate phase proof pair in final colors. Scott No 1194, Yvert No 1255. Michel catalog 180 Euros. 4178 EP EAST GERMANY (1970) European pasqueflower*. Imperforate phase proof pair with gutter in final colors. Scott No 1195, Yvert No 1256. Michel catalog 180 Euros. 4179 EP EAST GERMANY (1970) Round-leaved wintergreen*. Imperforate phase proof strip of 4 with gutter in final colors. Scott No 1199, Yvert No 1260. Michel catalog 360 Euros. 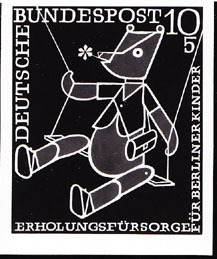 4310 EP GERMANY (Berlin) (1970) Puppets*. Photo essay (See Note) of unaccepted design for puppet issue. Scott No 9NB74, Yvert No 335. 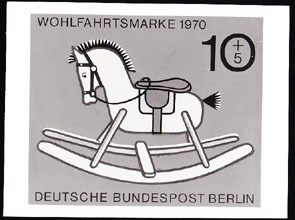 4311 EP GERMANY (Berlin) (1970) Rocking horse*. Photo essay (See Note) of unaccepted design for puppet issue. Scott No 9NB74, Yvert No 335. 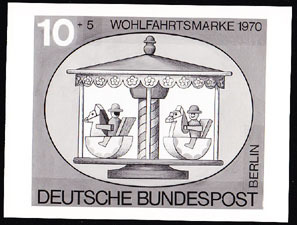 4312 EP GERMANY (Berlin) (1970) Puppets on carousel*. Photo essay (See Note) of unaccepted design for puppet issue. Scott No 9NB74, Yvert No 335. 4313 EP GERMANY (Berlin) (1970) Puppets playing clarinet*. Photo essay (See Note) of unaccepted design for puppet issue. Scott No 9NB74, Yvert No 335. 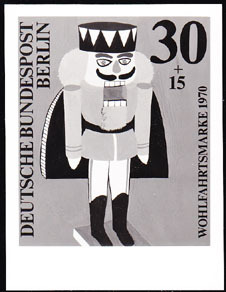 4314 EP GERMANY (Berlin) (1970) Jumping jack in uniform*. Photo essay (See Note) of unaccepted design for puppet issue. Scott No 9NB74, Yvert No 335. 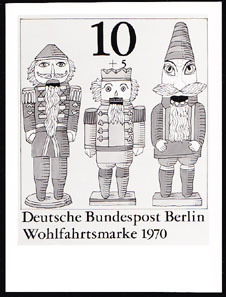 4315 EP GERMANY (Berlin) (1970) Nutcracker puppet*. Photo essay (See Note) of unaccepted design for puppet issue. Scott No 9NB76, Yvert No 337. 4316 EP GERMANY (Berlin) (1970) Wooden toy family in carriage*. Photo essay (See Note) of unaccepted design for puppet issue. Scott No 9NB76, Yvert No 337. 4317 EP GERMANY (Berlin) (1970) Woman puppet on carousel horse*. Photo essay (See Note) of unaccepted design for puppet issue. Scott No 9NB77, Yvert No 338. 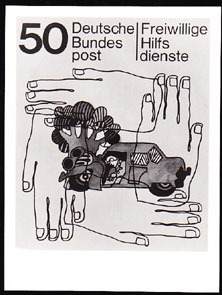 4369 EP GERMANY (1970) Hands*. Patient in hospital bed with EKG*. Photo essay (See Note) of unaccepted design honoring voluntary services. Scott No 1024, Yvert No 491. 4370 EP GERMANY (1970) Hands*. Auto crashed into tree*. Photo essay (See Note) of unaccepted design honoring voluntary services. Scott No 1026, Yvert No 493. 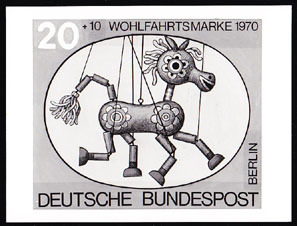 4423 EP GERMANY (Berlin) (1970) Colorful horse puppet*. Photo essay (See Note) of unaccepted design for puppet issue. Scott No 9NB75, Yvert No 336. 4604 EP EAST GERMANY (1970) Lenin statue*. Imperforate phase proof pair with gutter in final colors. Scott No 1191, Yvert No 1253. 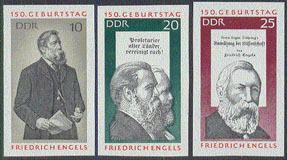 4605 EP EAST GERMANY (1970) Friedrich Engels*. Imperforate phase proof pair with gutter in final colors. Scott No 1248, Yvert No 1313. 4606 EP EAST GERMANY (1970) Engels*. Marx*. Set of 3 imperforate phase proofs in final colors. Scott Nos 1248-50, Yvert Nos 1313-5. 4607 EP EAST GERMANY (1970) Engels*. Polemic against Dühring*. Imperforate phase proof pair with gutter in final colors. Scott No 1250, Yvert No 1315. 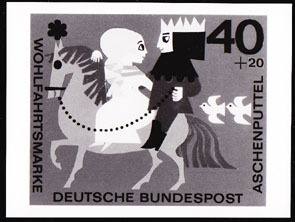 4740 EP GERMANY (1970) Baron von Munchhausen riding cannonball*. Photo essay (See Note) of unaccepted design for 150th anniversary of birth renowned for his astounding feats. Scott No 1020, Yvert No 485. 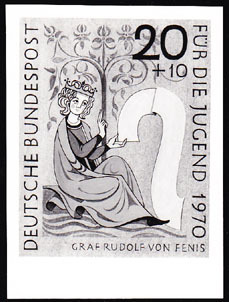 4789 EP GERMANY (Berlin) (1970) Graf Rudolf von Fenis*. Photo essay (See Note) of unaccepted design for troubadours series benefiting youth organizations. Scott No 9NB70, Yvert No 329. 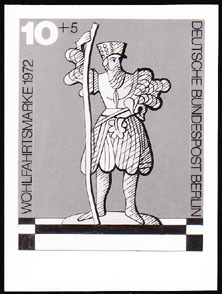 4790 EP GERMANY (Berlin) (1970) Unidentified troubadour with banner, shield and winged helmet on horseback*. Photo essay (See Note) of unaccepted design for troubadours series. Scott No 9NB72, Yvert No 330. 4791 EP GERMANY (Berlin) (1970) Unidentified troubador*. Photo essay (See Note) of unaccepted design for troubadours series benefiting youth organizations. Scott No 9NB72, Yvert No 331. 4792 EP GERMANY (Berlin) (1970) Unidentified troubadour with banner on horseback*. Photo essay (See Note) of unaccepted design for troubadours series. Scott No 9NB72, Yvert No 330. 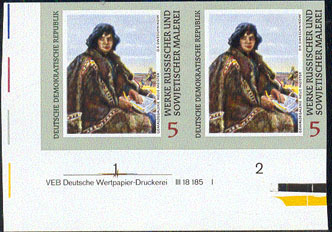 4793 EP GERMANY (Berlin) (1970) Wolfram von Eschenbach*. Photo essay (See Note) of accepted design for troubadours series benefiting youth organizations. Scott No 9NB73, Yvert No 332. 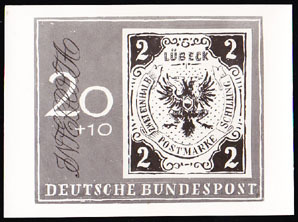 Similar to the regular Germany issue -- only the value and position of the lettering were changed. 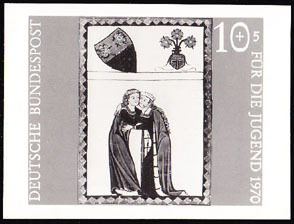 4794 EP GERMANY (1970) Albrecht von Johannsdorf*. Photo essay (See Note) of unaccepted design for troubadours series benefiting youth organizations. Scott No B455, Yvert No 475. 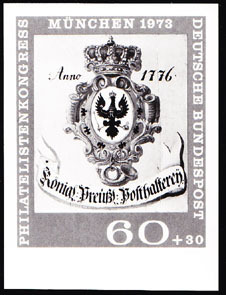 4795 EP GERMANY (1970) Graf Rudolf von Fenis*. Photo essay (See Note) of unaccepted design for troubadours series benefiting youth organizations. Scott No B456, Yvert No 476. 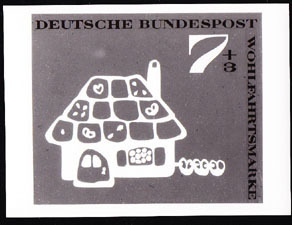 4796 EP GERMANY (1970) Burkhart von Hohenjele*. Photo essay (See Note) of unaccepted design for troubadours series benefiting youth organizations. Scott No B457, Yvert No 477. 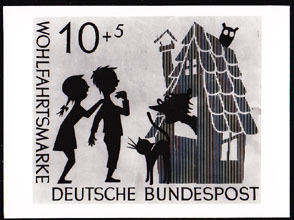 Similar design used for Berlin issue. 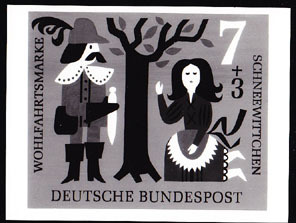 4797 EP GERMANY (Berlin) (1970) Walter von die Vogelveide*. Photo essay (See Note) of accepted design for troubadous series benefiting youth organizations. Scott No B458, Yvert No 478. Similar to regular issue -- only the value and position of the lettering were changed. 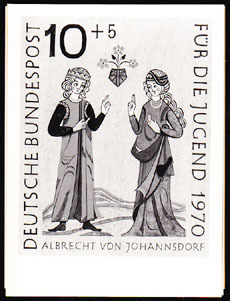 4798 EP GERMANY (1970) Albrech von Johannsesdorf*. Photo essay (See Note) of unaccepted design for troubadours series benefiting youth organizations. Scott No B458, Yvert No 478. 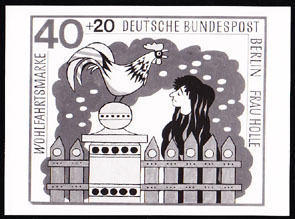 Similar design used for Berlin issue. 4833 EP EAST GERMANY (1970) The Little Trumpeter*. Imperforate phase proof in final colors. Scott No 1240, Yvert No 1304. 4944 EP EAST GERMANY (1970) Bishop's cap*. Imperforate phase proof pair in final colors. Scott No 1252, Yvert No 1317. 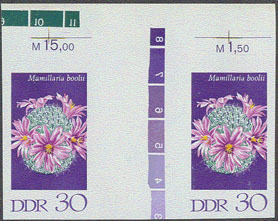 4945 EP EAST GERMANY (1970) Mamillaria booli*. Imperforate phase proof pair with gutter in final colors. Scott No 1256, Yvert No 1321. 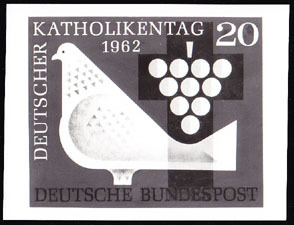 5173 EP GERMANY (1970) Cross*. Photo essay (See Note) of unaccepted design for mission to bring gospel to people. Scott No 1045, Yvert No 494. 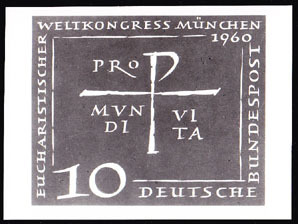 5174 EP GERMANY (1970) Cross*. 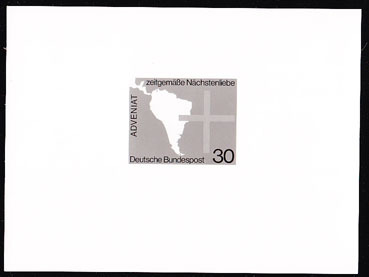 Photo essay (See Note) of unaccepted design for 83rd meeting of German Catholics. Scott No 1046, Yvert No 495. 5323 EP EAST GERMANY (1970) Women hurdlers*. Imperforate phase proof in final colors. Scott No B156, Yvert No 1274. 5363 EP EAST GERMANY (1970) Gymnast on pommel horse*. Imperforate phase proof in final colors. Scott No 1225, Yvert No 1273. 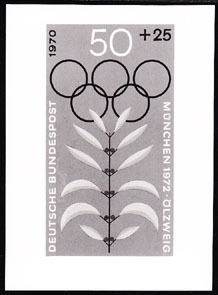 5397 EP GERMANY (1970) Laurel wreath*. 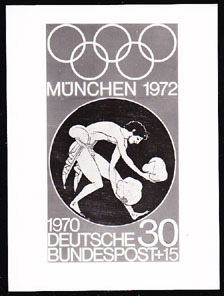 Photo essay (See Note) of unaccepted design promoting Munich Olympics. Scott No B461, Yvert No 489. 5398 EP GERMANY (1970) Olive branch*. 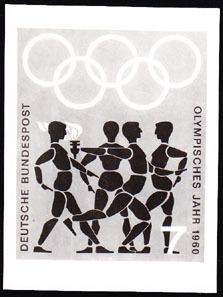 Photo essay (See Note) of unaccepted design promoting Munich Olympics. Scott No B462, Yvert No 490. 5471 EP GERMANY (1970) Starting platforms*. Pool*. 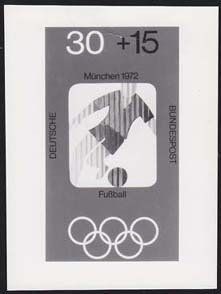 Photo essay (See Note) of unaccepted design promoting Munich Olympics. Scott No B462, Yvert No 490. 7482 EP EAST GERMANY (1970) World map*. Medal*. Fritz Heckert*. 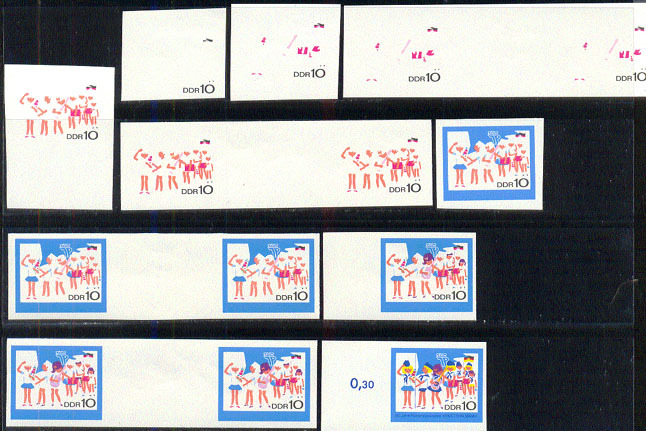 Set of 2 imperforate progressive proof sequences including final colors. German Trade Unions. Scott Nos 1208-9, Yvert Nos 1268-9. 7556 EP EAST GERMANY (1970) Compass*. Topographic map*. 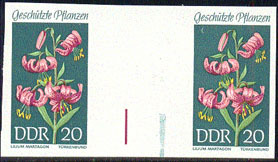 Imperforate proof pair. Scott No 1232. World Orienting Championship. 7901 EP EAST GERMANY (1970) Orchid cactus*. Imperforate phase proof in final colors. Scott No 1251, Yvert No 1316. 7941 EP EAST GERMANY (1970) Traffic policeman on motorcycle*. Imperforate phase proof pair in final colors. Scott No 1210, Yvert No 1293. 7942 EP EAST GERMANY (1970) Policewoman talking to children*. Set of 5 imperforate progressive proofs including final colors. Scott No 1211, Yvert No 1294. 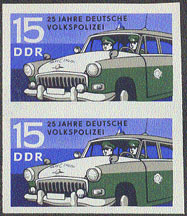 7943 EP EAST GERMANY (1970) Volga police car*. 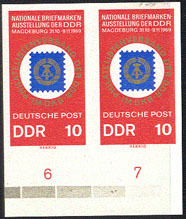 Imperforate proof pair. Scott No 1212, Yvert No 1295. Partially cut between pair. 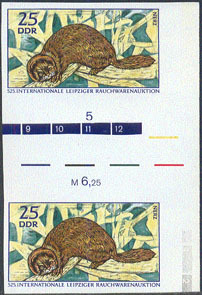 9066 EP EAST GERMANY (1970) Mink*. Set of 5 imperforate progressive proofs. 525th International Fur Auctions. Scott No 1174, Yvert No 1236. 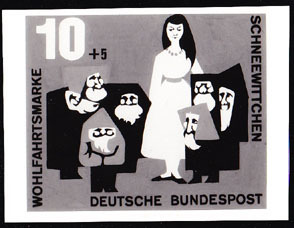 These imperforate proofs from the archives of the former East German printer are very rare (only about 10 copies exist). 9355 EP EAST GERMANY (1970) The Flutist*. Set of 2 imperforate progressive proofs. Sculpture by Ernst Barlach. Scott No 1239, Yvert No 1291. 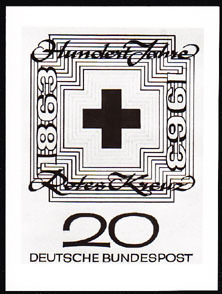 These imperforate proofs from the archives of the former East German printer are very rare (only about 10 copies exist). 9356 EP EAST GERMANY (1970) The Little Trumpeter*. Set of 3 imperforate progressive proofs. Scott No 1240, Yvert No 1304. 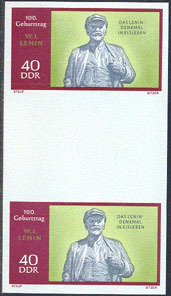 These imperforate proofs from the archives of the former East German printer are very rare (only about 10 copies exist). 10216 EP EAST GERMANY (1970) Sea Kale*. Set of 4 imperforate progressive proofs. Protected plants series. Scott No 1194, Yvert No 1255. 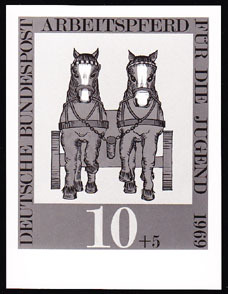 These imperforate proofs from the archives of the former East German printer are very rare (only about 10 copies exist). 10217 EP EAST GERMANY (1970) European pasqueflower*. Set of 4 imperforate progressive proofs. Protected plants series. Scott No 1195, Yvert No 1256. 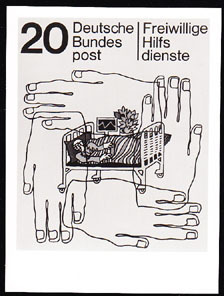 These imperforate proofs from the archives of the former East German printer are veryrare (only about 10 copies exist). 10218 EP EAST GERMANY (1970) Round-leaved wintergreen*. Set of 4 imperforate progressive proofs. Protected plants series. Scott No 1199, Yvert No 1260. 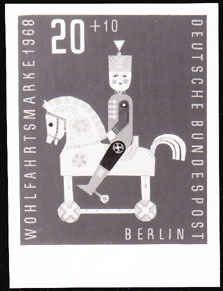 These imperforate proofs from the archives of the former East German printer are very rare (only about 10 copies exist). 10893 EP EAST GERMANY (1970) Hegel*. Imperforate proof. Scott No 1171, Yvert No 1233. 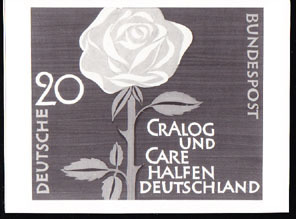 These imperforate proofs from the archives of the former East German printer are very rare (only about 10 copies exist). 10922 EP EAST GERMANY (1970) Bishop's Cap*. Set of 4 imperforate progressive proofs. Flowering cacti-Astrophytum myriostigma*. Scott No 1252, Yvert No 1317. 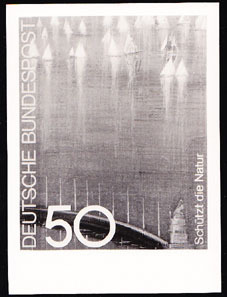 These imperforate proofs from the archives of the former East German printer are very rare (only about 10 copies exist). 10923 EP EAST GERMANY (1970) Mamillaria boolii*. Set of 4 imperforate progressive proofs. Flowering cacti*. Scott No 1256, Yvert No 1321. 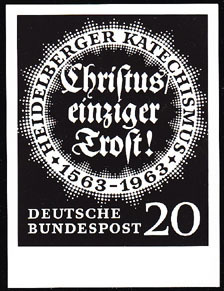 These imperforate proofs from the archives of the former East German printer are very rare (onlyabout 10 copies exist). 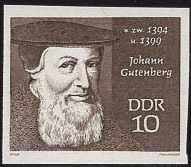 11016 EP EAST GERMANY (1970) Gutenberg*. Imperforate proof. Scott No 1167, Yvert No 1229. 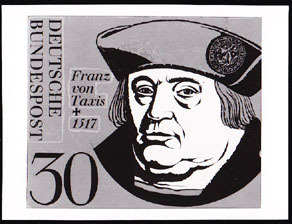 These imperforate proofs from the archives of the former East German printer are very rare (only about 10 copies exist). 11326 EP EAST GERMANY (1970) Gymnast*. Set of 3 imperforate progressive proofs. 3rd Youth Spartakaiad. Scott No 1225, Yvert No 1273. 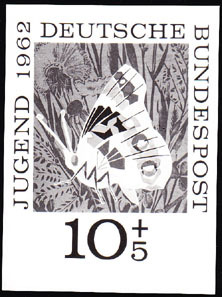 These imperforate proofs from the archives of the former East German printer are very rare (only about 10 copies exist). 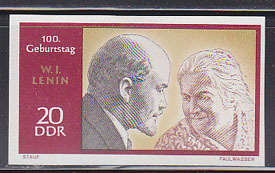 16541 EP EAST GERMANY (1970) Lenin*. Clara Zetkin*. Imperforate phase proof in final colors. Scott No 1189, Yvert No 1251. 373 EP EAST GERMANY (1971) Old library*. 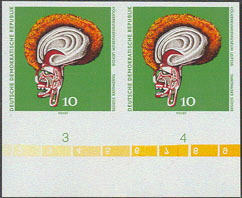 Imperforate phase proof in issued colors. Scott No 1289, Yvert No 1353. 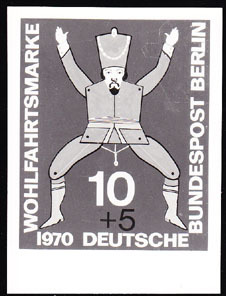 1016 EP EAST GERMANY (1971) Hoyerswerda dance costume*. Set of 4 imperforate progressive proofs including final colors. Scott No 1295, Yvert No 1360. 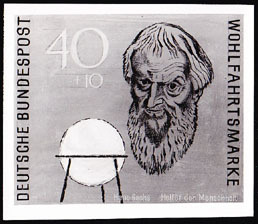 1684 EP EAST GERMANY (1971) Rudolf Virchow*. Imperforate phase proof. Considered the father of pathology. Scott No 1274a, Yvert No 1397. 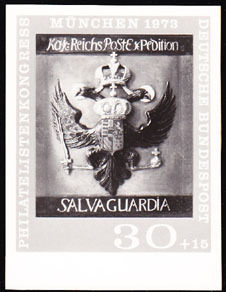 1757 EP EAST GERMANY (1971) New Guard Memorial*. Imperforate phase proof with partial colors. Scott No 1291, Yvert No 1355. 3028 EP EAST GERMANY (1971) Mother & Child*. Farmers*. 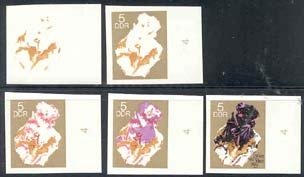 Set of 5 imperforate phase proofs showing partial and final colors. Vietnam War Relief. Scott No B161, Yvert No 1385. 3213 EP EAST GERMANY (1971) Militiaman*. Brandenburg gate*. Set of 4 imperforate phase proofs showing partial and final colors. 10 Years of Berlin Wall. Scott No 1316, Yvert No 1381. 3214 EP EAST GERMANY (1971) Buildings*. Brandenburg gate*. 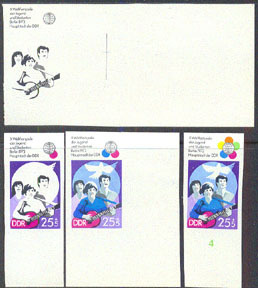 Set of 4 imperforate phase proofs showing partial and final colors. 10 Years of Berlin Wall. Scott No 1317, Yvert No 1382. 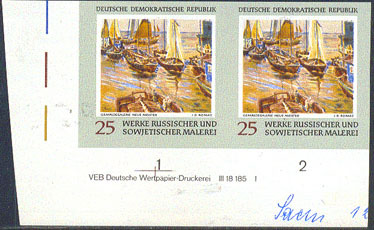 3247 EP GERMANY (1971) Durer's signature*. 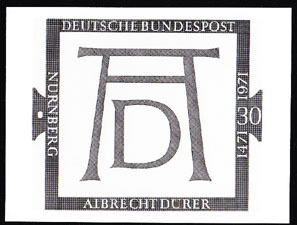 Photo essay (See Note) of unaccepted design for 500th anniversary of birth of Albrecht Durer. Scott No 1070, Yvert No 541. 3308 EP GERMANY (1971) Elliptic orbit*. Photo essay (See Note) of unaccepted design for 400th anniversary of Kepler's birth. Scott No 1072, Yvert No 549. 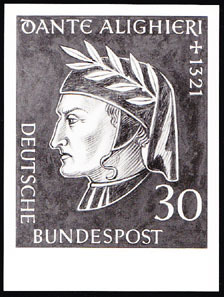 3357 EP GERMANY (1971) Dante Alighieri*. Photo essay (See Note) of unaccepted design for 650th anniversary of death. Scott No 1073, Yvert No 549. 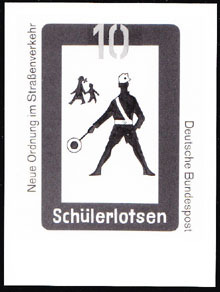 3404 EP GERMANY (1971) School crossing guard*. Photo essay (See Note) for final accepted design from new traffic rules series. Scott No 1055, Yvert No 528. 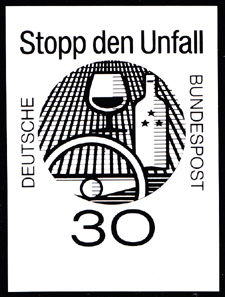 3405 EP GERMANY (1971) STOP sign*. Photo essay (See Note) from new traffic rules series. Same as final design except position of lettering changed. Scott No 1057, Yvert No 530. 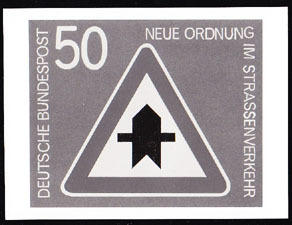 3406 EP GERMANY (1971) Priority sign*. Photo essay (See Note) from new traffic rules series. Identical to final design! Scott No 1057, Yvert No 530. 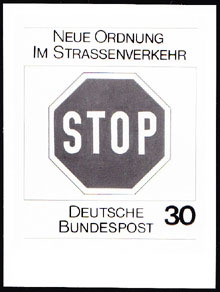 3407 EP GERMANY (1971) Priority sign*. Photo essay (See Note) from new traffic rules series. Scott No 1057, Yvert No 530. 3408 EP GERMANY (1971) Pedestrian approaching crosswalk*. Photo essay (See Note) from new traffic rules series. Scott No 1058, Yvert No 531. 3409 EP GERMANY (1971) Car with flashing lights*. Warning sign*. 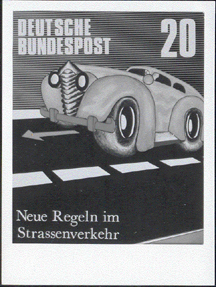 Photo essay (See Note) of unaccepted design from new traffic rules series. Scott No 1058, Yvert No 531. 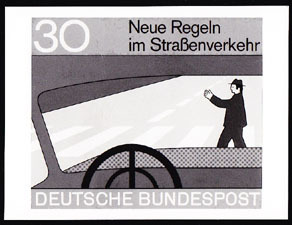 3410 EP GERMANY (1971) Pedestrian in crosswalk seen through car windshield*. 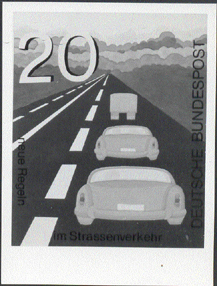 Photo essay (See Note) of unaccepted design from new traffic rules series. Scott No 1058, Yvert No 531. 3411 EP GERMANY (1971) Pedestrian in crosswalk*. Photo essay (See Note) from new traffic rules series. Same as final design except position of lettering and value changed. Scott No 1058, Yvert No 531. 3412 EP GERMANY (1971) Car with turn signal passing another car*. 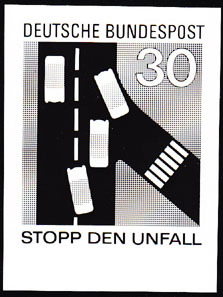 Photo essay (See Note) for unaccepted design from new traffic rules series. Scott No 1059, Yvert No 534. 3413 EP GERMANY (1971) Car signaling to pass another car*. Photo essay (See Note) for unaccepted design from new traffic rules series. Scott No 1059, Yvert No 534. 3414 EP GERMANY (1971) Car moving over to empty right lane*. Photo essay (See Note) for unaccepted design from new traffic rules series. Scott No 1061, Yvert No 536. 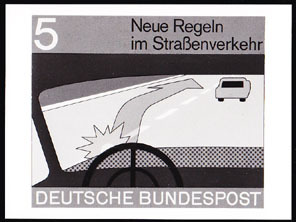 3415 EP GERMANY (1971) Car merging into traffic*. 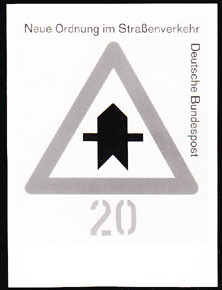 Photo essay (See Note) for unaccepted design from new traffic rules series. Scott No 1062, Yvert No 537. 3452 EP EAST GERMANY (1971) Unloading plane*. 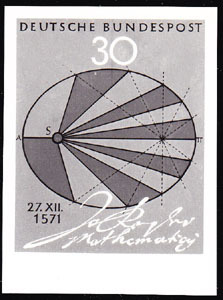 Set of 2 imperforate progressive phase proofs including final colors. Scott No B162, Yvert No 1395. 3879 EP EAST GERMANY (1971) Decorated writing box*. Set of 5 imperforate progressive proofs including final colors. Dresden works of art. Scott No 1310, Yvert No 1374. 3967 EP EAST GERMANY (1971) Explorer ship*. Imperforate phase proof in final colors. Scott No 1323, Yvert No 1391. 4059 EP GERMANY (1971) Cigarette*. House on fire*. Photo essay (See Note) of unaccepted design for accident prevention series. Scott No 1074, Yvert No 555. 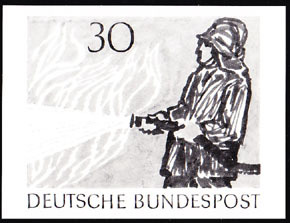 4060 EP GERMANY (1971) Fire*. Forest*. Photo essay (See Note) of unaccepted design for accident prevention series. Scott No 1074, Yvert No 555. 4319 EP GERMANY (Berlin) (1971) Toy teddy bear on swing*. Photo essay (See Note) of unaccepted design for wooden toy issue. Scott No 9NB79, Yvert No 374. 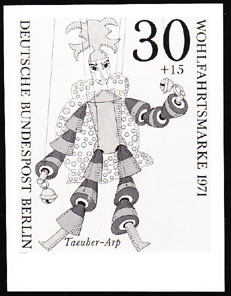 4320 EP GERMANY (Berlin) (1971) Marionette with bells*. Photo essay (See Note) of unaccepted design for wooden toy issue. Scott No 9NB85, Yvert No 337. 4608 EP EAST GERMANY (1971) Franz Mehring*. Imperforate phase proof pair in final colors. Scott No 1274, Yvert No 1341. 4615 EP EAST GERMANY (1971) Dancer's Mask*. Imperforate phase proof pair in final colors. Mask from South Sea Islands - Leipzig Ethnological Museum. Scott No 1258, Yvert No 1322. 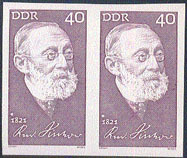 4651 EP EAST GERMANY (1971) Rudolf Virchow*. Imperforate phase proof pair in final colors. Considered the father of pathology. Scott No 1274a, Yvert No 1397. 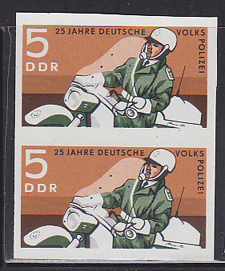 4730 EP EAST GERMANY (1971) Soldier*. Imperforate phase proof pair with gutter in final colors. 15th anniversary of People's Army. Scott No 1278, Yvert No 1334. 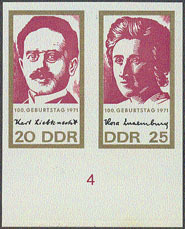 4929 EP EAST GERMANY (1971) Karl Liebknecht*. Rosa Luxemburg*. Imperforate phase proof pair in final colors. Founders of Spartacist Movement. Scott Nos 1276-7, Yvert Nos 1335-6. 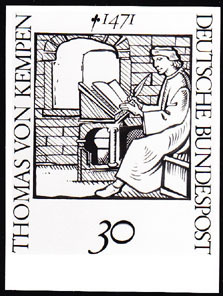 5178 EP GERMANY (1971) Thomas à Kempis*. Photo essay (See Note) of unaccepted design for 500th anniversary of death of author of "The Imitation of Christ". Scott No 1066, Yvert No 540. 5210 EP EAST GERMANY (1971) St. George Pendant*. Set of 5 imperforate progressive proofs including final colors. Dresden works of art. Scott No 1310, Yvert No 1374. 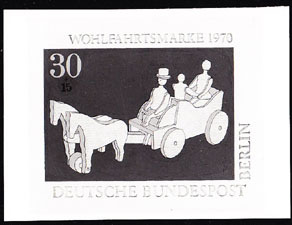 5399 EP GERMANY (1971) Sprinters*. 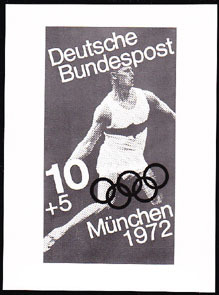 Photo essay (See Note) of unaccepted design promoting Munich Olympics. Scott No B475, Yvert No 547. 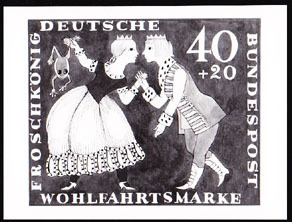 5494 EP GERMANY (1971) Early German stamp*. 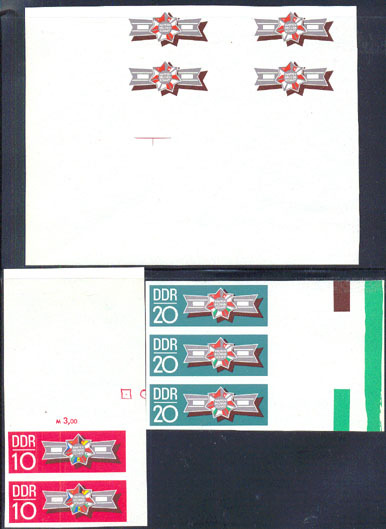 Photo essay (See Note) of unaccepted design for 100th anniversary of German Empire. Scott No 1052, Yvert No 522. 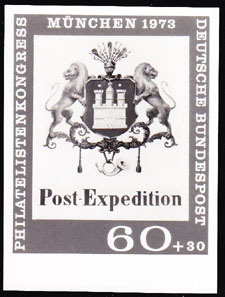 5676 EP EAST GERMANY (1971) Upraised arms*. Set of 3 imperforate progressive proofs including final colors. Fight against Racism. Scott No 1326, Yvert No 1392. 9474 EP EAST GERMANY (1971) Surveyor's Carriage*. Set of 2 imperforate progressive proofs. Scott No 1329, Yvert No 1394. 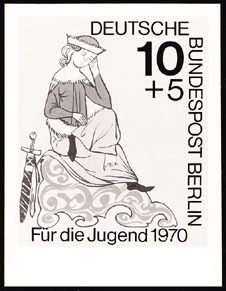 These imperforate proofs from the archives of the former East German printer are very rare (only about 10 copies exist). 9824 EP EAST GERMANY (1971) Jaguar*. Set of 3 imperforate progressive proofs. Leipzig Ethnological Museum. Clay figurine from Mexico. Scott No 1261, Yvert No 1325. 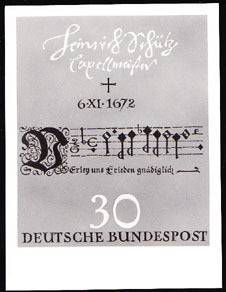 These imperforate proofs from the archives of the former East Germanprinter are very rare (only about 10 copies exist). 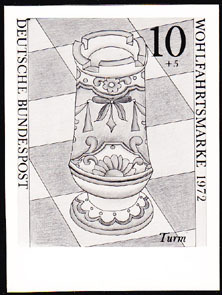 9838 EP EAST GERMANY (1971) Tankard - Nuremberg*. Set of 4 imperforate progressive proofs. Dresden works of art. Scott No 1308, Yvert No 1372. 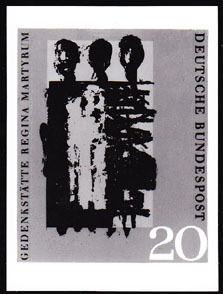 These imperforate proofs from the archives of the former East German printer are very rare(only about 10 copies exist). 10327 EP EAST GERMANY (1971) Women* at barricade*. Set of 3 imperforate progressive proofs. 100th anniversary of Paris Commune. Place Blanche defended by women. Scott No 1282, Yvert No 1346. 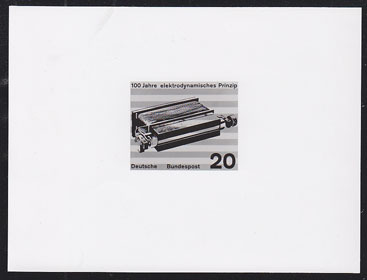 These imperforate proofs from the archivesof the former East German printer are very rare (only about 10 copies exist). 10328 EP EAST GERMANY (1971) Men with flags*. Set of 3 imperforate progressive proofs. 100th anniversary of Paris Commune. Scott No 1283, Yvert No 1347. 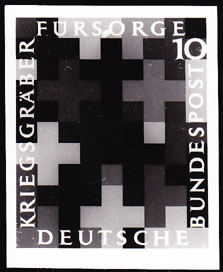 These imperforate proofs from the archives of the former East German printer are very rare (only about 10 copies exist). 10822 EP EAST GERMANY (1971a) Darbuka*. Set of 5 imperforate progressive proofs. North Africa drum. Scott No 1330, Yvert No 1398. 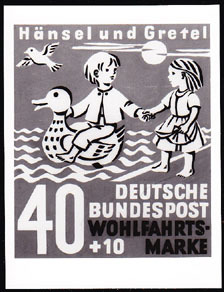 These imperforate proofs from the archives of the former East German printer are very rare (only about 10copies exist). 10823 EP EAST GERMANY (1971c) Violin*. Set of 4 imperforate progressive proofs. Marneukirchen Music Museum. Scott No 1332, Yvert No 1400. 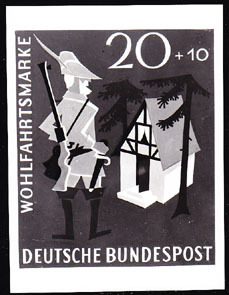 These imperforate proofs from the archives of the former East German printer are very rare (only about 10 copies exist). 10825 EP EAST GERMANY (1971e) Bagpipes*. Set of 5 imperforate progressive proofs. Bohemia. Scott No 1334, Yvert No 1402. 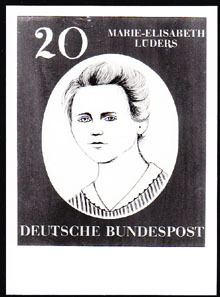 These imperforate proofs from the archives of the former East German printer are very rare (only about 10 copies exist). 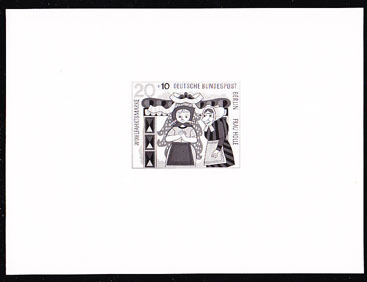 10826 EP EAST GERMANY (1971f) Kasso*. Set of 5 imperforate progressive proofs. Sudanese stringed instrument. Scott No 1335, Yvert No 1404. 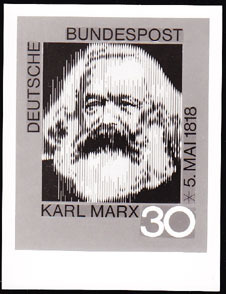 These imperforate proofs from the archives of the former East German printer are very rare (onlyabout 10 copies exist). 15033 EP GERMANY (1971) Bottle of booze*. Glass of wine*. Steering wheel*. Photo essay (See Note) of unaccepted design for Accident Prevention series. Scott No 1077, Yvert No 556. 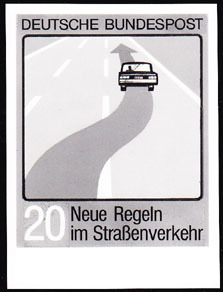 15448 EP GERMANY (1971) Car following arrow on road*. 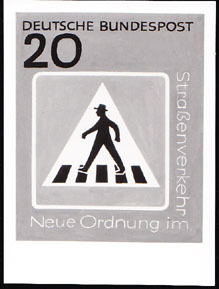 Photo essay (See Note) of unaccepted artwork for new traffic regulations issue. Measures 90 x 120 mm. Scott No 1061, Yvert No 536. 15449 EP GERMANY (1971) Line of cars driving on the right side of the road*. Photo essay (See Note) of unaccepted artwork for new traffic regulations issue. Measures 90 x 120 mm. Scott No 1061, Yvert No 536. 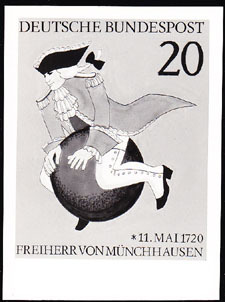 226 EP EAST GERMANY (1972) "Reclining nymph" by Cranach*. Imperforate phase proof with partial colors. Scott No 1387, Yvert No 1457. 227 EP EAST GERMANY (1972) "Young Worker Reading" by Damme*. 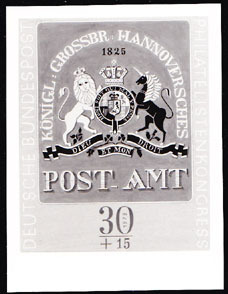 Imperforate phase proof with partial colors. Scott No 1393, Yvert No 1465. 1651 EP EAST GERMANY (1972) Anti-Fascist monument*. 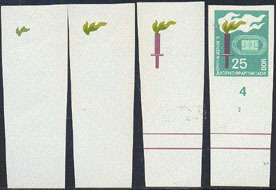 Set of 4 imperforate progressive proof pairs including final colors. Scott No 1408, Yvert No 1484. 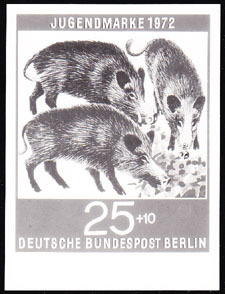 3074 EP GERMANY (Berlin) (1972) Pigs*. Photo essay (See Note) for unaccepted design of animal protection series. Scott No 9NB89, Yvert No 384. 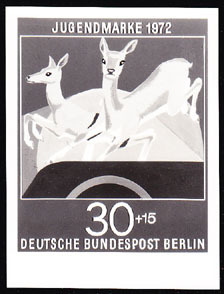 3139 EP GERMANY (Berlin) (1972) Deer leaping*. Photo essay (See Note) for unaccepted design of animal protection series. Scott No 9NB88, Yvert No 385. 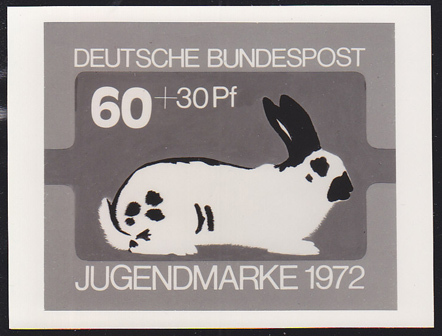 3162 EP GERMANY (1972) Rabbit*. Photo essay (See Note) for unaccepted design of animal protection series. Scott No B484, Yvert No 563. 3251 EP EAST GERMANY (1972) "Young Man" by Cranach*. Set of 5 imperforate progressive proofs including final colors. Scott No 1384, Yvert No 1456. 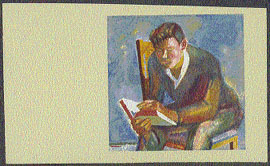 3252 EP EAST GERMANY (1972) "Young Worker Reading" by Damme*. Set of 5 imperforate phase proofs with partial and final colors. Scott No 1393, Yvert No 1465. 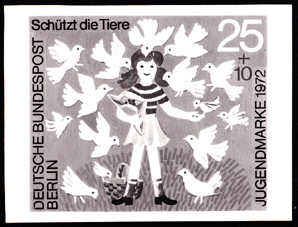 3550 EP GERMANY (BERLIN) (1972) Girl feeding birds*. Photo essay (See Note) for unaccepted design of animal protection series. Scott No 9NB89, Yvert No 384. 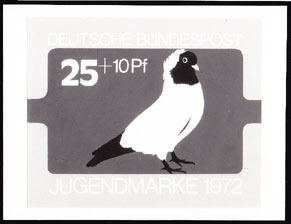 3551 EP GERMANY (1972) Bird*. Photo essay (See Note) for unaccepted design of animal protection series. Scott No B481, Yvert No 560. 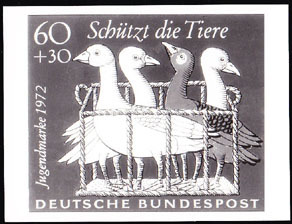 3552 EP GERMANY (1972) Geese*. Photo essay (See Note) for unaccepted design of animal protection series. Scott No B484, Yvert No 563. 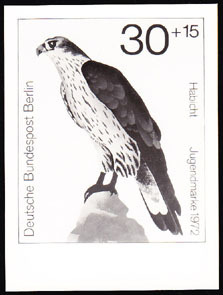 3620 EP GERMANY (Berlin) (1972) Goshawk*. Photo essay (See Note) for unaccepted design of bird series. Scott No 9NB97, Yvert No 407. 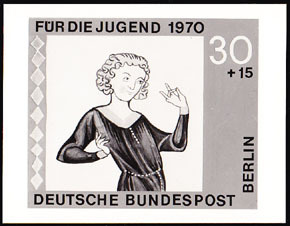 3621 EP GERMANY (Berlin) (1972) Buzzard*. Photo essay (See Note) for unaccepted design of bird series. Scott No 9NB97, Yvert No 407. 3622 EP GERMANY (Berlin) (1972) Peregrine falcon*. Photo essay (See Note) for unaccepted design of bird series. Scott No 9NB98, Yvert No 408. 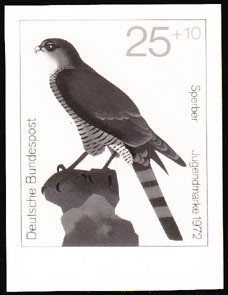 3623 EP GERMANY (Berlin) (1972) Montagu's harrier*. Photo essay (See Note) for unaccepted design of bird series. Scott No 9NB99, Yvert No 409. 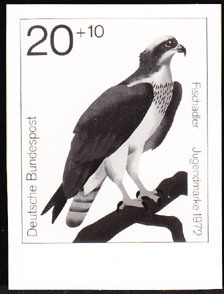 3624 EP GERMANY (1972) Osprey*. Photo essay (See Note) for unaccepted design of bird series. Scott No B481, Yvert No 560. 3625 EP GERMANY (1972) Accipiter*. Photo essay (See Note) for unaccepted design of bird series. Scott No B496, Yvert No 604. 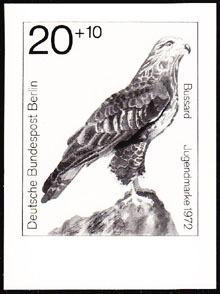 3626 EP GERMANY (1972) Red kite*. Photo essay (See Note) for unaccepted design of bird series. Scott No B498, Yvert No 606. 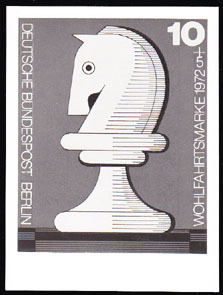 3703 EP GERMANY (Berlin) (1972) Knight with checkerboard design*. Photo essay (See Note) of unaccepted design for welfare organizations issue. Scott No 9NB92, Yvert No 400. 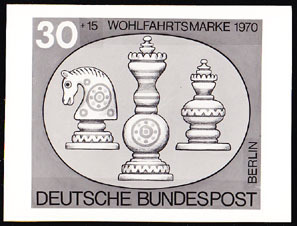 3704 EP GERMANY (Berlin) (1972) Post-modern chesspiece (pawn?)*. Photo essay (See Note) of unaccepted design for welfare organizations issue. Scott No 9NB92, Yvert No 400. Dada-esque design of Max Ernst. 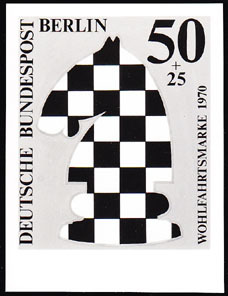 3705 EP GERMANY (Berlin) (1972) Chess figure*. Photo essay (See Note) for unaccepted design for chess series. Scott No 9NB92, Yvert No 400. 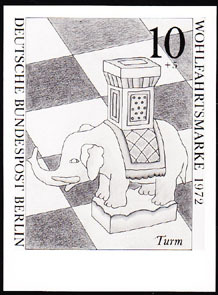 3706 EP GERMANY (Berlin) (1972) Castle on elephant*. Photo essay (See Note) for unaccepted design for chess series. Scott No 9NB92, Yvert No 400. 3707 EP GERMANY (1972) Knight with coy expression*. Photo essay (See Note) of unaccepted design for welfare organizations issue. Scott No B491, Yvert No 592. 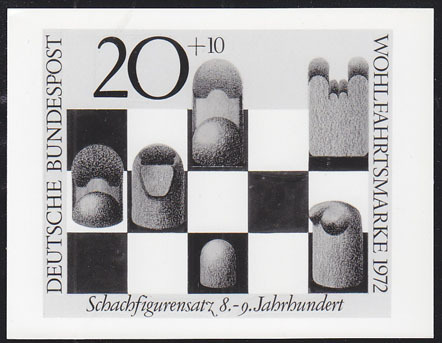 3708 EP GERMANY (1972) Pawn in shape of battle ax*. Photo essay (See Note) of unaccepted design for welfare organizations issue. Scott No B491, Yvert No 592. 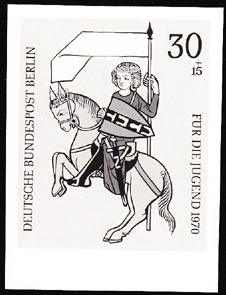 3709 EP GERMANY (1972) Medieval knight on horseback*. Photo essay (See Note) of unaccepted design for welfare organizations issue. Scott No B491, Yvert No 592. 3710 EP GERMANY (1972) Antique carved wooden knight*. Photo essay (See Note) of unaccepted design for welfare organizations issue. Scott No B491, Yvert No 592. 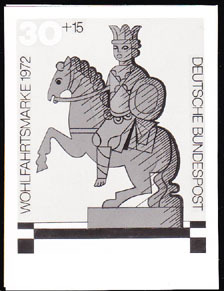 3711 EP GERMANY (1972) Antique knight on horse*. Photo essay (See Note) of unaccepted design for welfare organizations issue. Scott No B491, Yvert No 592. 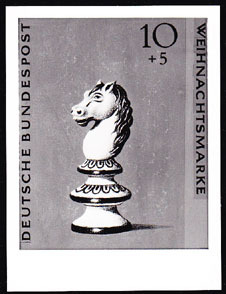 3712 EP GERMANY (1972) Modern chesspiece (knight)*. Photo essay (See Note) of unaccepted design for welfare organizations issue. Scott No B491, Yvert No 592. 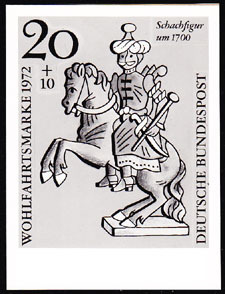 3713 EP GERMANY (1972) Turbaned knight on horseback*. Photo essay (See Note) of unaccepted design for welfare organizations issue. Scott No B491, Yvert No 592. 3714 EP GERMANY (1972) Castle (rook)*. Photo essay (See Note) of unaccepted design for welfare organizations issue. Scott No B492, Yvert No 593. 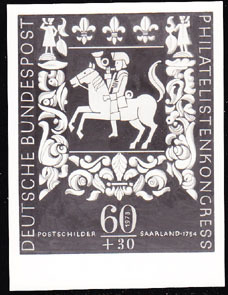 3715 EP GERMANY (1972) Intricate rococo castle (rook)*. Photo essay (See Note) of unaccepted design for welfare organizations issue. Scott No B492, Yvert No 593. 3716 EP GERMANY (1972) Bishop in form of Orthodox church*. Photo essay (See Note) of unaccepted design for welfare organizations issue. Scott No B492, Yvert No 593. 3717 EP GERMANY (1972) Castle atop elephant*. Photo essay (See Note) of unaccepted design for welfare organizations issue. Scott No B492, Yvert No 593. 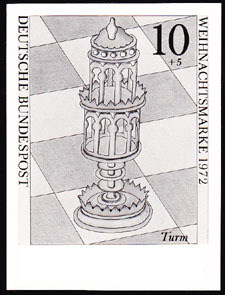 3718 EP GERMANY (1972) Intricately carved castle (rook)*. Photo essay (See Note) of unaccepted design for welfare organizations issue. Scott No B492, Yvert No 593. 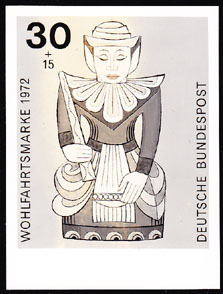 3719 EP GERMANY (1972) Queen in fancy dress with scepter*. Photo essay (See Note) of unaccepted design for welfare organizations issue. Scott No B493, Yvert No 594. 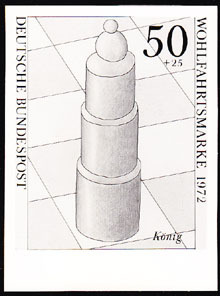 3720 EP GERMANY (1972) Chess piece (queen or pawn)*. Photo essay (See Note) of unaccepted design for welfare organizations issue. Scott No B493, Yvert No 594. 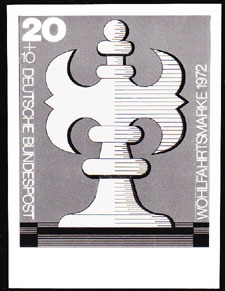 3721 EP GERMANY (1972) "Bauhaus" chess pieces on board*. Photo essay (See Note) of unaccepted design for welfare organizations issue. Scott No B494, Yvert No 595. 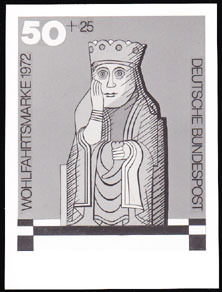 3722 EP GERMANY (1972) King pondering his fate*. Photo essay (See Note) of unaccepted design for welfare organizations issue. Scott No B494, Yvert No 595. 3723 EP GERMANY (1972) Modernistic king*. Photo essay (See Note) of unaccepted design for welfare organizations issue. Scott No B494, Yvert No 595. 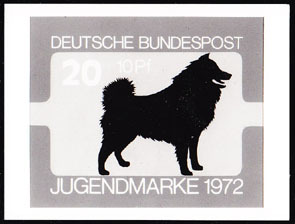 3926 EP GERMANY (1972) Dog*. Photo essay (See Note) for unaccepted design of animal protection series. Scott No B481, Yvert No 560. 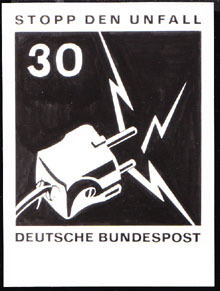 3949 EP GERMANY (1972) Defective plug*. Photo essay (See Note) of unaccepted design for accident prevention series. Scott No 1079, Yvert No 575. 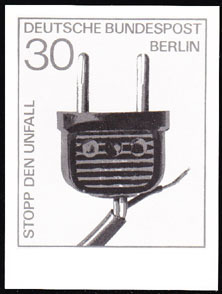 3950 EP GERMANY (Berlin) (1972) Defective plug*. Photo essay (See Note) of unaccepted design for accident prevention series. Scott No 9N321, Yvert No 395. 3971 EP GERMANY (1972) Clown*. 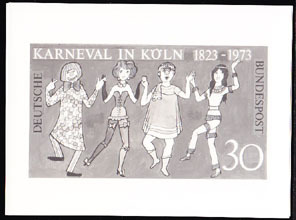 Photo essay (See Note) of unaccepted design for 150th anniversary of Cologne Carnival. Scott No 1097, Yvert No 599. 3973 EP GERMANY (1972) Clowns in fantastic garb*. 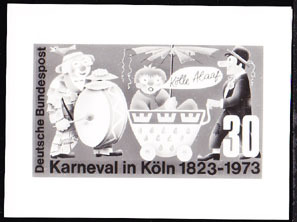 Photo essay (See Note) of unaccepted design for 150th anniversary of Cologne Carnival. Scott No 1097, Yvert No 599. 3975 EP GERMANY (1972) Clowns playing music*. 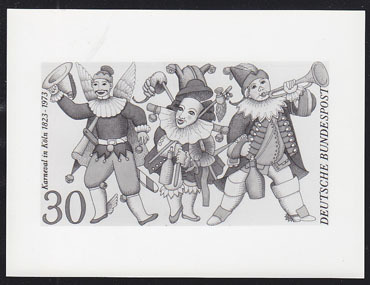 Photo essay (See Note) of unaccepted design for 150th anniversary of Cologne Carnival. Scott No 1097, Yvert No 599. 3976 EP GERMANY (1972) Dancers in festive garb*. 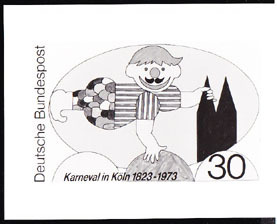 Photo essay (See Note) of unaccepted design for 150th anniversary of Cologne Carnival. Scott No 1097, Yvert No 599. 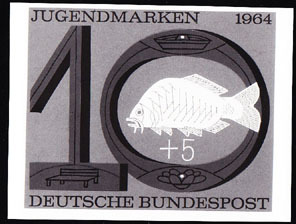 4091 EP GERMANY (Berlin) (1972) Fish*. Photo essay (See Note) for unaccepted design of animal protection series. Scott No 9NB91, Yvert No 386. 4344 EP GERMANY (1972) Hercules*. Giant hand*. Photo essay (See Note) of unaccepted design depicting one of the labors of Hercules. 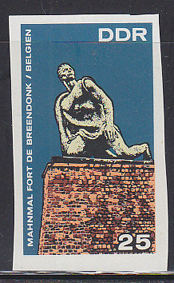 4345 EP GERMANY (1972) Geryones*. 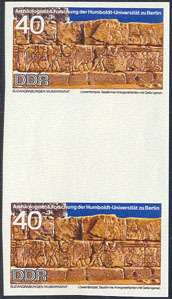 Photo essay (See Note) of unaccepted design depicting 3-bodied 4-winged giant whose cattle Hercules was sent to capture. 4371 EP GERMANY (1972) Grate protecting hand from gears*. Photo essay (See Note) of unaccepted design for accident prevention series. Scott No 1076, Yvert No 574. 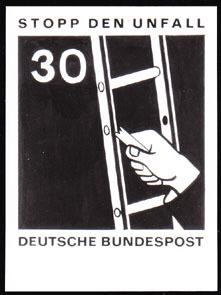 4453 EP GERMANY (1972) Hand on broken ladder*. Photo essay (See Note) of unaccepted design for accident prevention series. Scott No 1075, Yvert No 564. 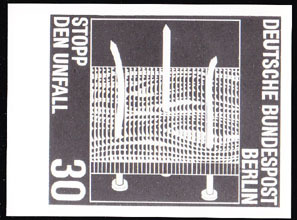 4454 EP GERMANY (Berlin) (1972) Nails sticking through board*. Photo essay (See Note) of unaccepted design for accident prevention series. Scott No 9N322, Yvert No 396. 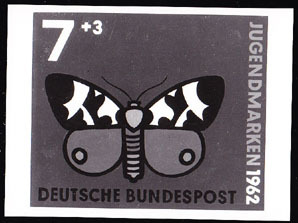 4474 EP GERMANY (Berlin) (1972) Leaf roller bug*. Photo essay (See Note) for unaccepted design of unissued insect series. 4475 EP GERMANY (1972) Forest caterpillar hunter*. 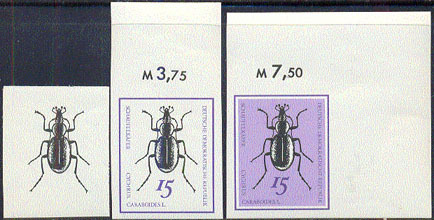 Photo essay (See Note) for unaccepted design of unissued insect series. 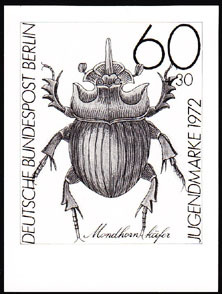 4476 EP GERMANY (Berlin) (1972) Cockchafer*. Photo essay (See Note) for unaccepted design of unissued insect series. 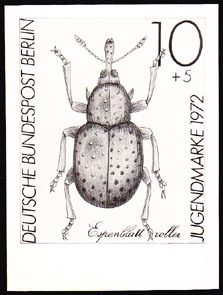 4477 EP GERMANY (Berlin) (1972) Asparagus beetle*. Photo essay (See Note) for unaccepted design of unissued insect series. 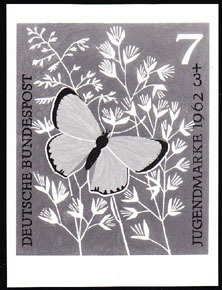 4478 EP GERMANY (1972) Rosalia longicorn*. Photo essay (See Note) for unaccepted design of unissued insect series. 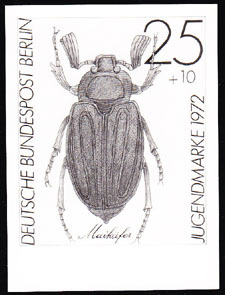 4479 EP GERMANY (Berlin) (1972) Copris lunaris*. Photo essay (See Note) for unaccepted design of unissued insect series. 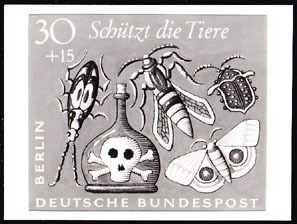 4481 EP GERMANY (Berlin) (1972) Insects*. Bottle of poison*. Photo essay (See Note) for unaccepted design of animal protection series. Scott No 9NB90, Yvert No 385. 4731 EP EAST GERMANY (1972) Target*. Military obstacle course*. 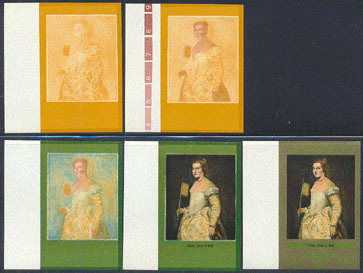 Set of 4 imperforate progressive phase proofs showing partial and final colors. Society for Sport & Technology. Scott No 1390, Yvert No 1462. 4814 EP GERMANY (1972) Musical score of Heinrich Schutz*. 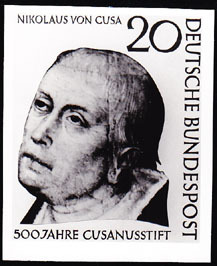 Photo essay (See Note) of unaccepted design for tricentennial of composer's death. Scott No 1096, Yvert No 591. 5193 EP GERMANY (1972) Deaconesses in religious outfits*. 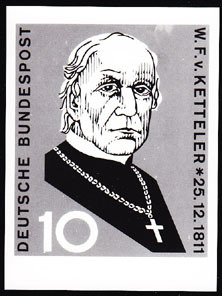 Photo essay (See Note) of unaccepted design for centenary of death of Wilhelm Lohe, founder of Missouri Synod of Lutheran church and Deaconesses Training Institute of Neuendettelstau Scott No1087, Yvert No 559. 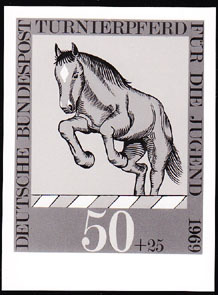 5350 EP GERMANY (1972) Boxers*. 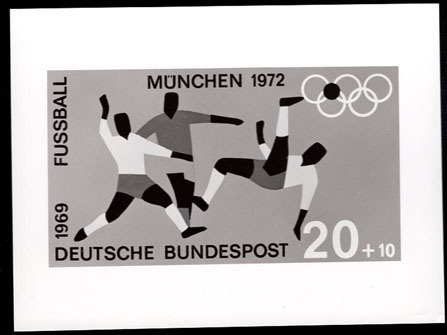 Photo essay (See Note) of unaccepted design for Munich Olympics. Scott No B490, Yvert No 580//3. 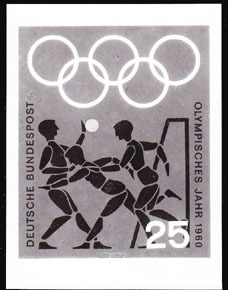 5365 EP GERMANY (1972) Gymnasts*. 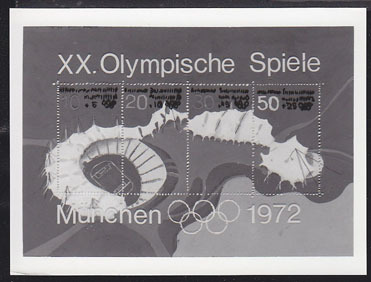 Photo essay (See Note) of unaccepted design for Munich Olympics. Scott No B486, Yvert No 571. 5404 EP GERMANY (1972) Wrestlers*. High jump*. Swimming*, Gymnastics*. 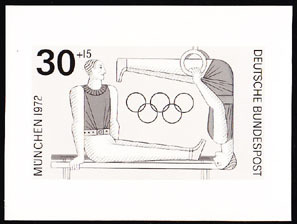 Photo essay (See Note) of unaccepted design for Munich Olympics. Scott Nos B485-8, Yvert Nos 570-3. 5405 EP GERMANY (1972) Runner*. Photo essay (See Note) of unaccepted design for Munich Olympics. Scott No B485, Yvert No 570. 5406 EP GERMANY (1972) Shot put*. 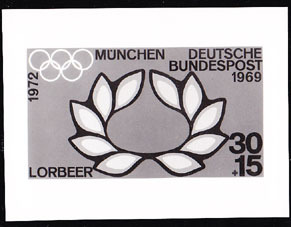 Photo essay (See Note) of unaccepted design for Munich Olympics. Scott No B485, Yvert No 570. 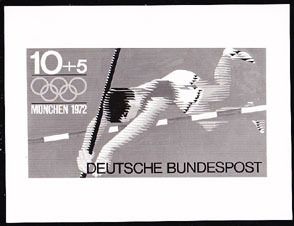 5407 EP GERMANY (1972) Pole vault*. 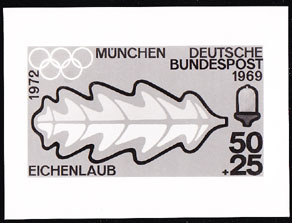 Photo essay (See Note) of unaccepted design for Munich Olympics. Scott No B485, Yvert No 570. 5408 EP GERMANY (1972) Discus*. 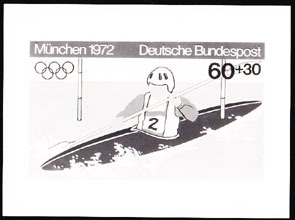 Photo essay (See Note) of unaccepted design for Munich Olympics. Scott No B485, Yvert No 570. 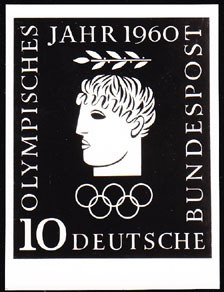 5409 EP GERMANY (1972) Greek athlete*. 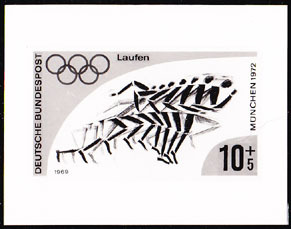 Photo essay (See Note) of unaccepted design for Munich Olympics. Scott No B485, Yvert No 570. 5410 EP GERMANY (1972) Relay race*. 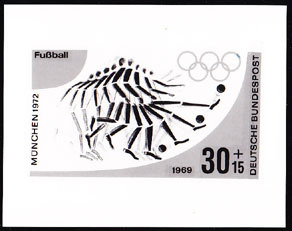 Photo essay (See Note) of unaccepted design for Munich Olympics. Scott No B485, Yvert No 570. 5411 EP GERMANY (1972) High jump*. 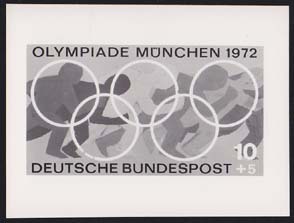 Photo essay (See Note) of unaccepted design for Munich Olympics. Scott No B485, Yvert No 570. 5412 EP GERMANY (1972) Diving*. 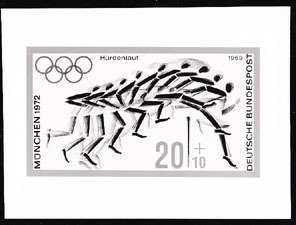 Photo essay (See Note) of unaccepted design for Munich Olympics. Scott No B486, Yvert No 571. 5413 EP GERMANY (1972) Greek athlete lifting stones*. 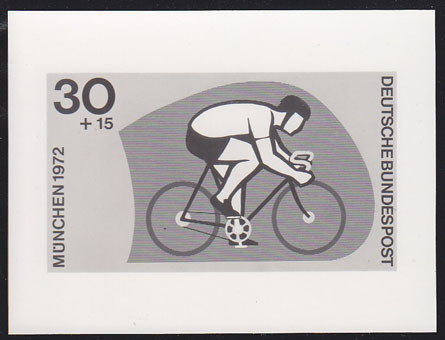 Photo essay (See Note) of unaccepted design for Munich Olympics. Scott No B487, Yvert No 572. 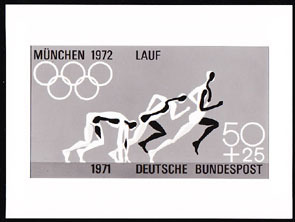 5414 EP GERMANY (1972) Hurdles*. 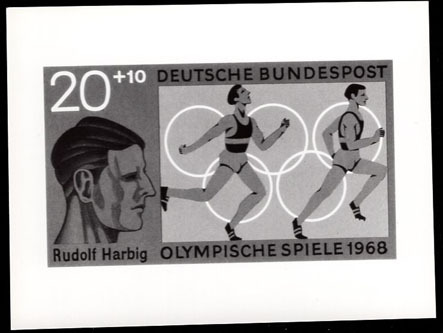 Photo essay (See Note) of unaccepted design for Munich Olympics. Scott No B487, Yvert No 572. 5415 EP GERMANY (1972) Kayaking*. 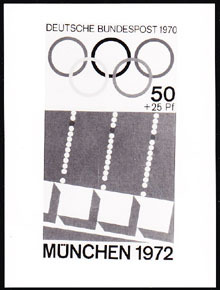 Photo essay (See Note) of unaccepted design for Munich Olympics. Scott No B488, Yvert No 573. 5416 EP GERMANY (1972) Rowing*. 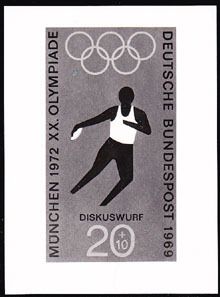 Photo essay (See Note) of unaccepted design for Munich Olympics. Scott No B488, Yvert No 573. 5459 EP GERMANY (1972) Soccer*. 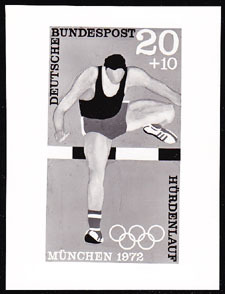 Photo essay (See Note) of unaccepted design for Munich Olympics. Scott No B485, Yvert No 570. 5460 EP GERMANY (1972) Soccer player*. 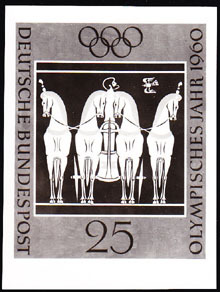 Photo essay (See Note) of unaccepted design for Munich Olympics. Scott No B490, Yvert No 580//3. 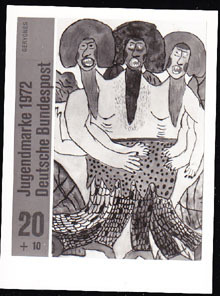 5472 EP GERMANY (1972) Swimmers*. 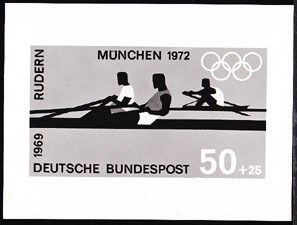 Photo essay (See Note) of unaccepted design for Munich Olympics. Scott No B488, Yvert No 573. 10287 EP EAST GERMANY (1972) Charme Rose*. Set of 5 imperforate progressive proofs. Scott No 1380, Yvert No 1450. 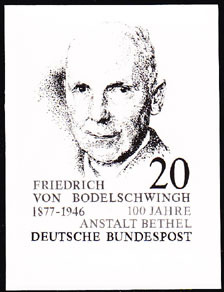 These imperforate proofs from the archives of the former East German printer are very rare (only about 10 copies exist). 10288 EP EAST GERMANY (1972) Professor Knoll Rose*. Set of 4 imperforate progressive proofs. Scott No 1383, Yvert No 1453. 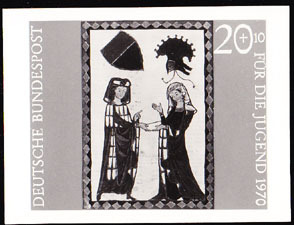 These imperforate proofs from the archives of the former East German printer are very rare (only about 10 copies exist). 11402 EP GERMANY (1972) Cycling*. 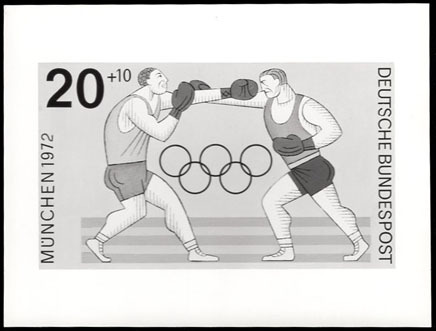 Photo essay (See Note) of unaccepted design for Munich Olympics. Scott No B486, Yvert No 571. 11403 EP GERMANY (1972) Aerial view of Munich Olympic site*. 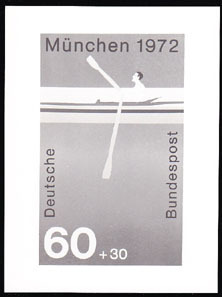 Photo essay (See Note) of unaccepted design of S/S for Munich Olympics. Scott No B489, Yvert No BF6. 16933 EP EAST GERMANY (1972) Amateur Radio transmitter*. Set of 4 imperforate progressive proofs. Society for Sport & Technology. Scott No 1391, Yvert No 1463. 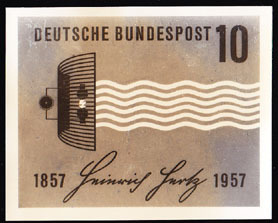 These imperforate proofs from the archives of the former East German printer are very rare (only about 10 copies exist). 1182 EP EAST GERMANY (1973) Vietnamese*. European*. World Clock*. Corner strip of 3 imperforate proofs in issued colors. Scott No 1478, Yvert No 1556. 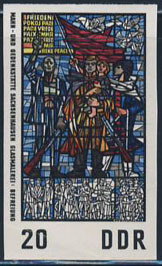 1759 EP EAST GERMANY (1973) Militia men*. Set of 4 imperforate progressive proofs, including final colors. Scott No 1488, Yvert No 1567. 1942 EP EAST GERMANY (1973) Youth playing guitar*. Youth Festival*. 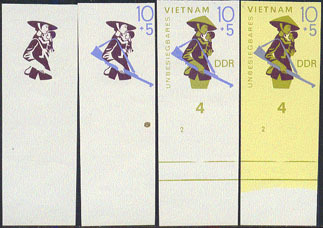 Set of 4 imperforate phase proofs including issued colors. Scott No B171, Yvert No 1528. 3254 EP EAST GERMANY (1973) "Lady in White" by Titian*. Set of 5 imperforate progressive proofs including final colors. Scott No 1500, Yvert No 1583. 3255 EP EAST GERMANY (1973) "Archimedes" by Fetti*. Set of 5 imperforate progressive proofs including final colors. Scott No 1501, Yvert No 1584. 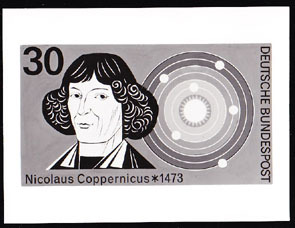 3309 EP GERMANY (1973) Copernicus*. Planetary orbits*. Photo essay (See Note) of unaccepted design for 500th anniversary of birth. Scott No 1104, Yvert No 608. 3358 EP GERMANY (1973) Text of poem*. 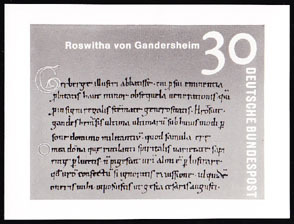 Photo essay (See Note) of unaccepted design for 100th anniversary of death of first female German poet Roswitha von Gandersheim. Scott No 1117, Yvert No 620. 4455 EP GERMANY (1973) Pliers pulling loose nail from board*. 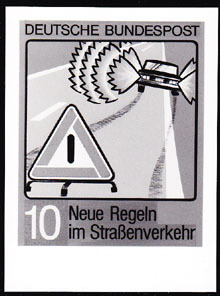 Photo essay (See Note) of unaccepted design for accident prevention series. Scott No 1080, Yvert No 576. 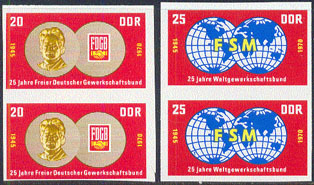 4456 EP EAST GERMANY (1973) World Trade Unions*. Globe*. Set of 4 imperforate progressive phase proofs showing partial and final colors. Scott No 1493, Yvert No 1572. 4609 EP EAST GERMANY (1973) Luis Corvalan*. Set of 3 imperforate phase proofs showing partial and final colors. Leader of Communist party in Chile. Scott No B173, Yvert No 1577. 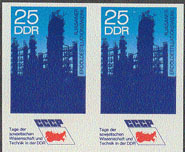 4920 EP EAST GERMANY (1973) Oil refinery*. Trade Union emblem*. Series of 4 imperforate phase proof pair including final colors. Scott No 1496, Yvert No 1576. 4921 EP EAST GERMANY (1973) Oil refinery*. Trade Union emblem*. Imperforate phase proof pair showing final colors. Scott No 1496, Yvert No 1576. 5066 EP GERMANY (1973) Ship to shore transmission*. 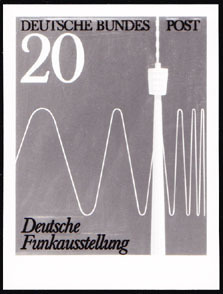 Photo essay (See Note) of unaccepted design for 50th anniversary of German broadcasting. Scott No 1127, Yvert No 635. 5067 EP GERMANY (1973) Radio control panel with dials*. 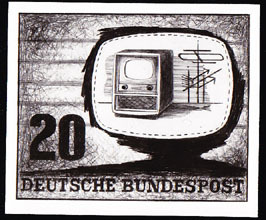 Photo essay (See Note) of unaccepted design for 50th anniversary of German broadcasting. Scott No 1127, Yvert No 635. 5284 EP EAST GERMANY (1973) Rocket launching*. Trade Union emblem*. 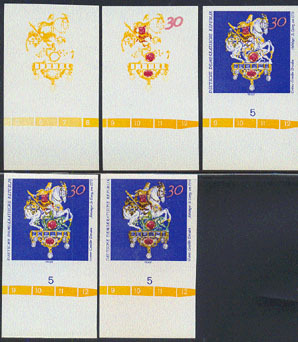 Series of 3 imperforate progressive phase proofs showing partial and final colors. Scott No 1494, Yvert No 1574. 5504 EP GERMANY (1973) Lion & Unicorn rampant*. 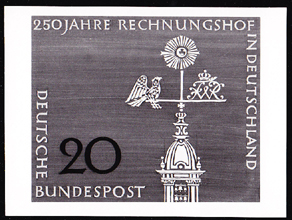 Photo essay (See Note) of unaccepted design for IBRA Munich Philatelic Congress. Scott No B500, Yvert No 616. 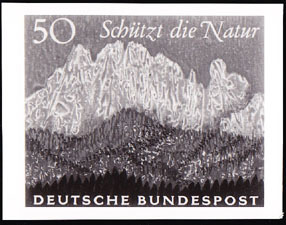 5505 EP GERMANY (1973) Lions rampant*. Castle*. 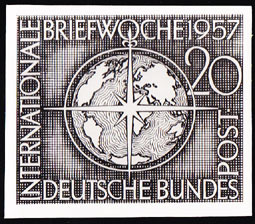 Photo essay (See Note) of unaccepted design for IBRA Munich Philatelic Congress. Scott No B500, Yvert No 616. 5506 EP GERMANY (1973) Eagle wings*. Crown*. 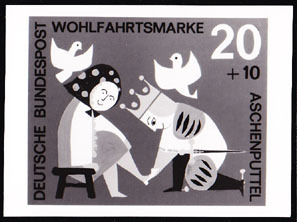 Photo essay (See Note) of unaccepted design for IBRA Munich Philatelic Congress. Scott No B500, Yvert No 616. 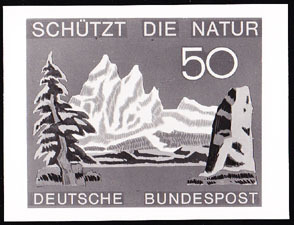 5507 EP GERMANY (1973) German Eagle in crown*. 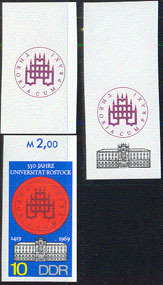 Photo essay (See Note) of unaccepted design for IBRA Munich Philatelic Congress. Scott No B501, Yvert No 617. 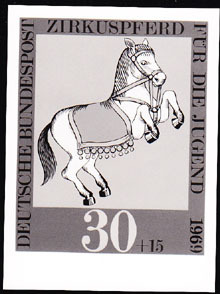 5508 EP GERMANY (1973) Postal carrier on horse back blowing horn*. 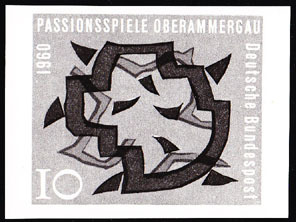 Photo essay (See Note) of unaccepted design for IBRA Munich Philatelic Congress. Scott No B501, Yvert No 617. 6025 EP EAST GERMANY (1973) Combines*. 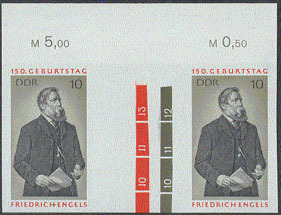 Set of 2 imperforate phase proofs in issued colors. Scott Nos 1451-2, Yvert Nos 1529-30. 7203 EP EAST GERMANY (1973) Vietnamese*. European*. World Clock*. Imperforate phase proof in issued colors. Scott No 1478, Yvert No 1556. 7204 EP EAST GERMANY (1973) Construction workers*. Valve*. Clock*. 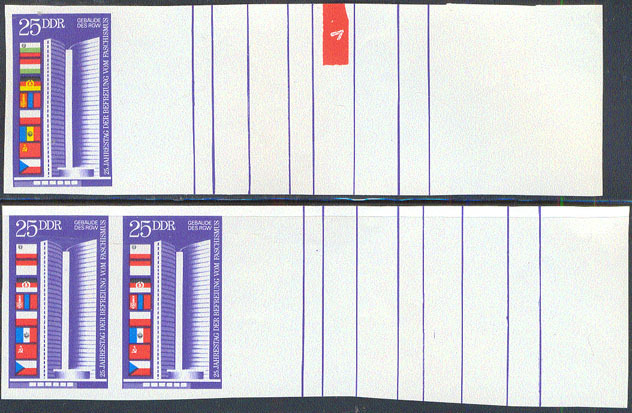 Imperforate phase proof pair in issued colors. Scott No 1479, Yvert No 1557. 7224 EP EAST GERMANY (1973) Fireworks*. TV Tower*. World clock*. Set of 8 imperforate proofs including final colors. Youth & Student Festival - Berlin. Scott No 1477, Yvert No 1555. 8546 EP EAST GERMANY (1973) World time clock*. Youth Festival*. Set of 7 mperforate proofs including final in issued colors. Scott No B170, Yvert No 1527. 1835 EP EAST GERMANY (1974) Rodophyllus sinuatus*. Set of 5 imperforate progressive proofs, including final colors. Scott No 1533, Yvert No 1613. 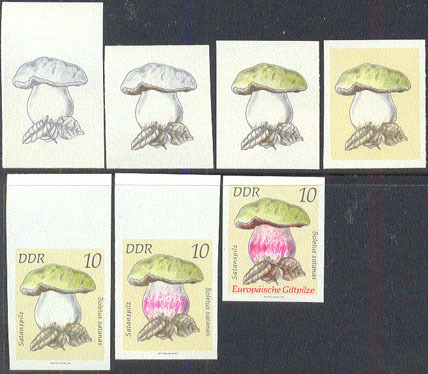 1836 EP EAST GERMANY (1974) Boletus satanas*. Set of 7 imperforate progressive proofs, including final colors. Scott No 1534, Yvert No 1614. 1837 EP EAST GERMANY (1974) Amanita pantherina*. Set of 5 imperforate progressive proofs, including final colors. Scott No 1535, Yvert No 1615. 1838 EP EAST GERMANY (1974) Gyromitra esculenta*. 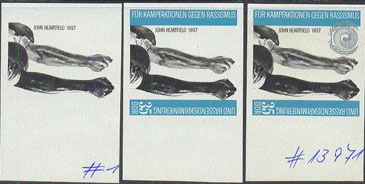 Set of 5 imperforate progressive proofs, including final colors. Scott No 1537, Yvert No 1617. 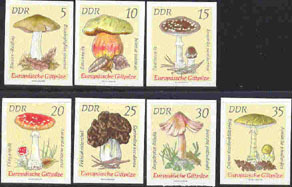 1839 EP EAST GERMANY (1974) Inocybe patouillardia*. Set of 5 imperforate progressive proofs, including final colors. Scott No 1538, Yvert No 1618. 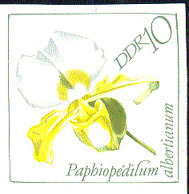 1840 EP EAST GERMANY (1974) Amanita phalloides*. Set of 5 imperforate progressive proofs, including final colors. Scott No 1539, Yvert No 1619. 8528 EP EAST GERMANY (1974) Plauen lace*. 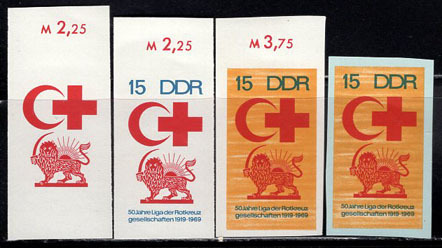 Set of 3 imperforate phase proofs including issued colors. Scott No 1564. 16686 EP EAST GERMANY (1974) Mushrooms*. 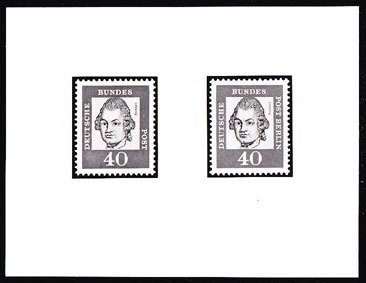 Incomplete set of 7 imperforate proofs from the archives of the East German printers (missing only the 40 pf value). Scott Nos 1533-9, Yvert Nos 1613-9. Spectacular! 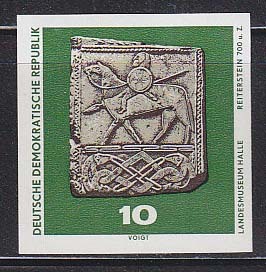 153 EP EAST GERMANY (1975) Siberian chamois*. 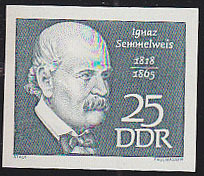 Imperforate phase proof with partial colors. Scott No 1632, Yvert No 1713. 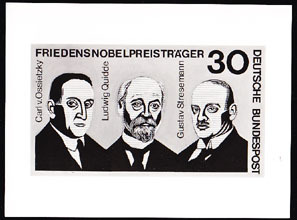 4870 EP GERMANY (1975) German winners of Nobel Peace Prize: Gustav Stresemann, Ludwig Quidde, Carl von Ossietzky*. Photo essay (See Note) of unaccepted design for M/S of 3. Scott No 1203, Yvert No BF10. 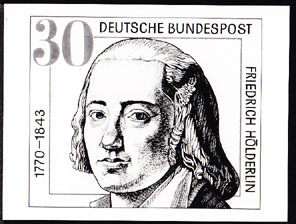 3360 EP GERMANY (1993) Friedrich Holderlin*. Photo essay (See Note) of unaccepted design for issue honoring Romantic poet. Scott No 1791, Yvert No 1511.